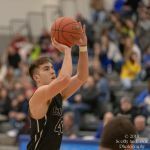 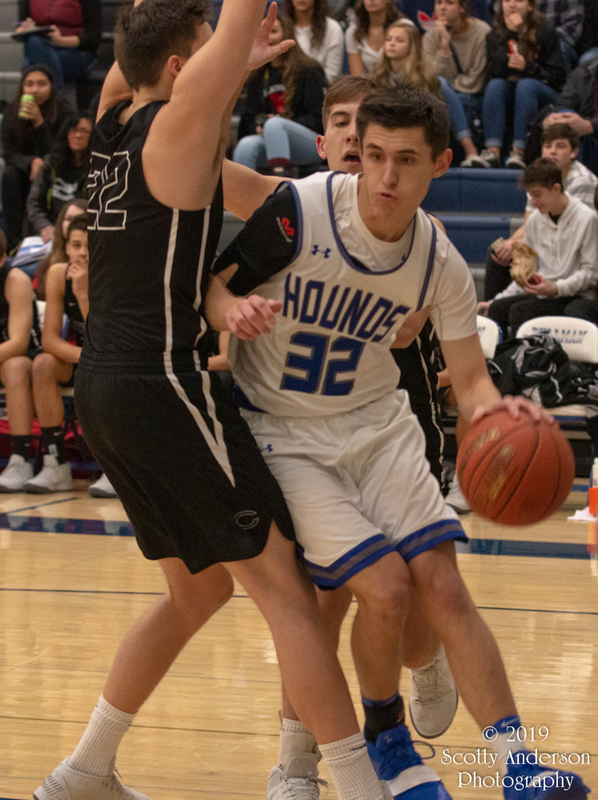 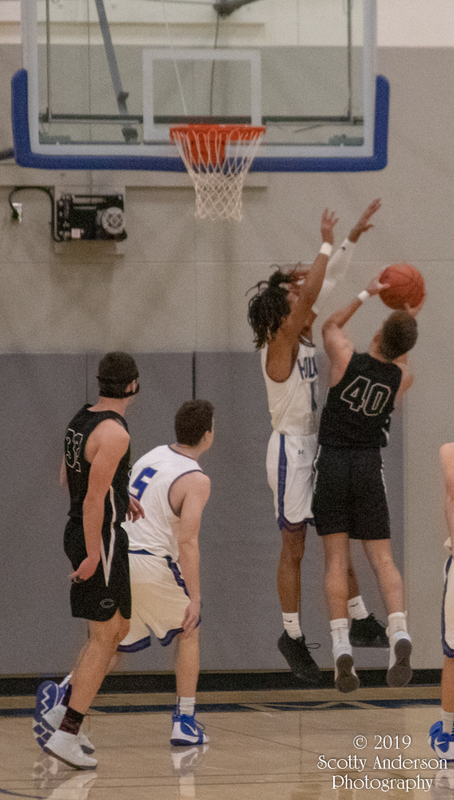 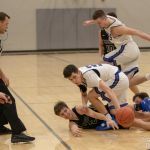 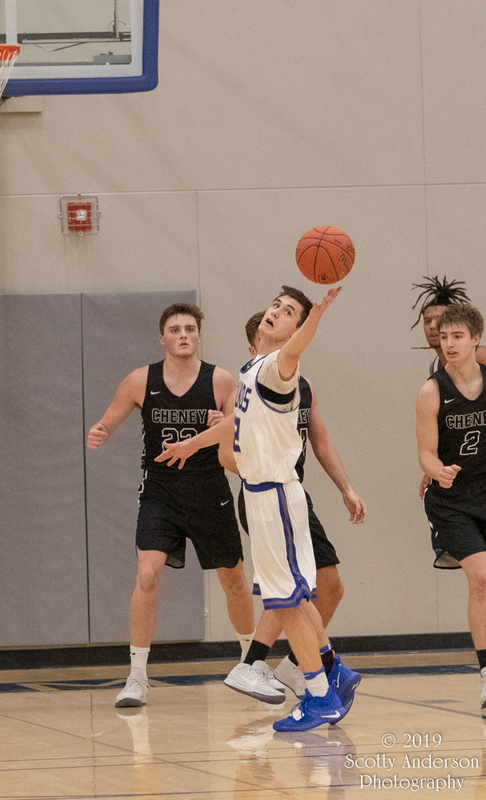 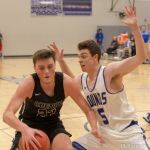 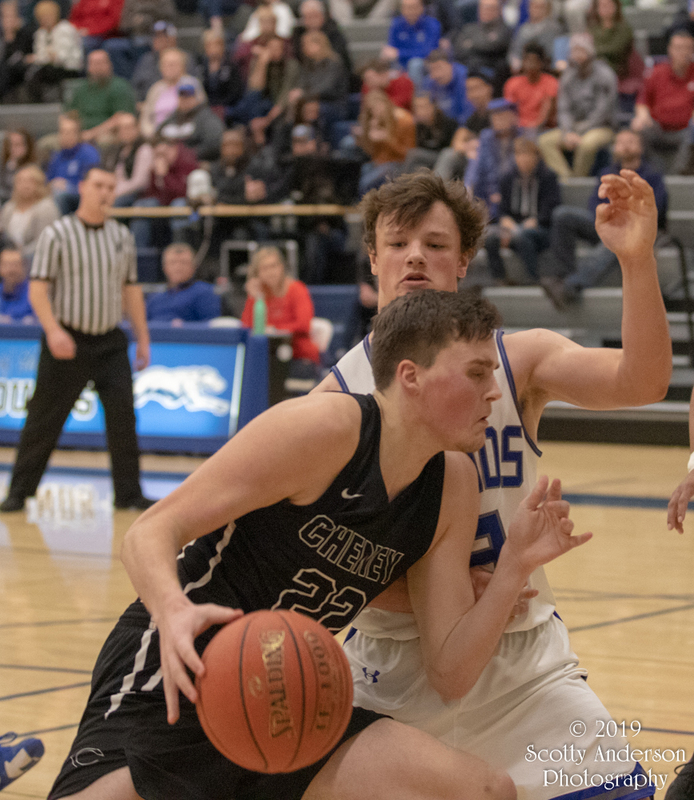 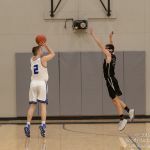 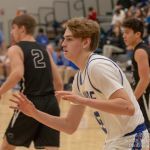 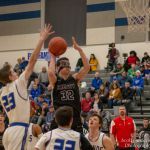 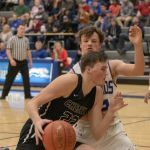 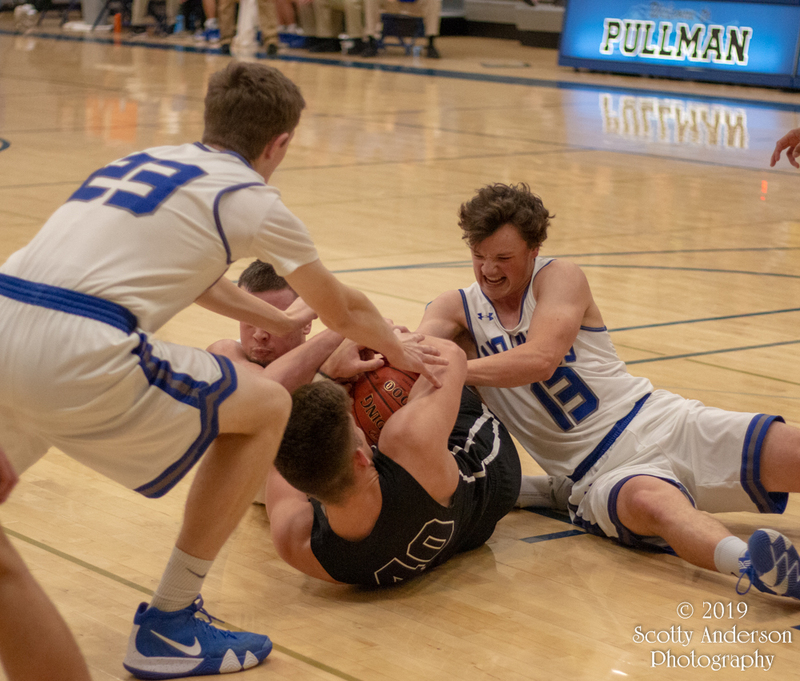 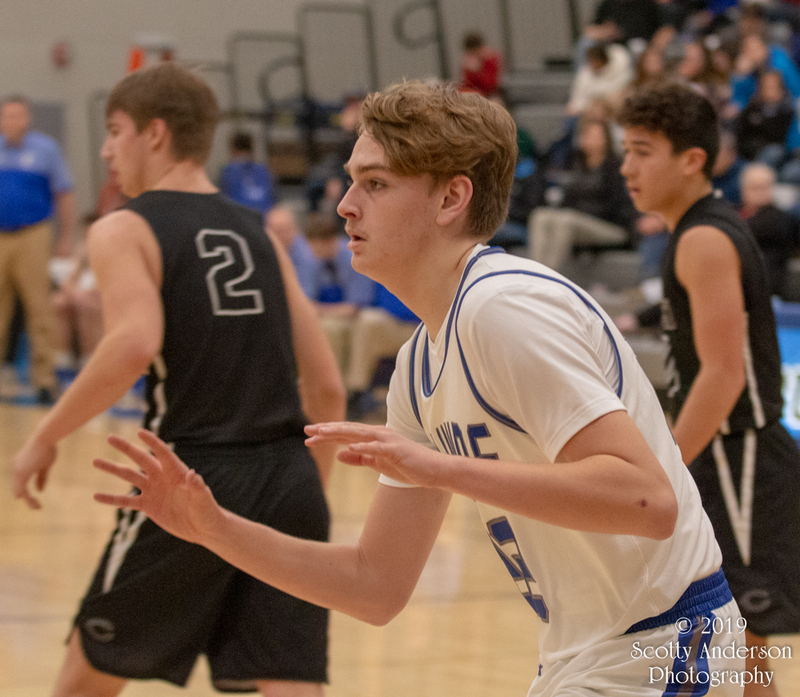 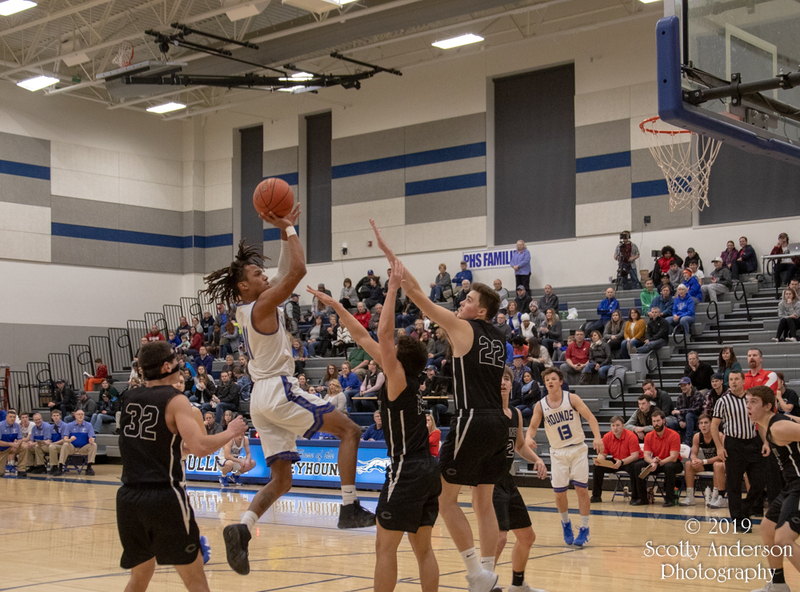 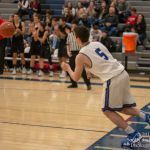 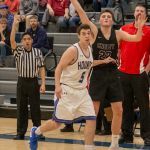 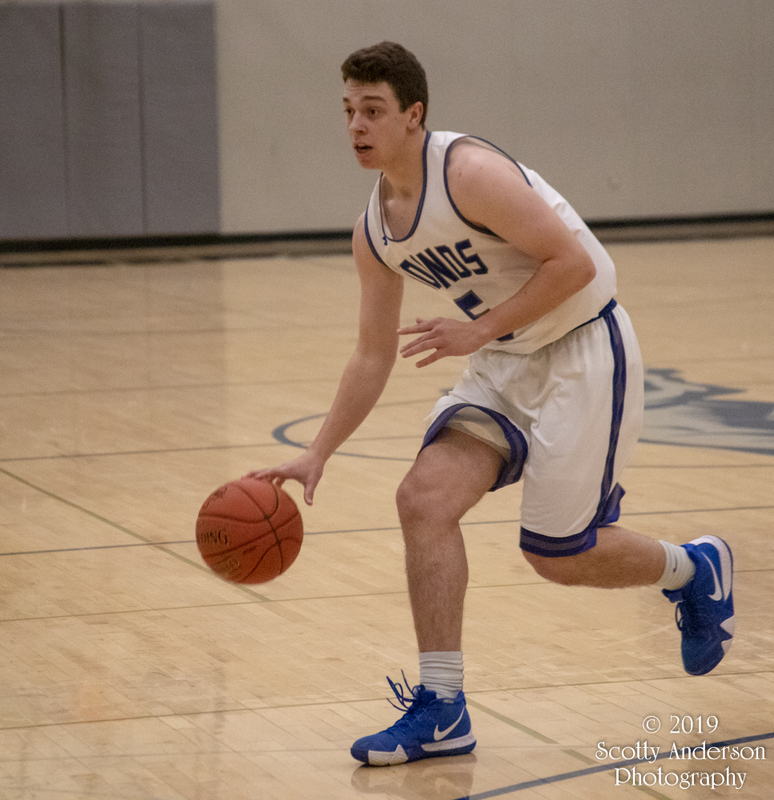 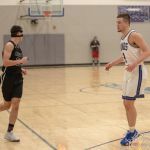 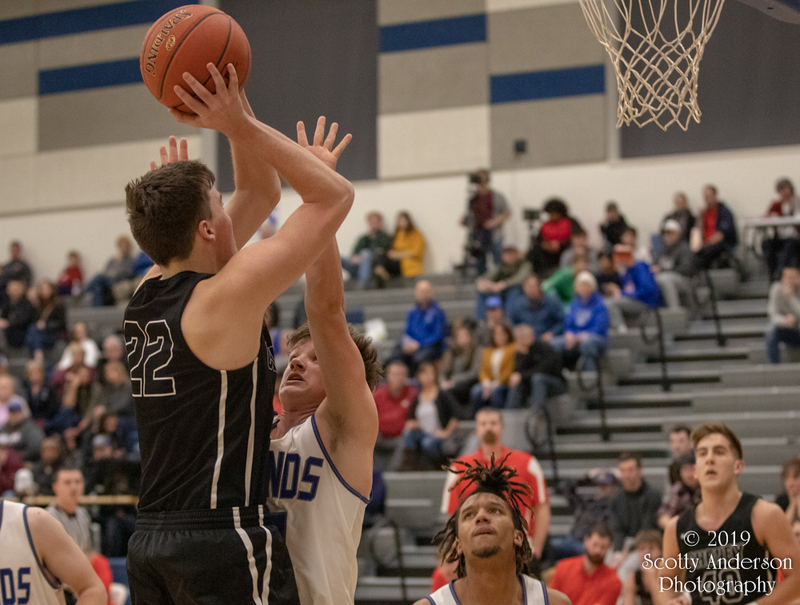 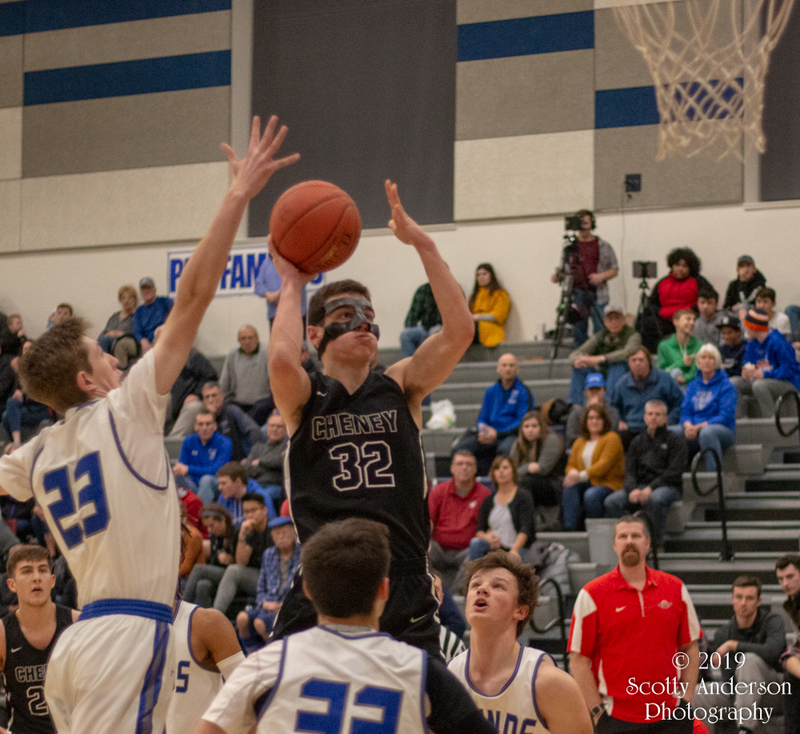 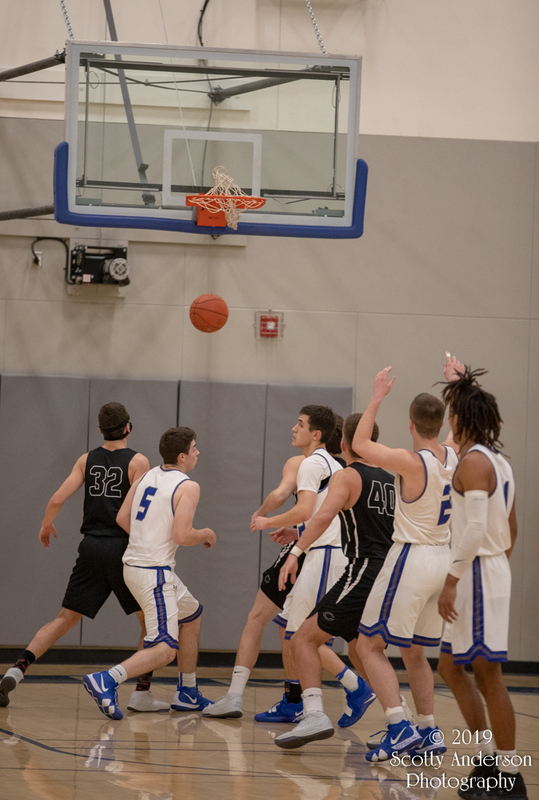 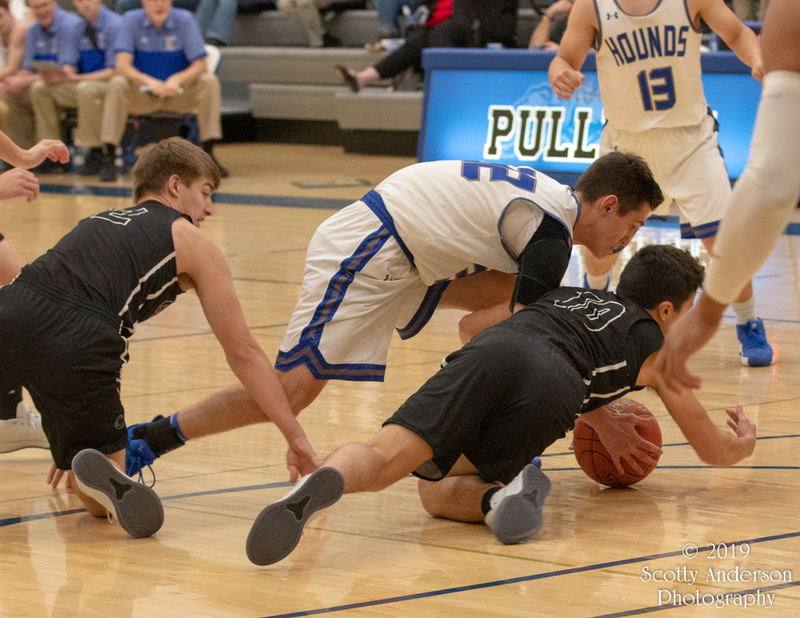 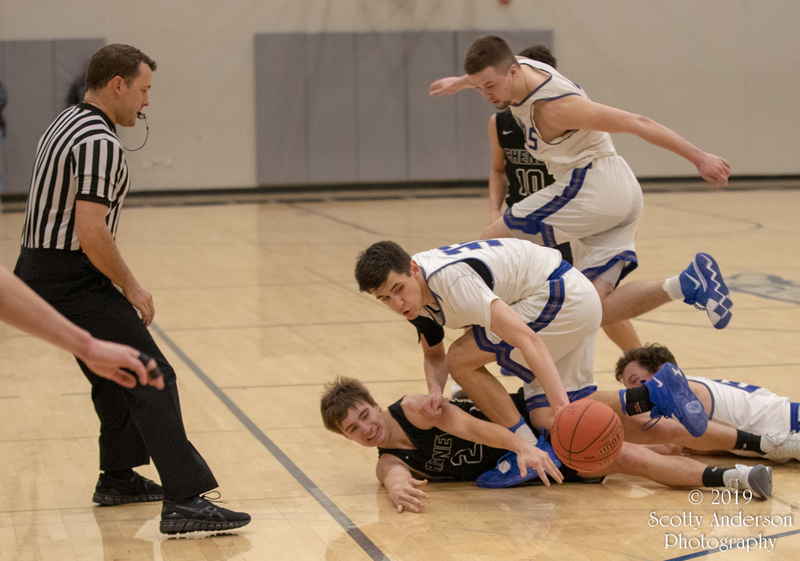 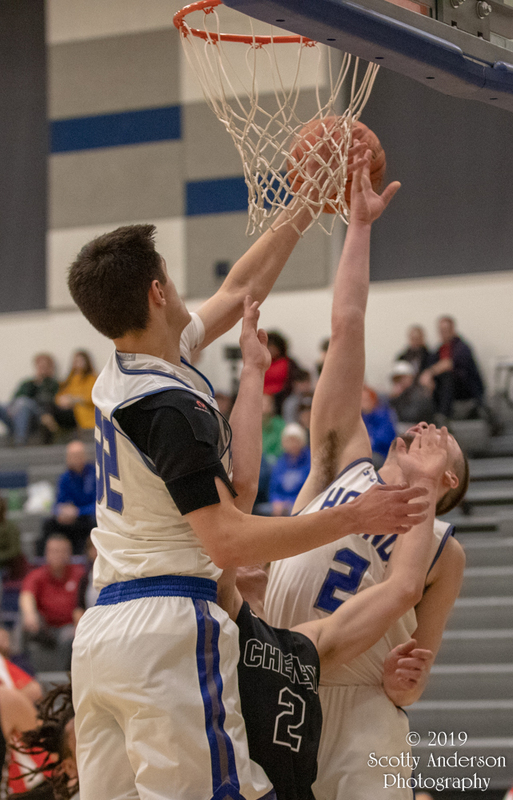 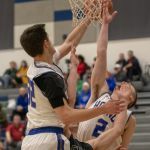 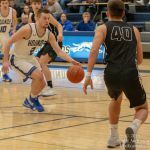 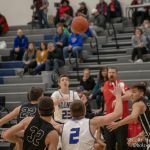 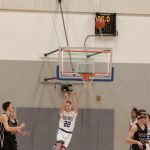 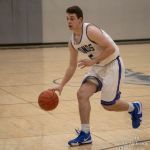 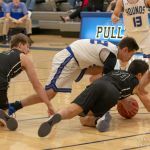 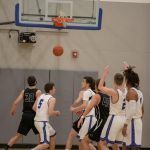 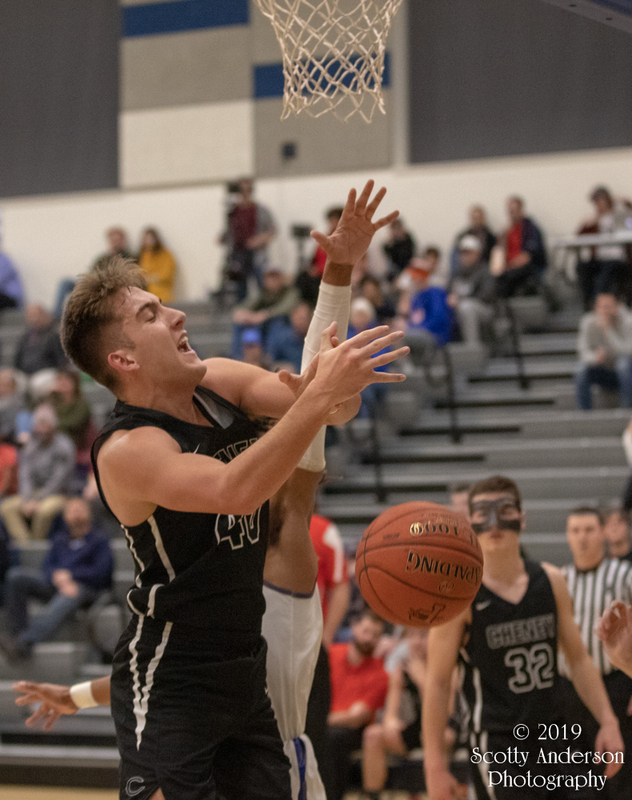 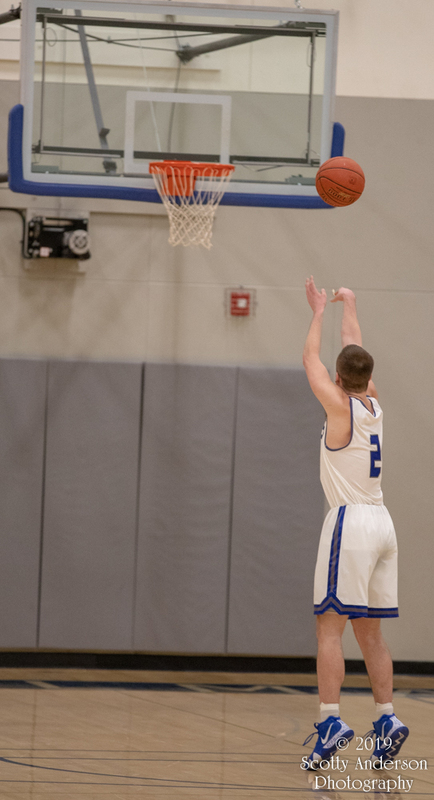 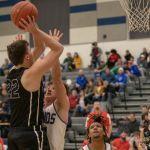 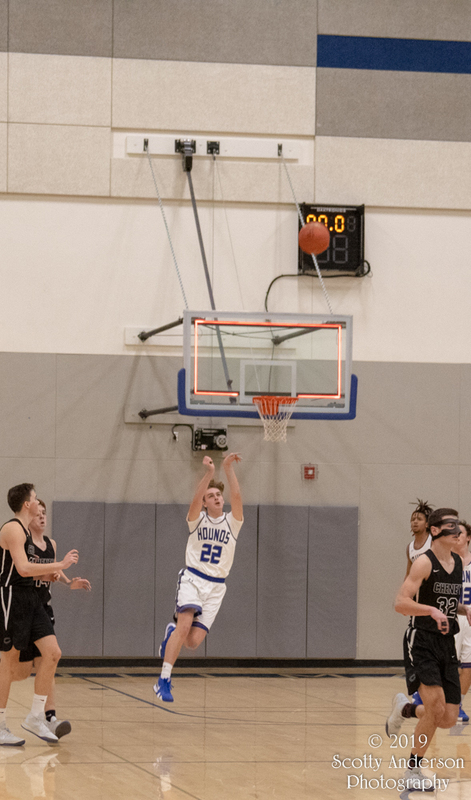 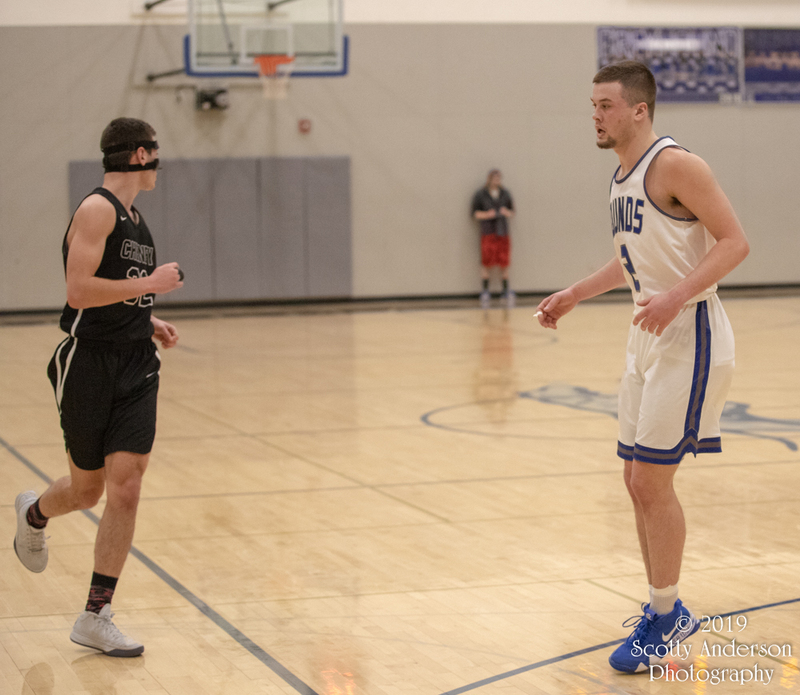 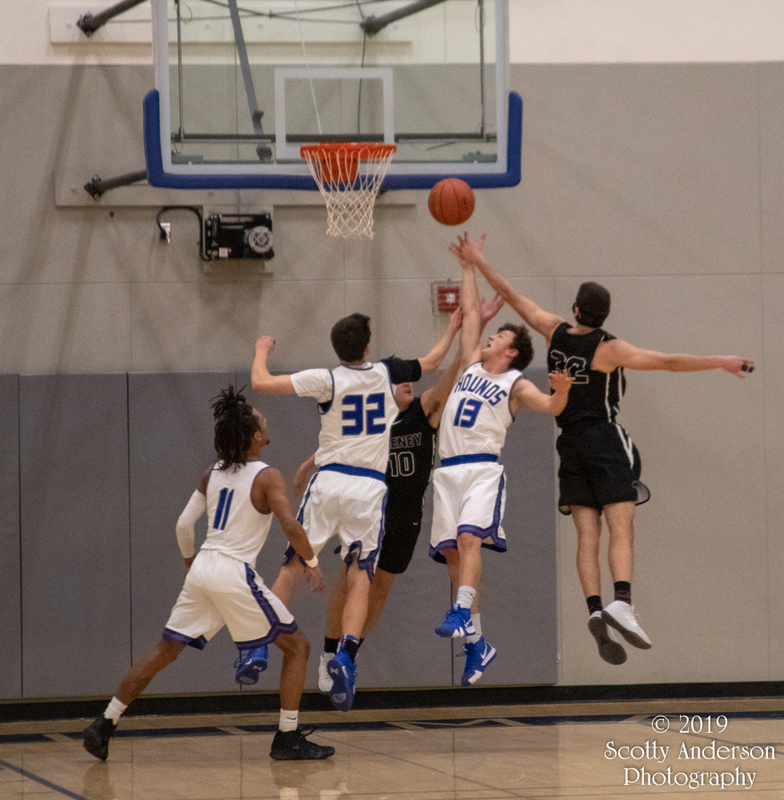 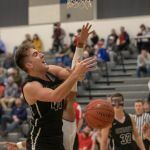 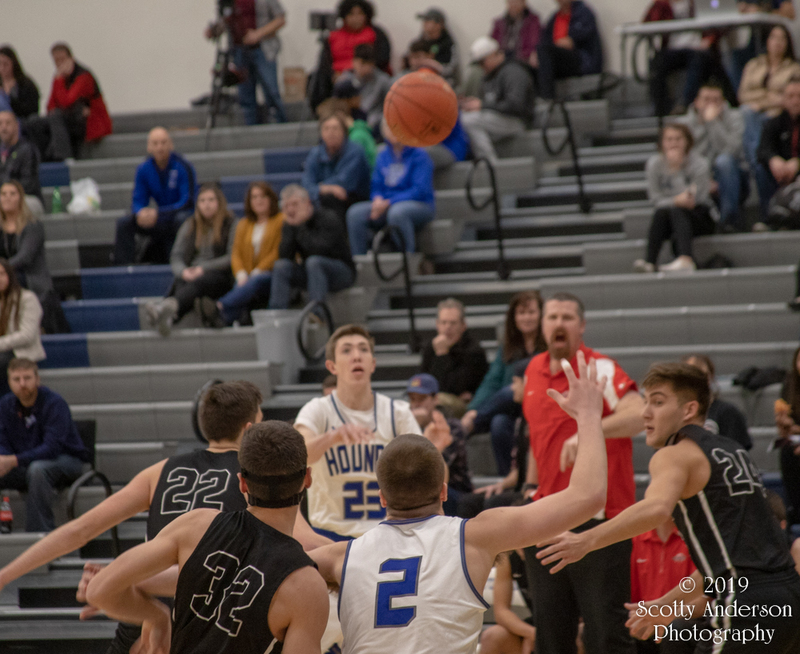 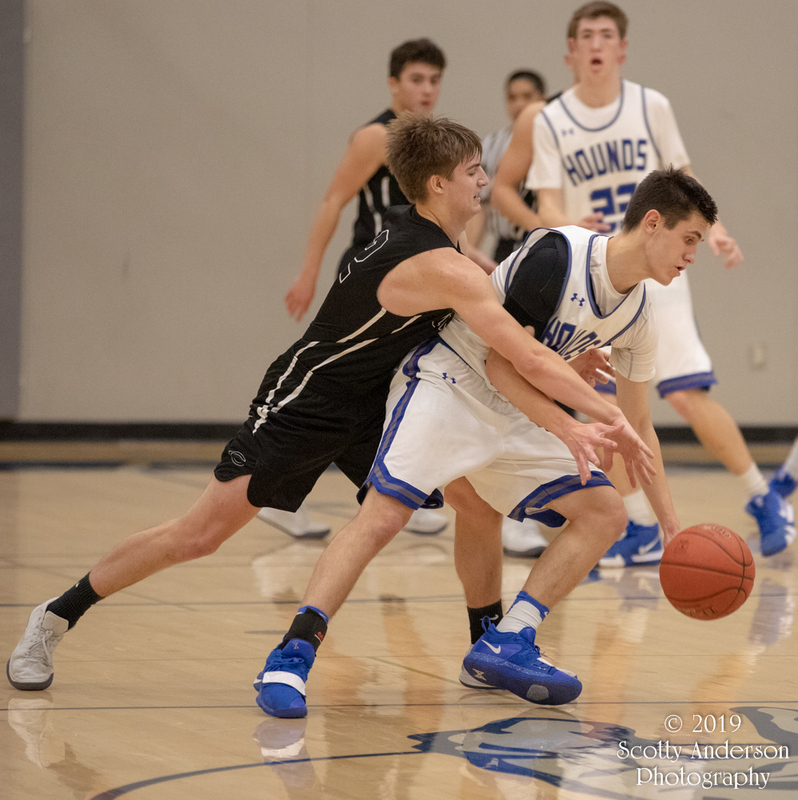 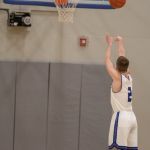 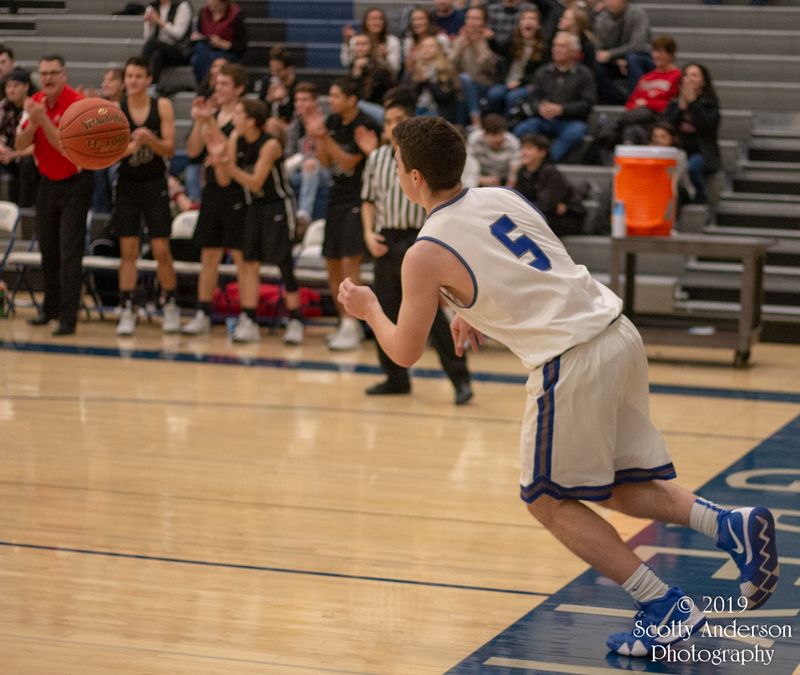 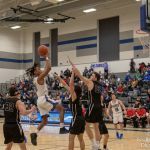 On January 4th , 2019 I took photos at the Pullman High School boys basketball game versus Cheney High School. 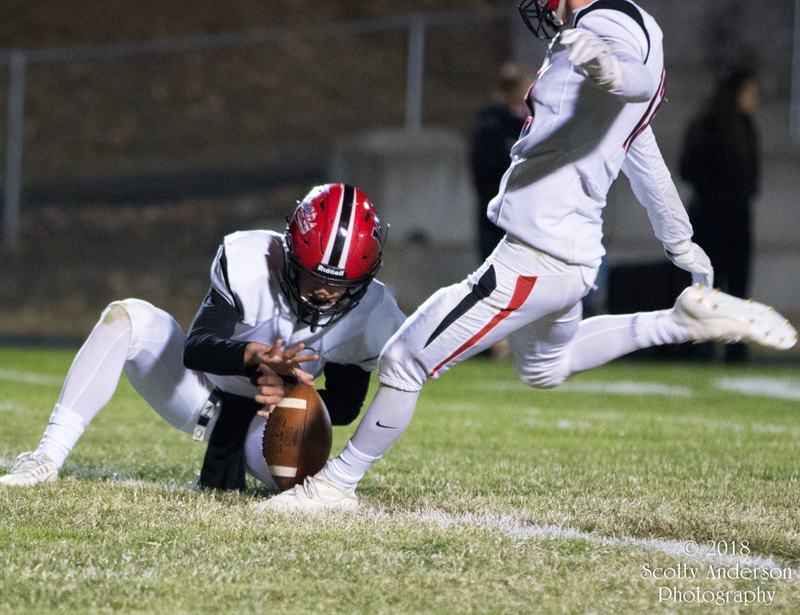 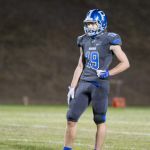 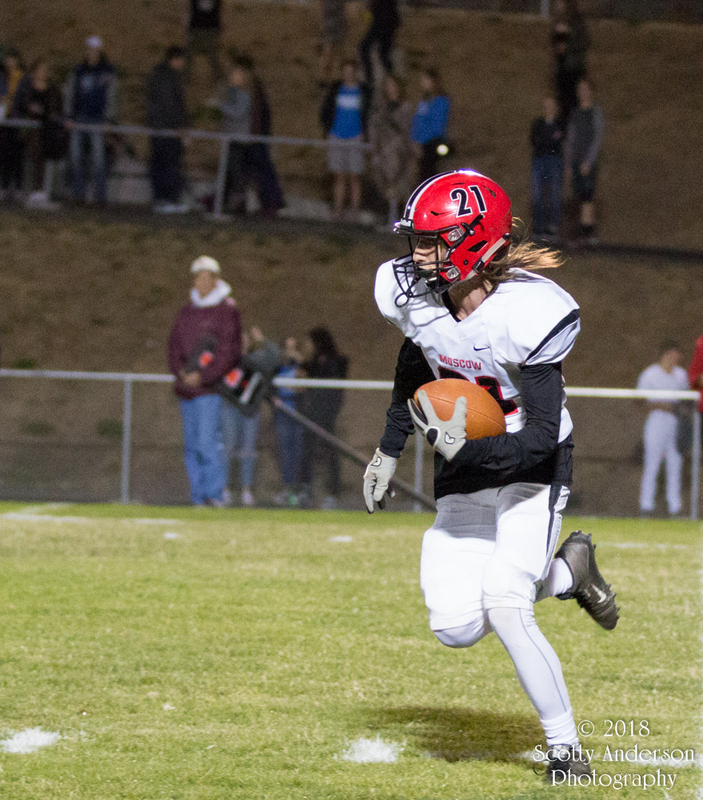 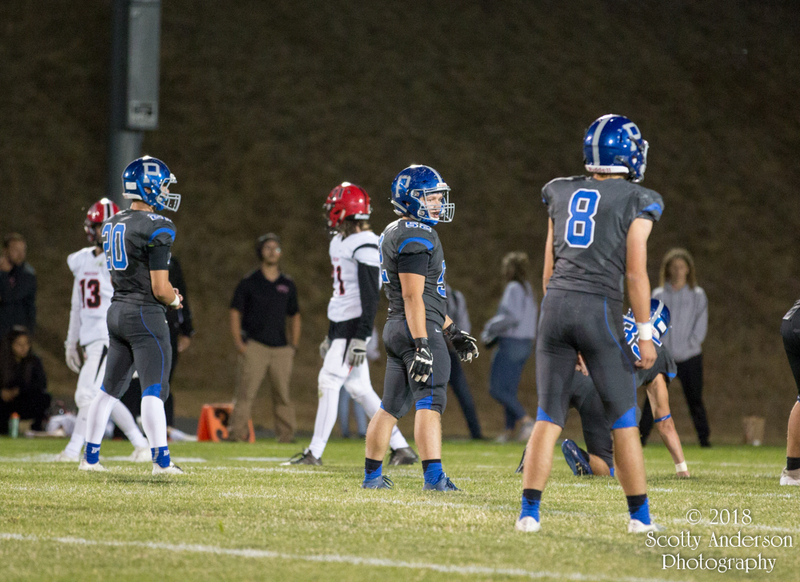 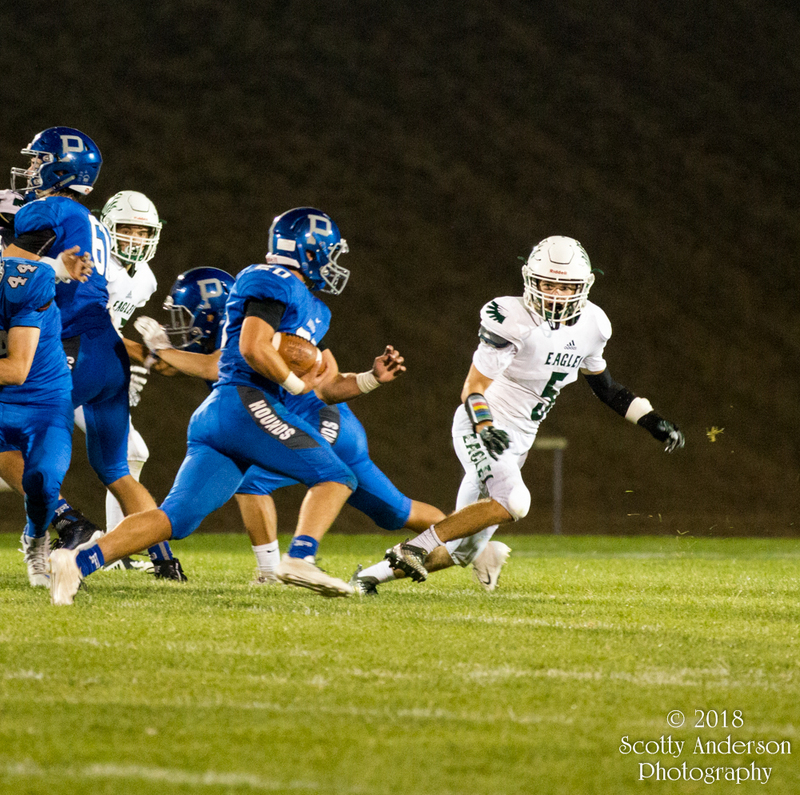 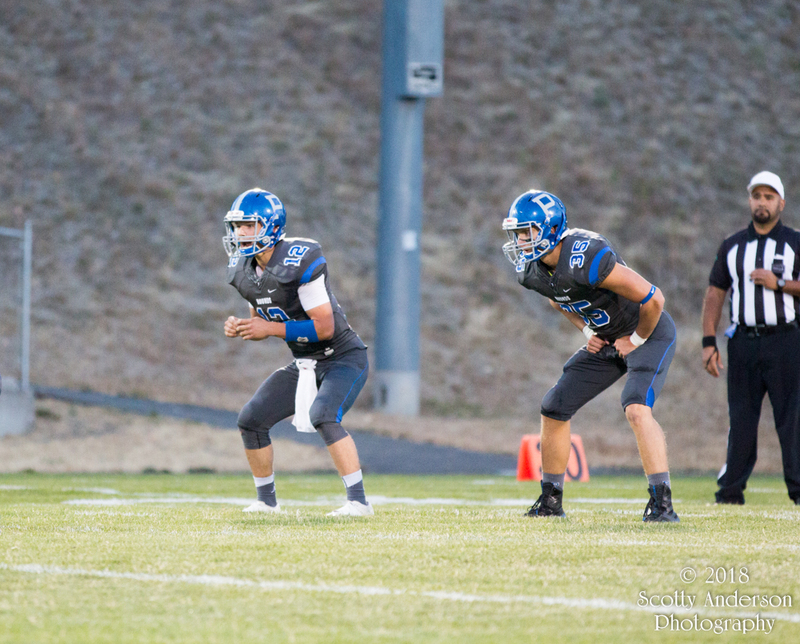 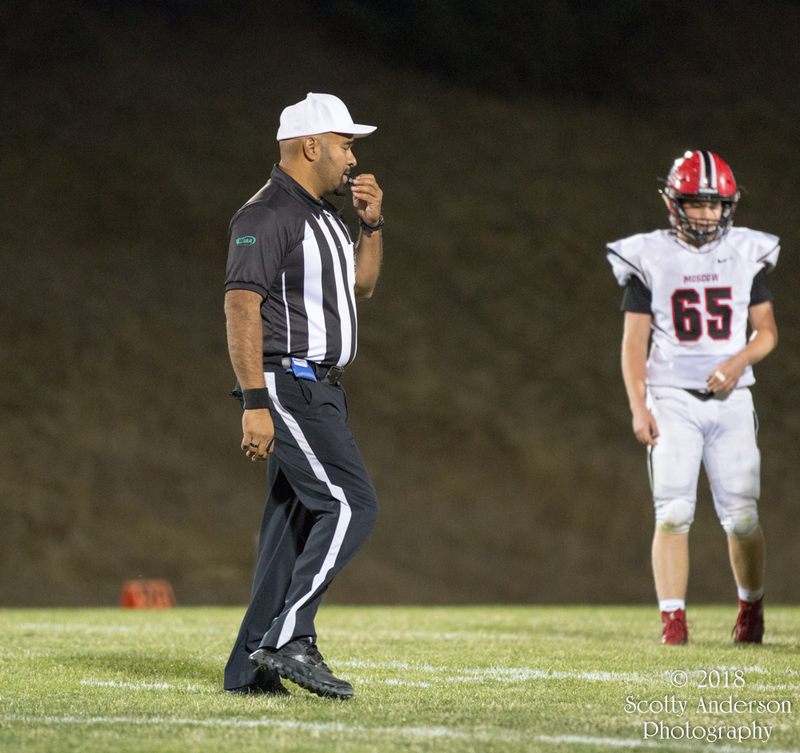 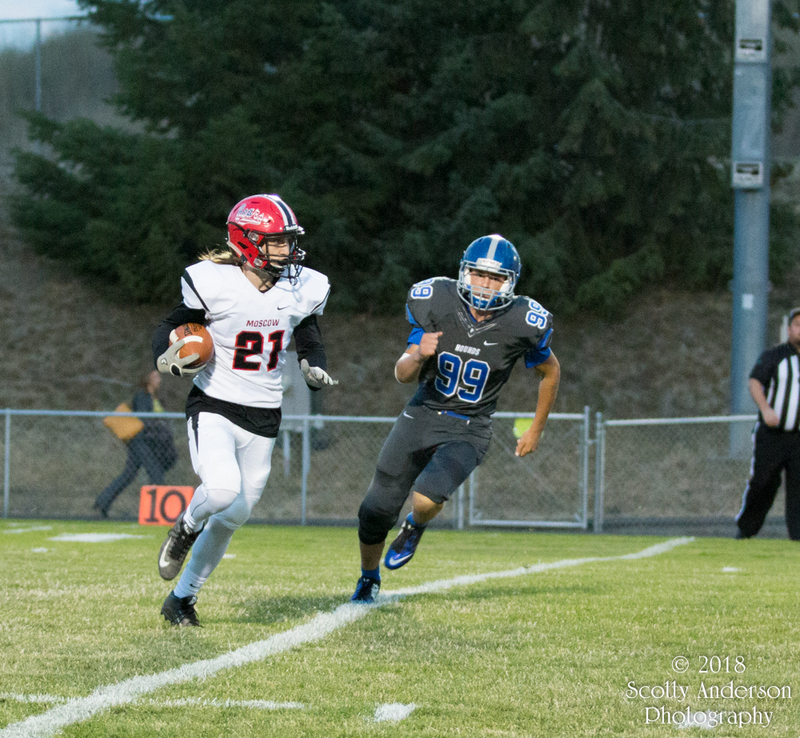 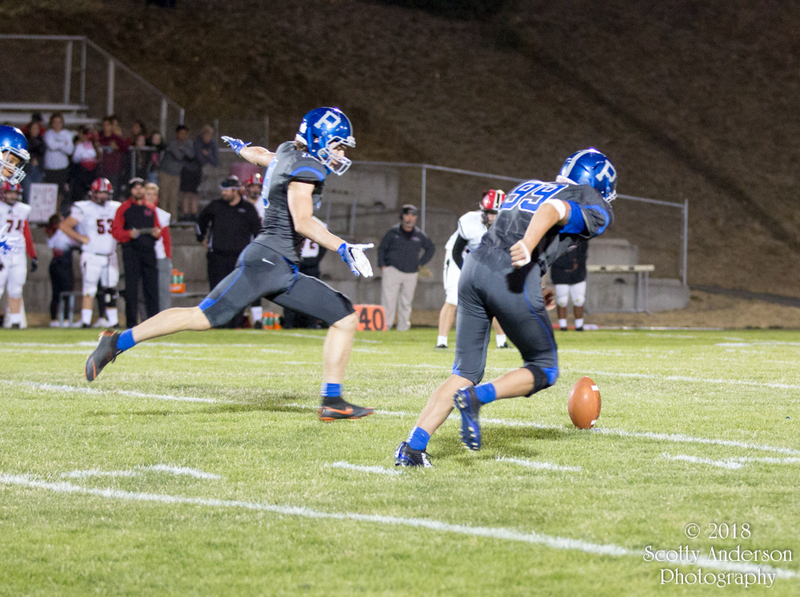 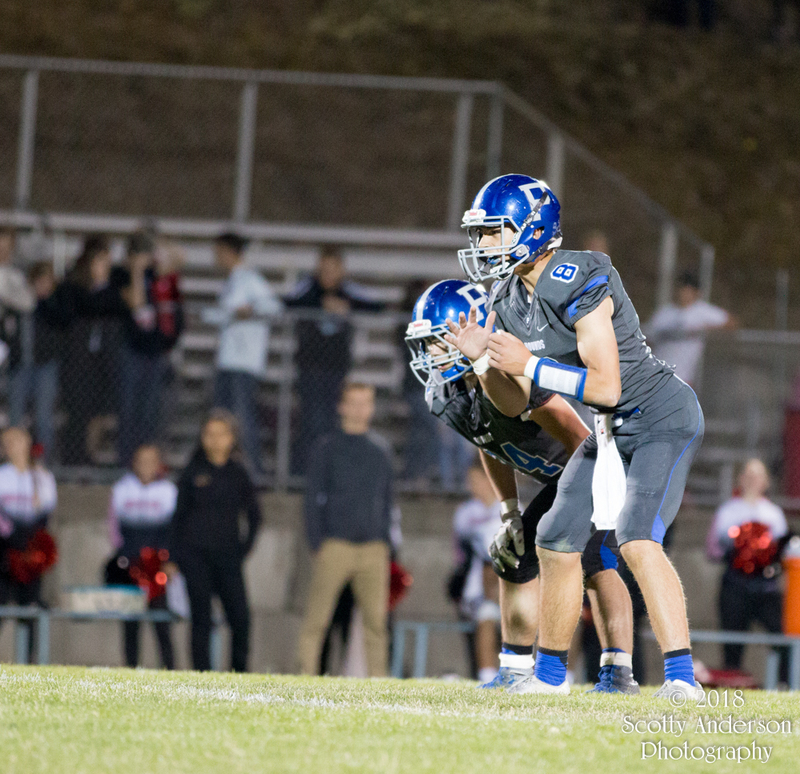 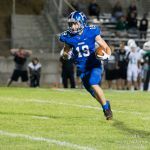 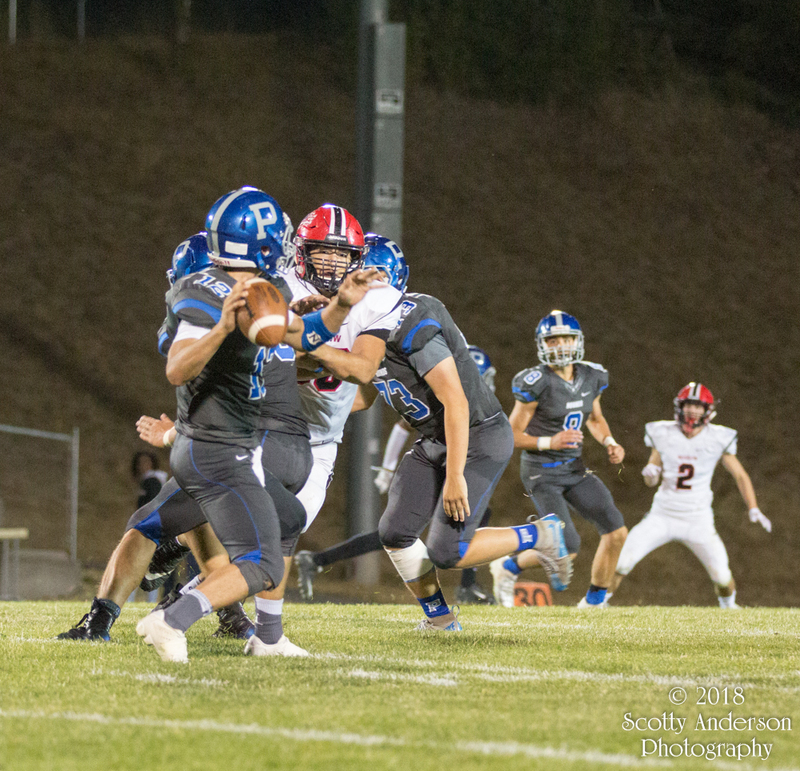 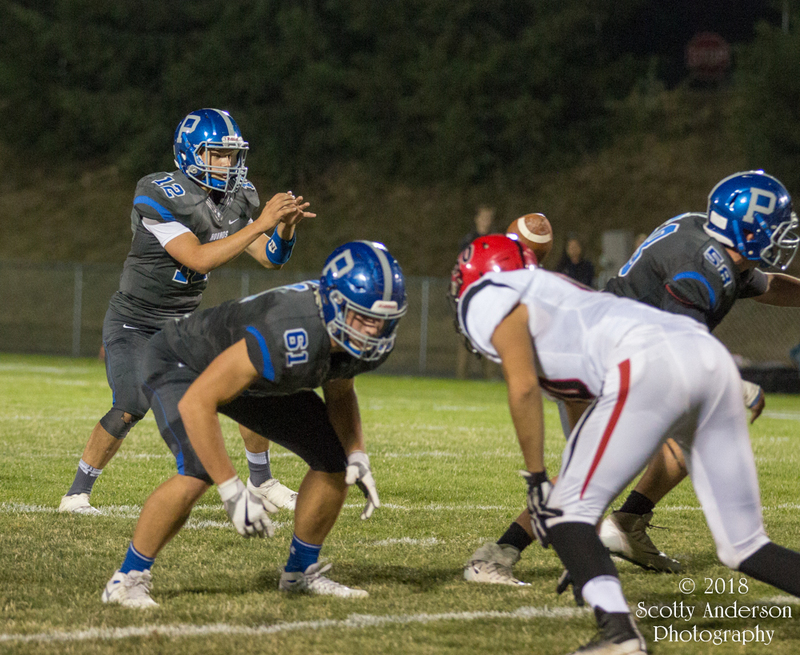 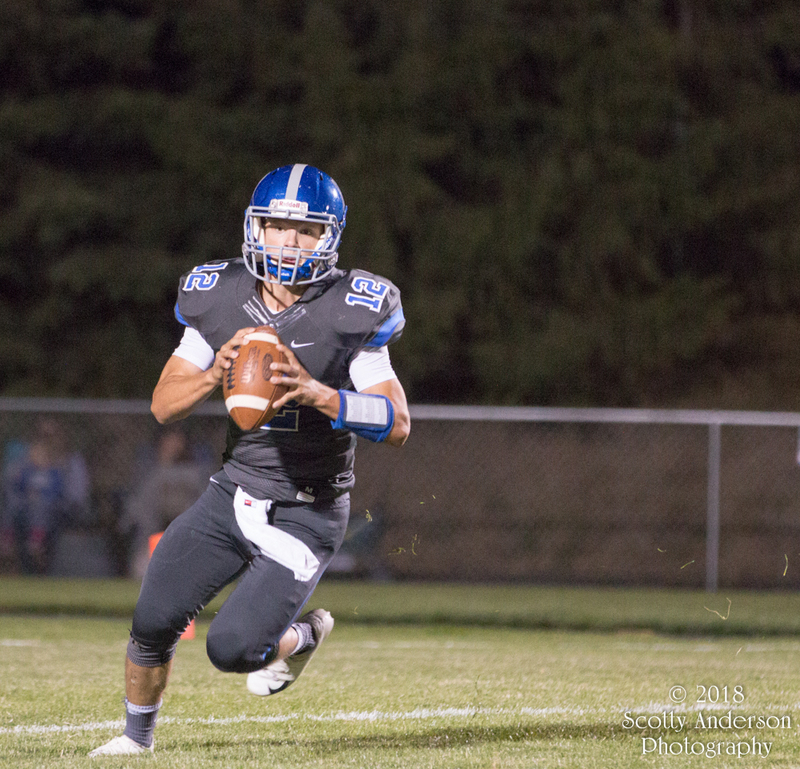 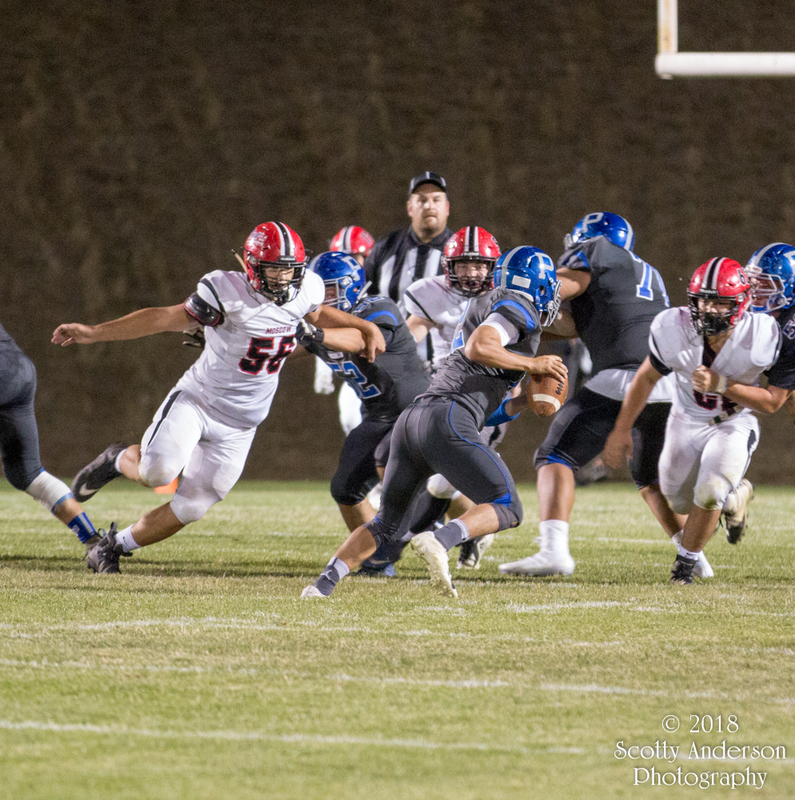 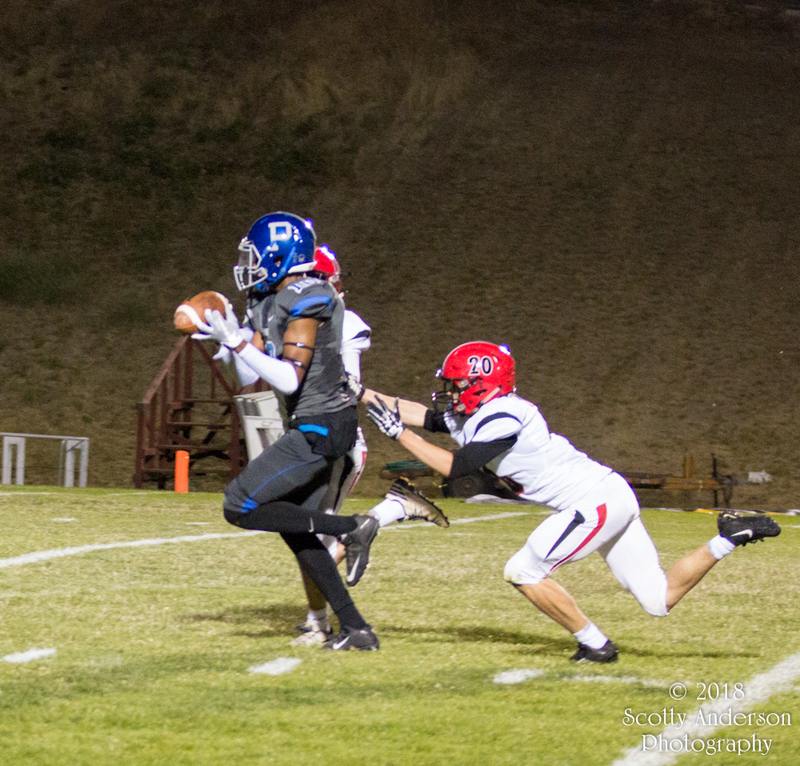 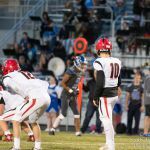 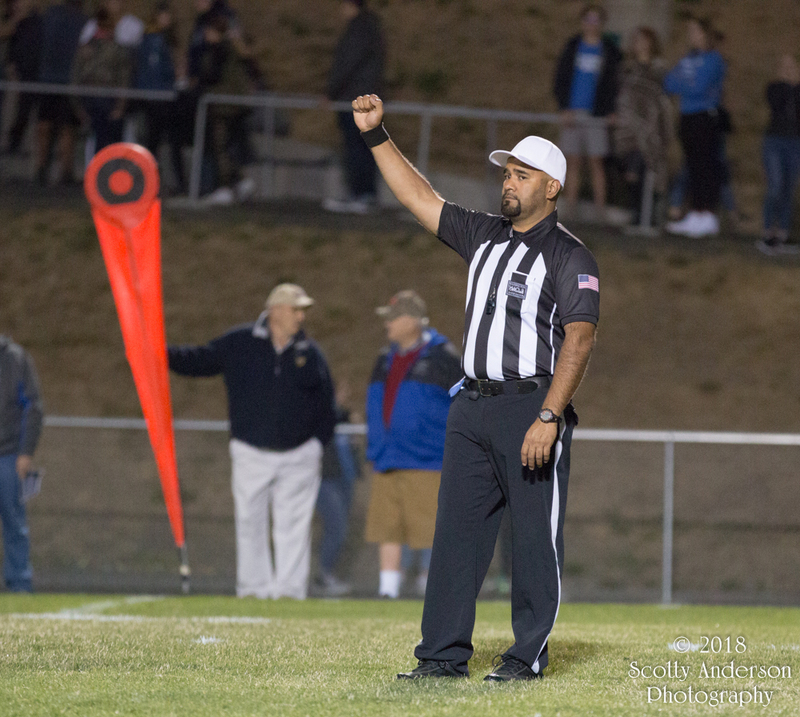 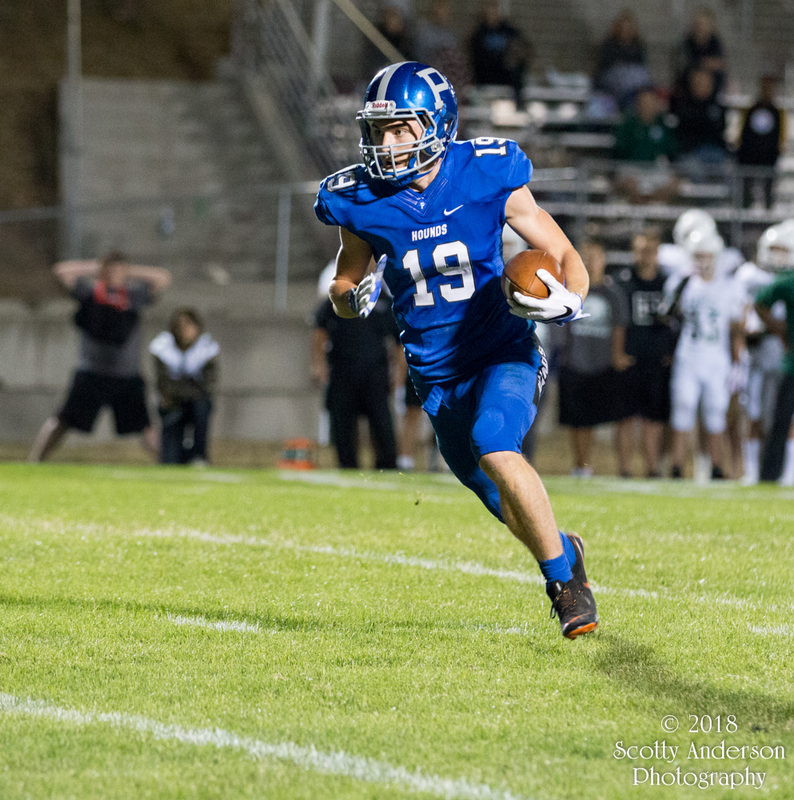 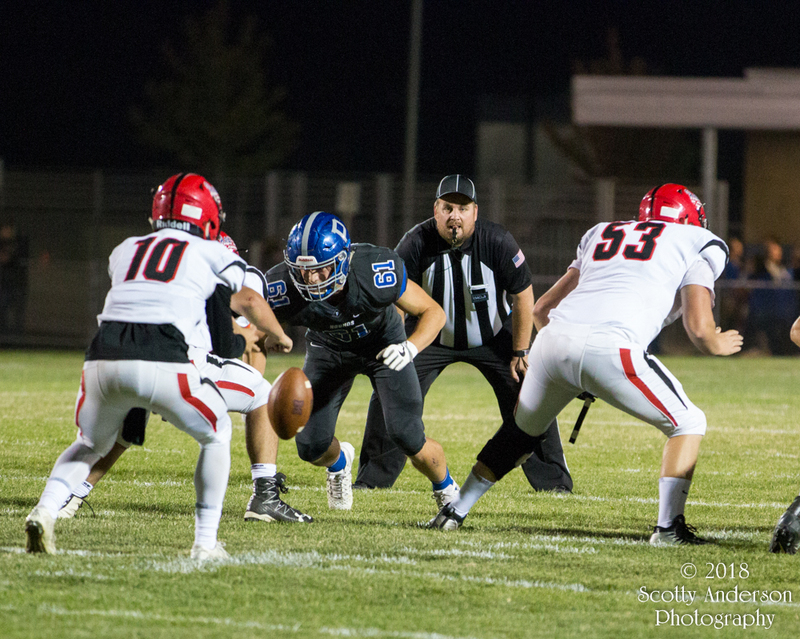 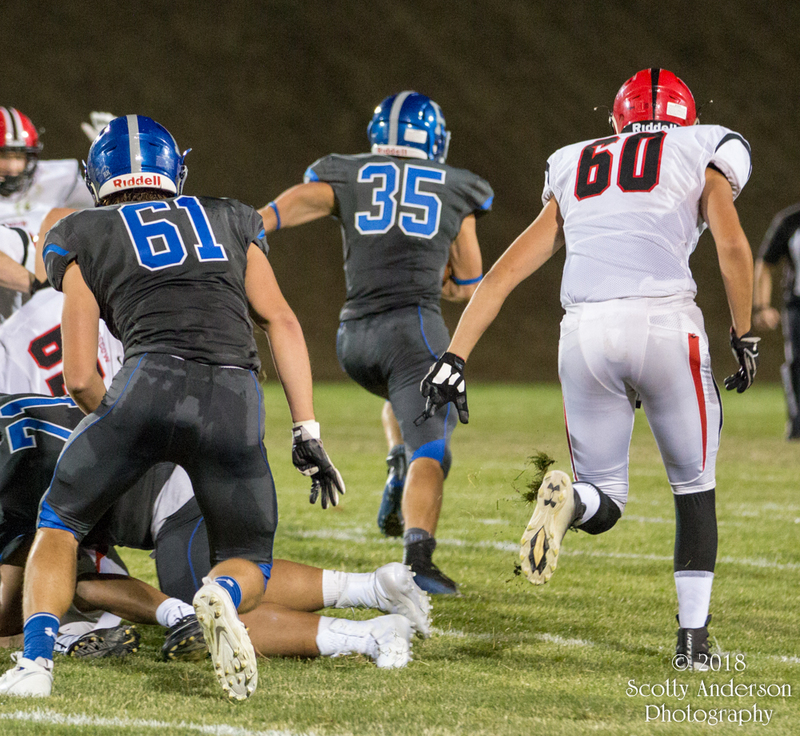 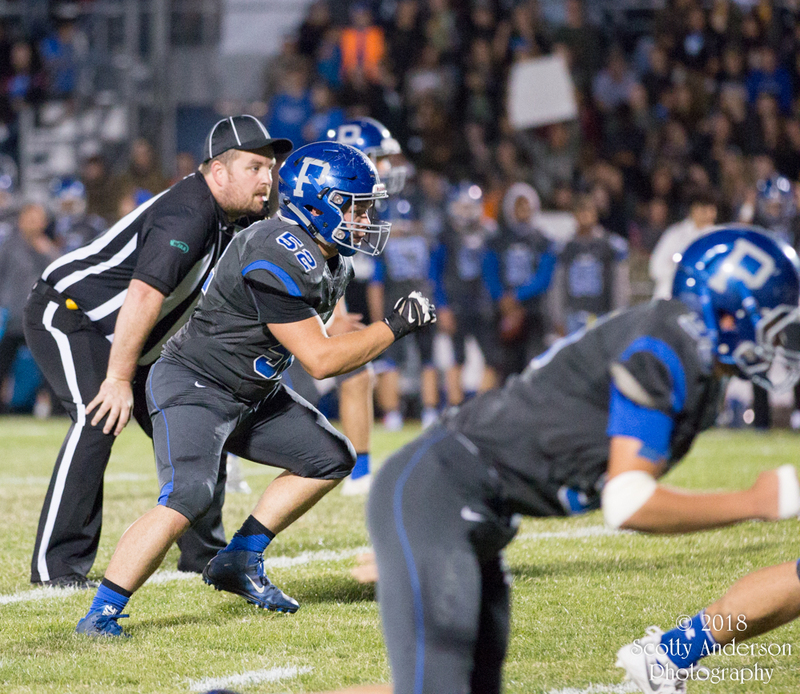 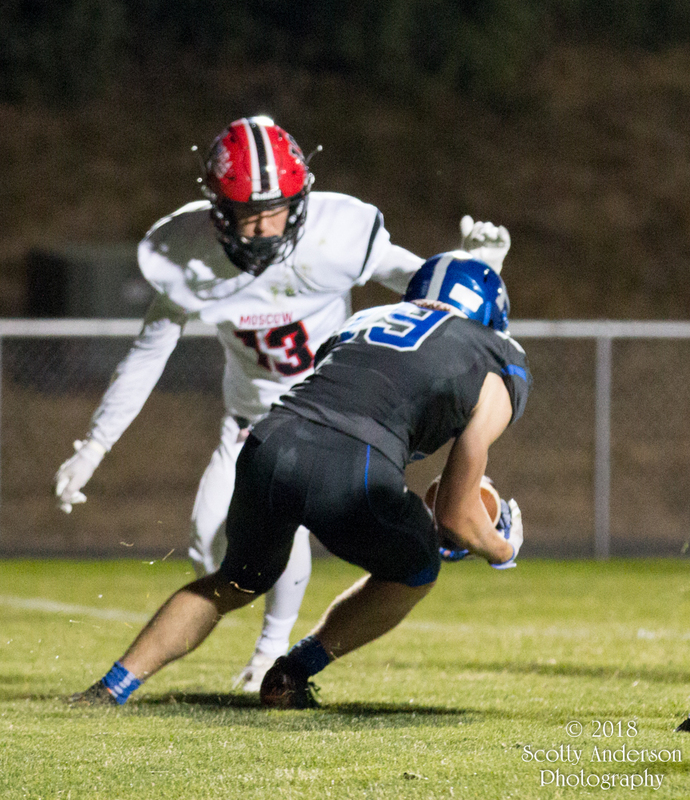 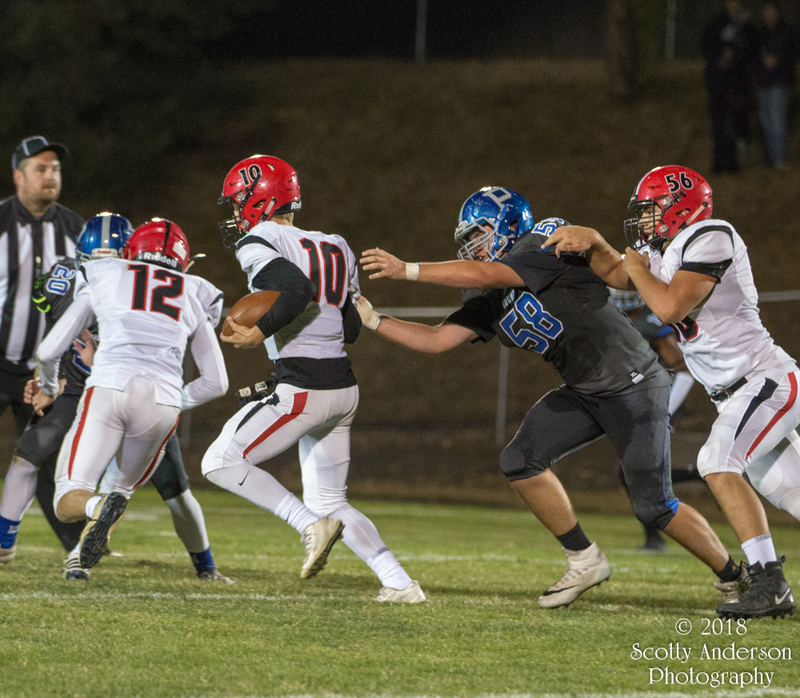 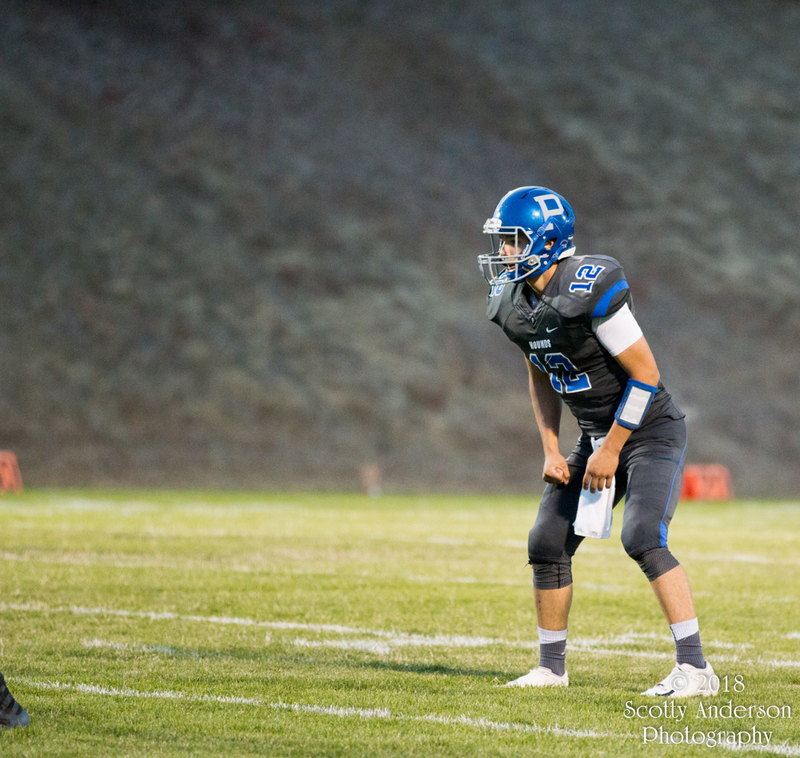 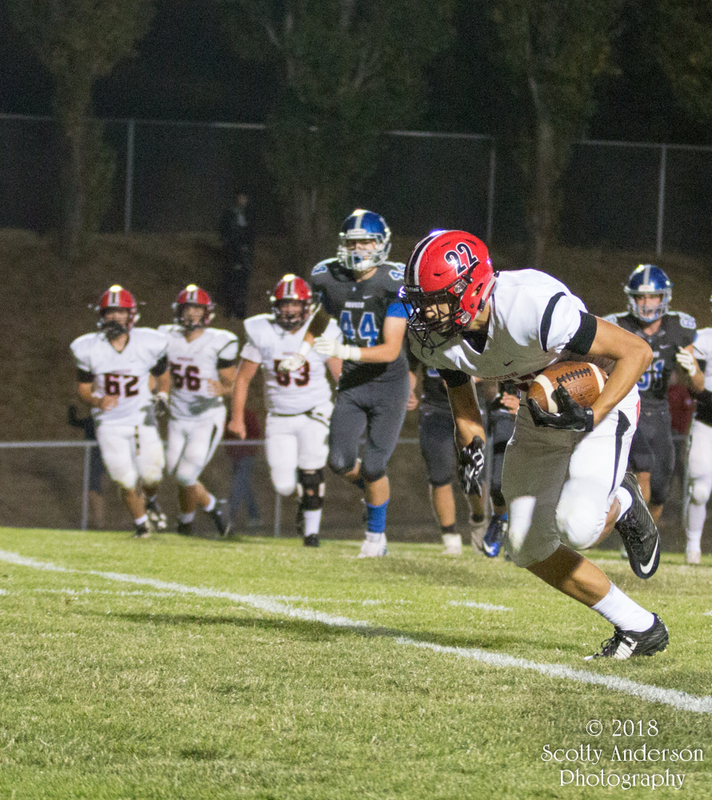 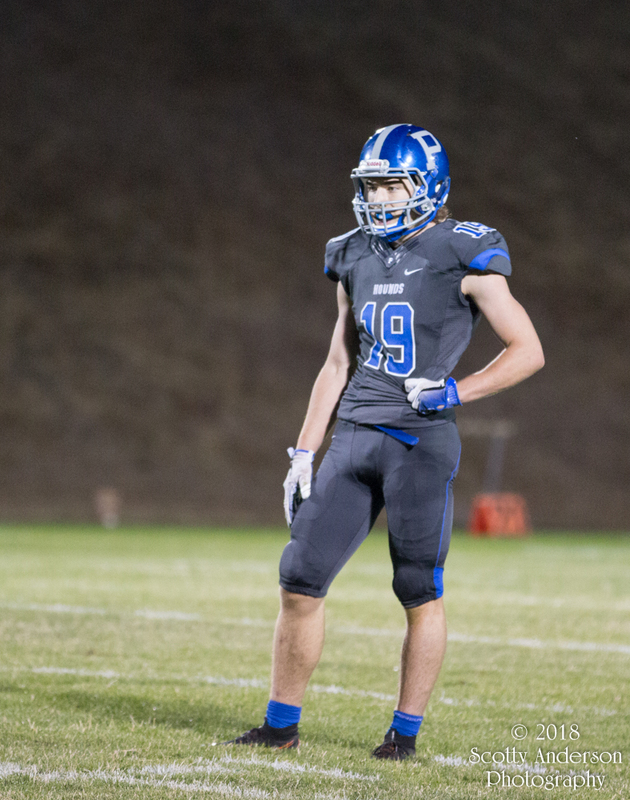 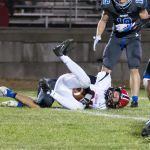 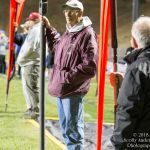 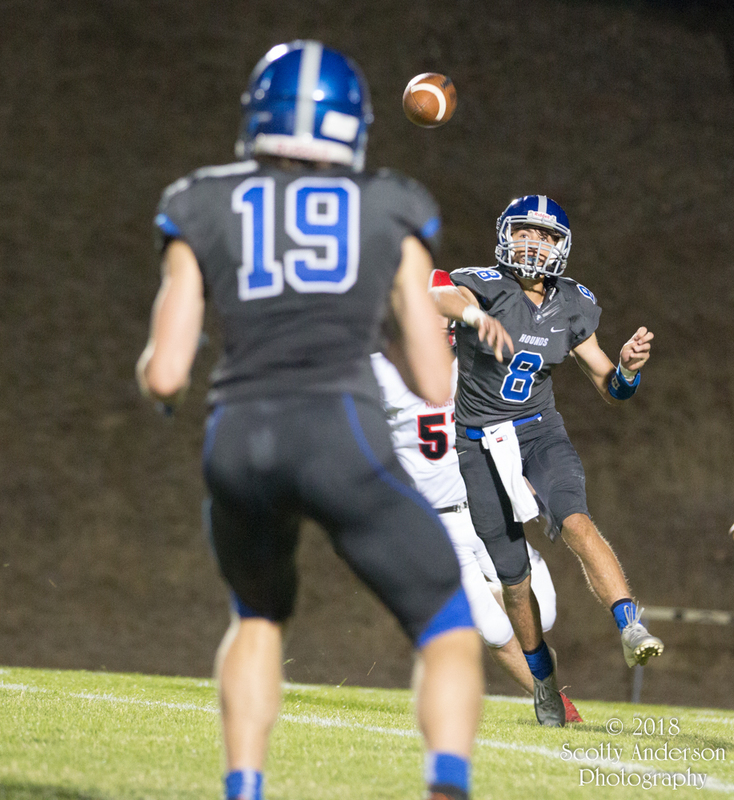 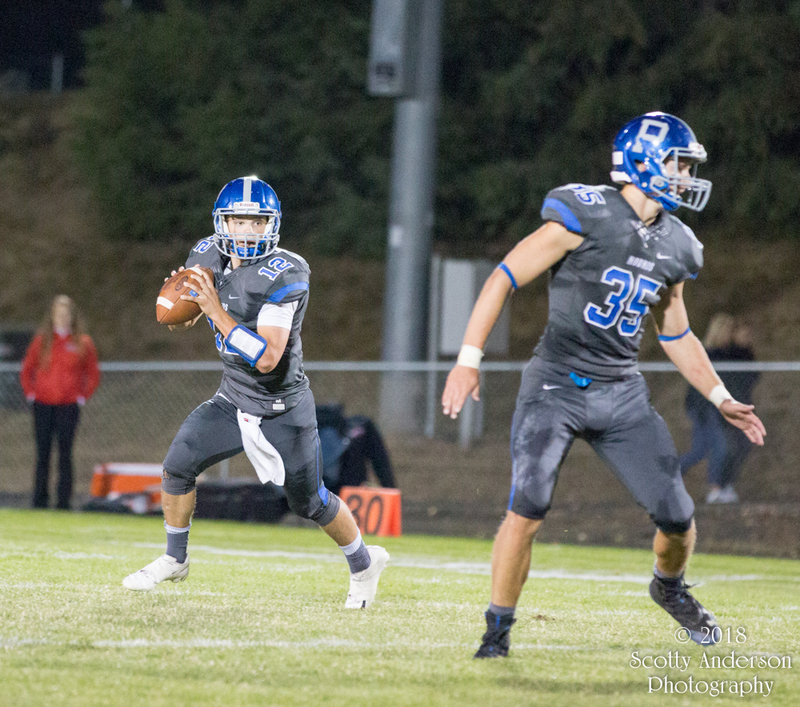 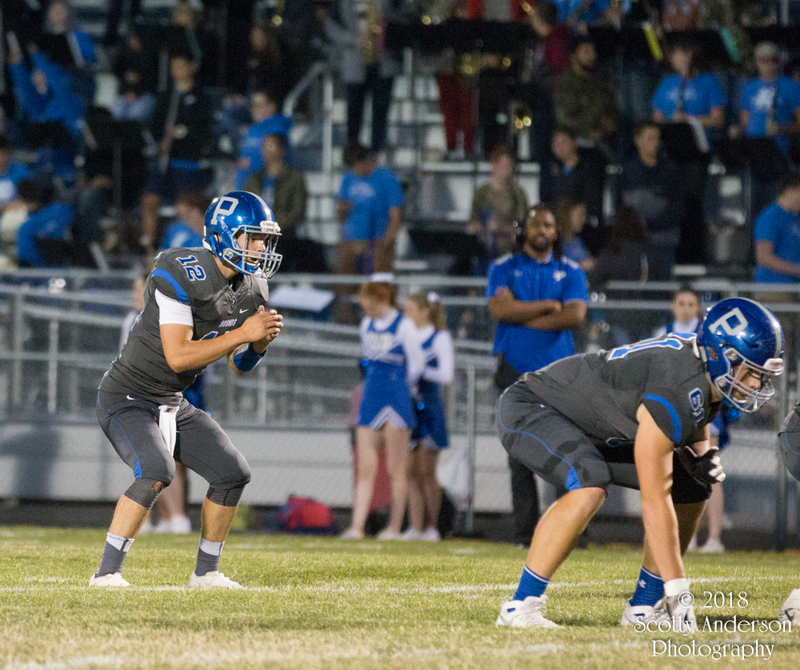 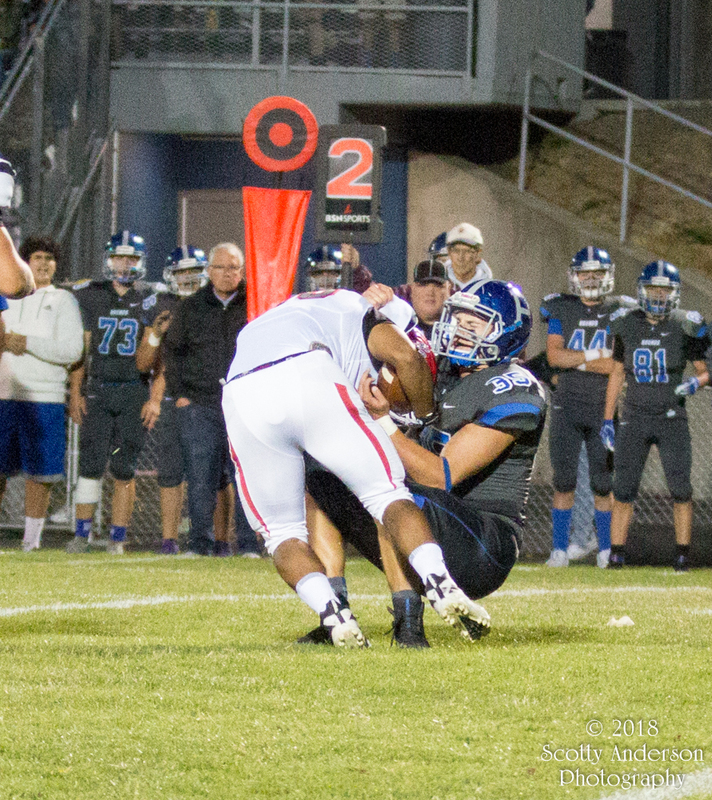 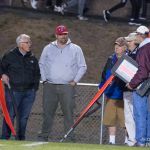 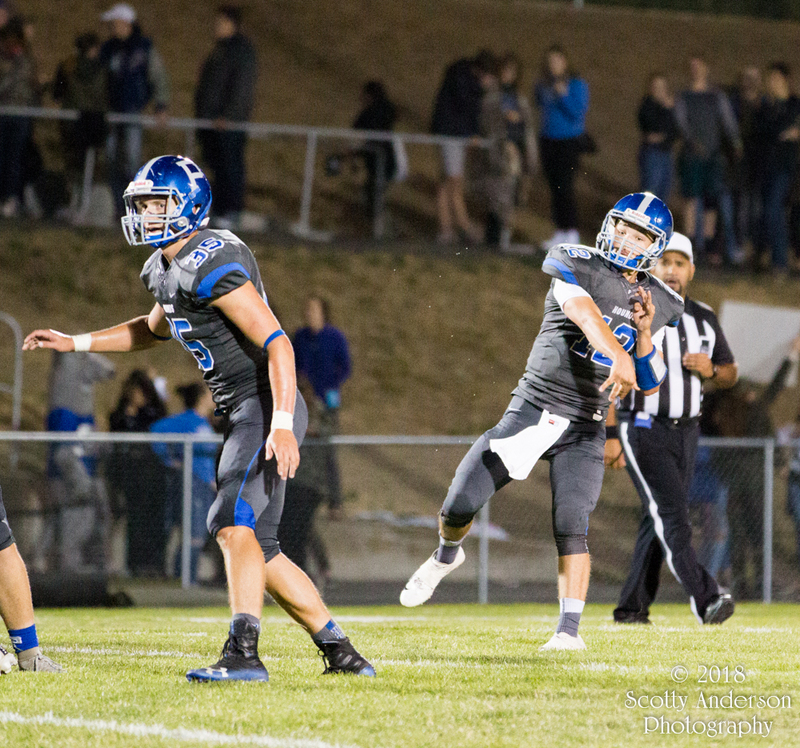 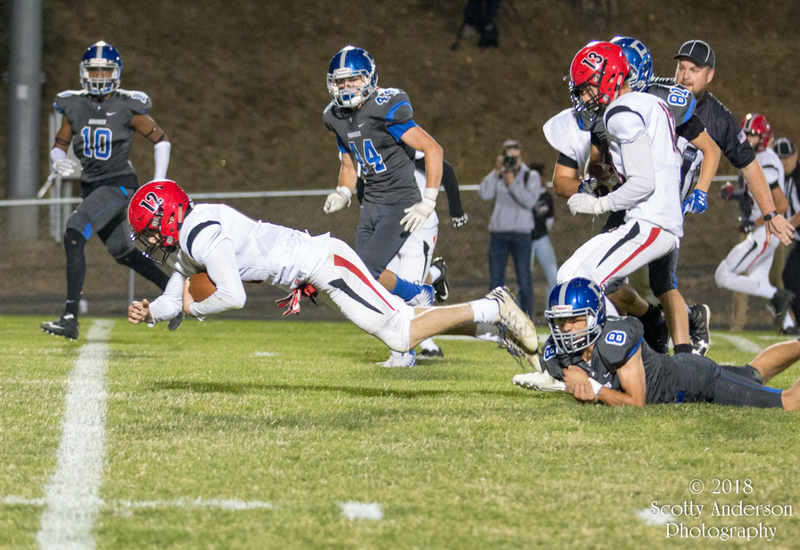 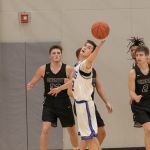 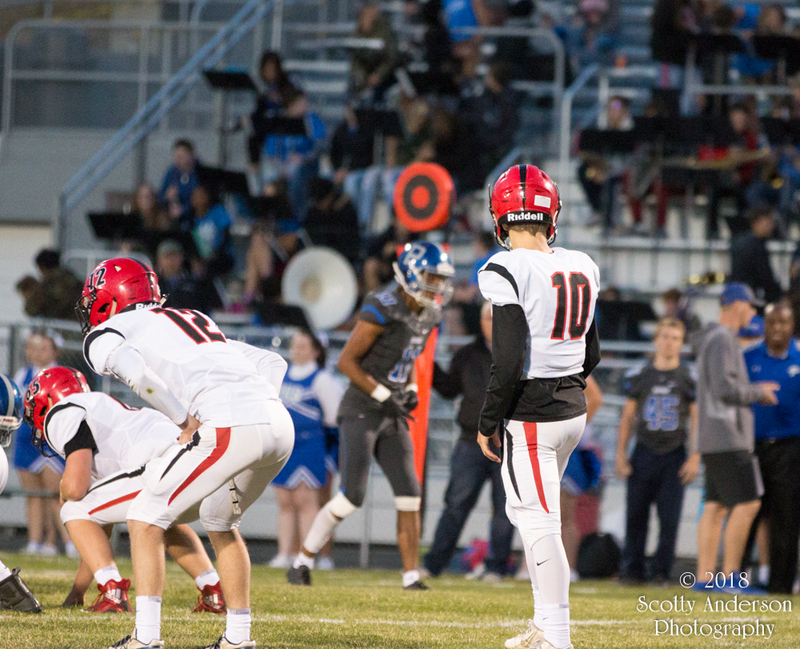 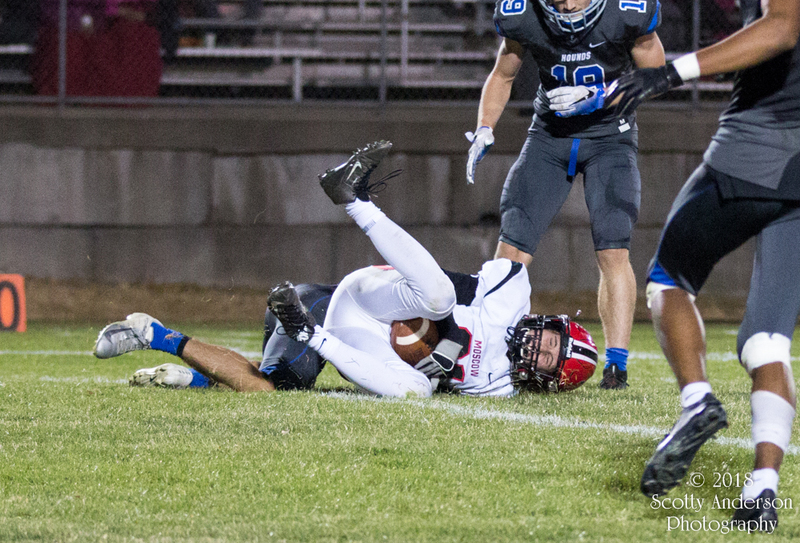 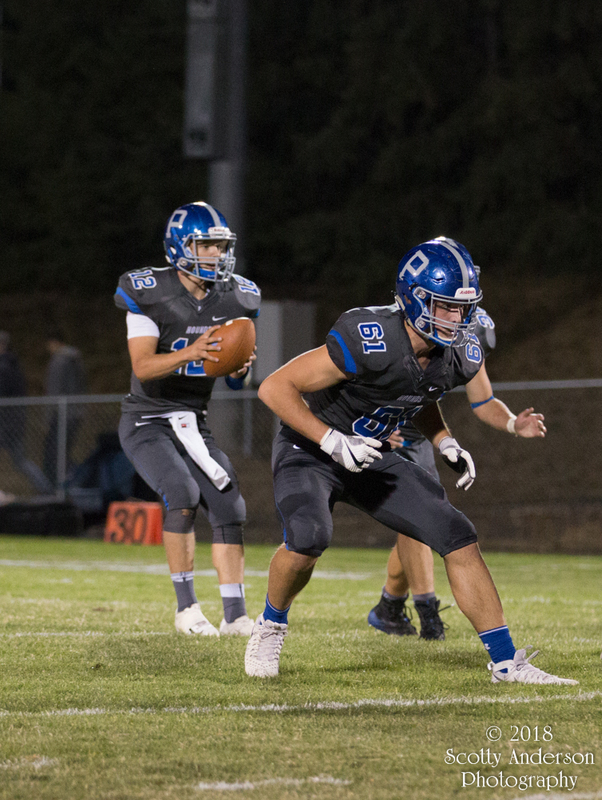 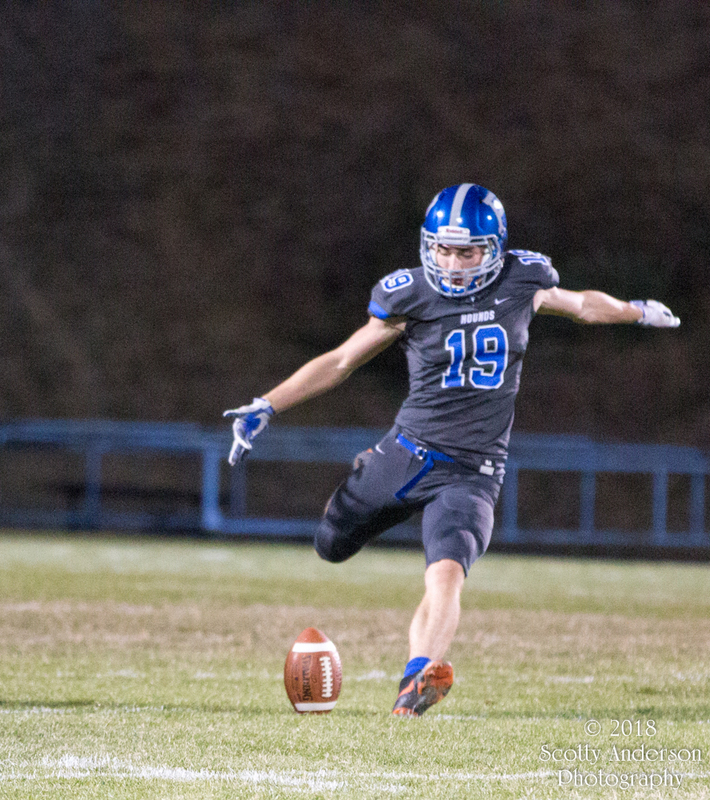 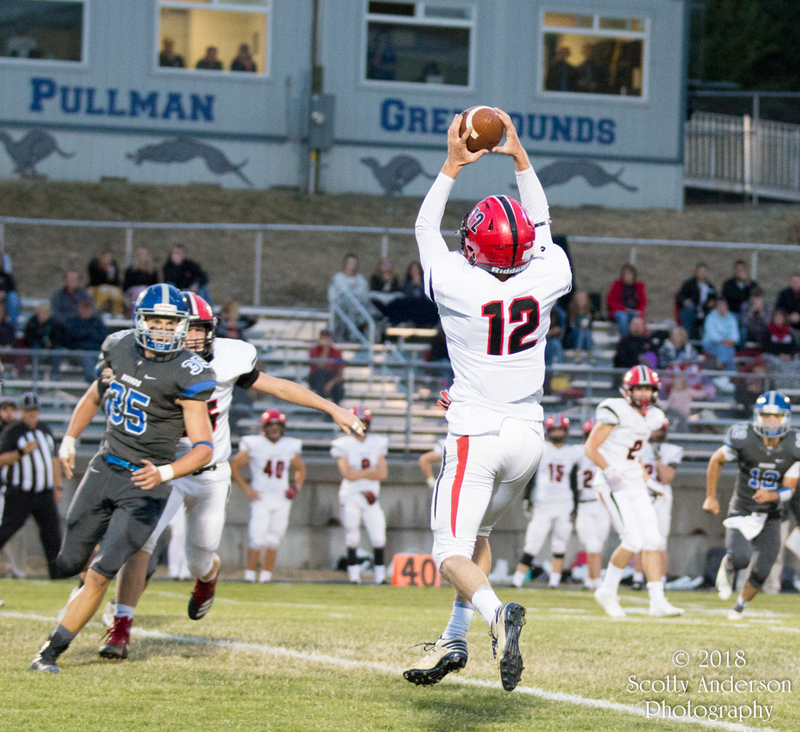 Pullman entered the night with a Great Northern League (GNL) record of 3-0 with a 10-0 record overall. 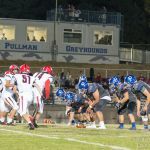 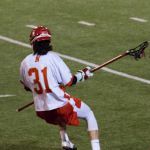 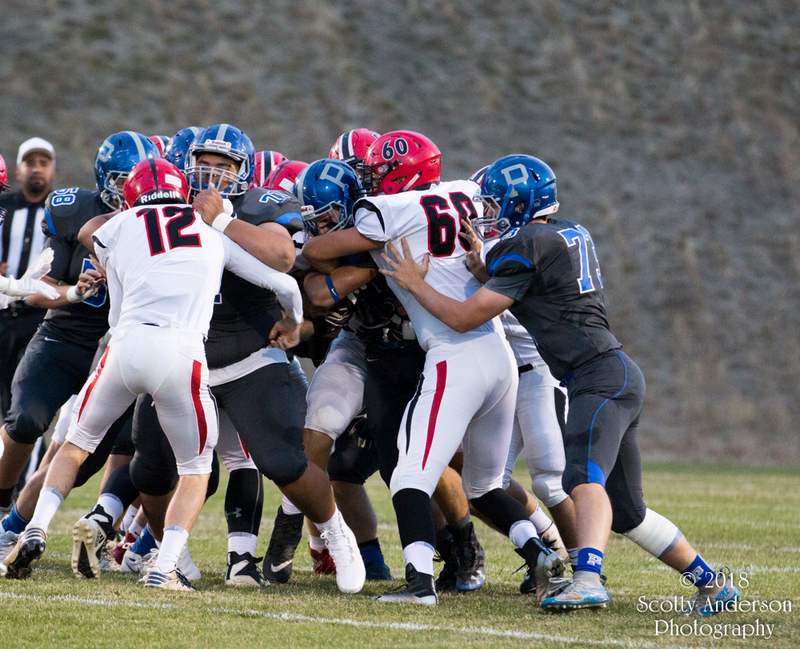 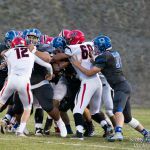 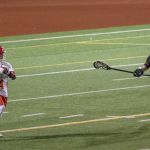 This league match-up of the Pullman High Greyhounds and the Cheney High Blackhawks was played in Pullman. 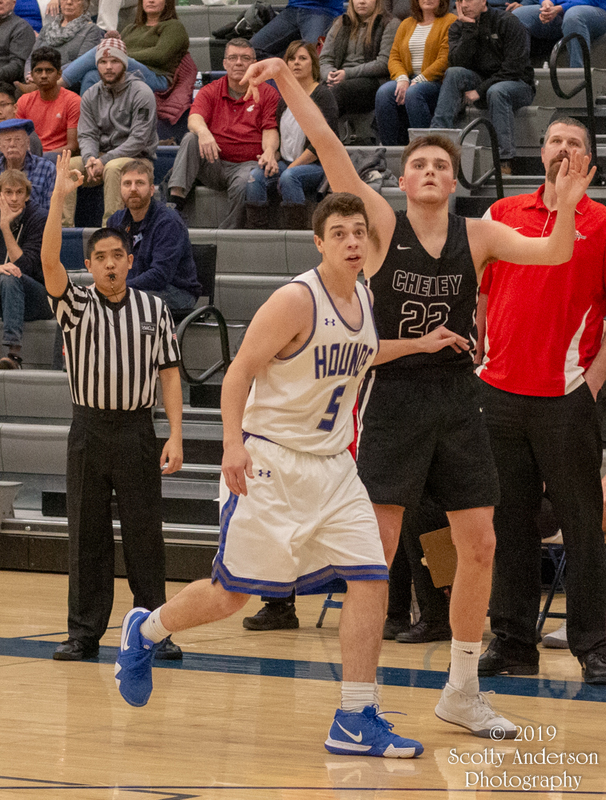 Cheney entered the game with a 2-1 GNL and a 4-4 overall record. 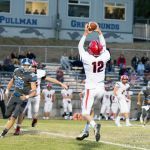 After the first quarter of play Cheney lead Pullman 16 – 10. 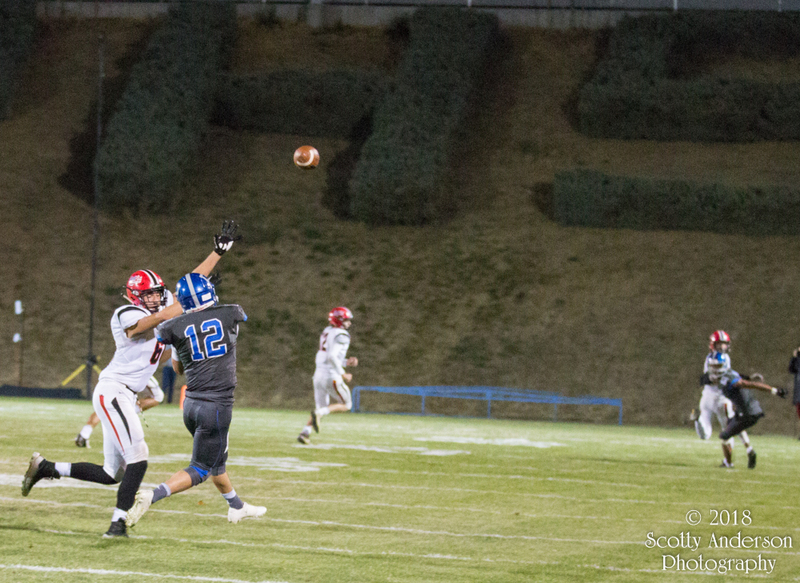 By halftime, however, Pullman had tied the score 22 all. 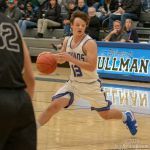 In the second half of play Pullman extended their lead by 2 points. 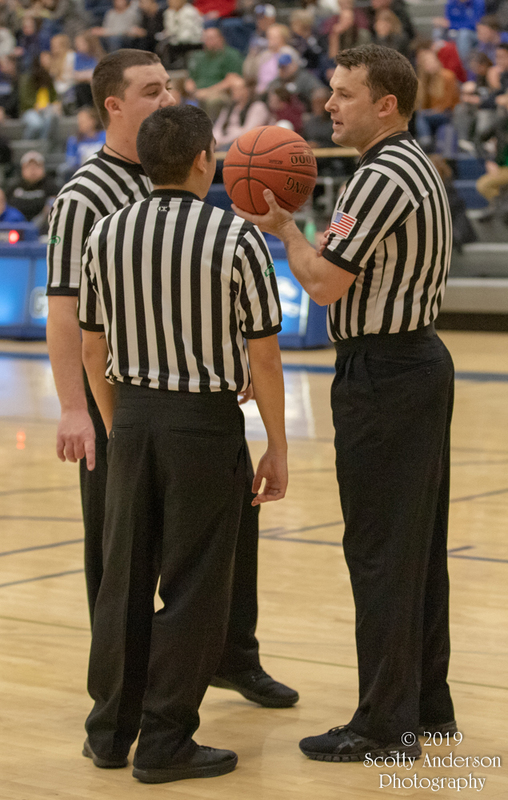 They got some breathing room down the stretch. 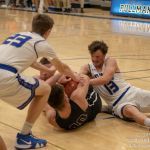 Pullman won by a final score of 50 – 45. 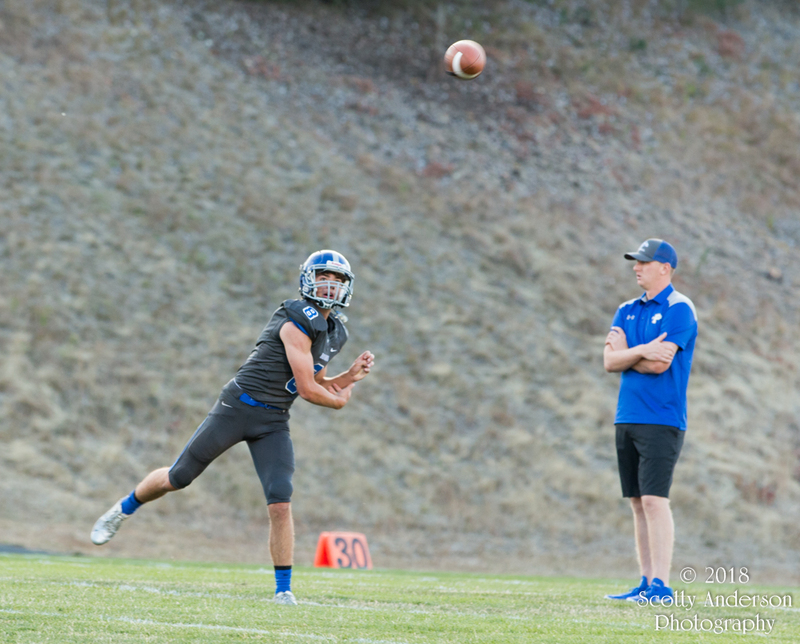 This moves Pullman to a league leading 4-0 record. 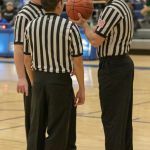 I went to the game with two cameras. 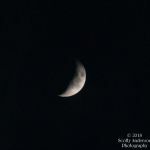 I had my trust Canon 70D and my new Canon 6D Mark II. I used a couple different lenses. 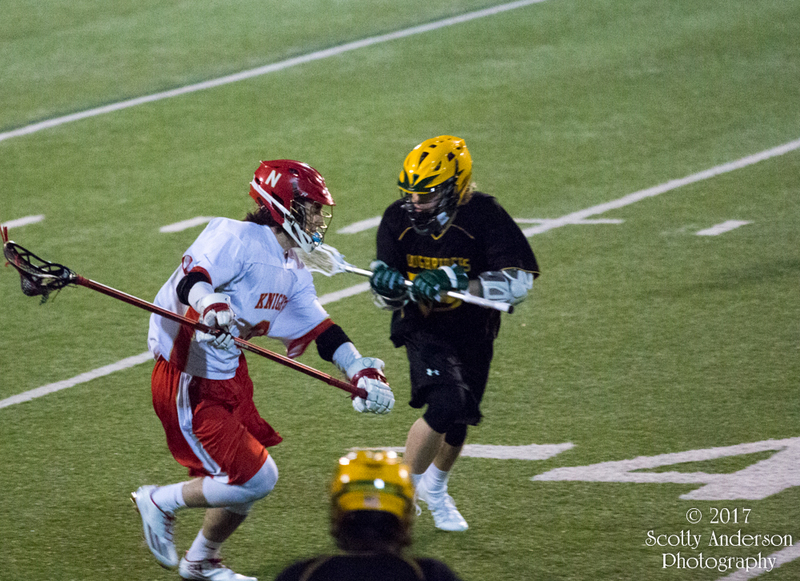 I ended up liking the 50mm f/1.8 prime and Canon 70-200 f/2.8 IS II lenses the best. 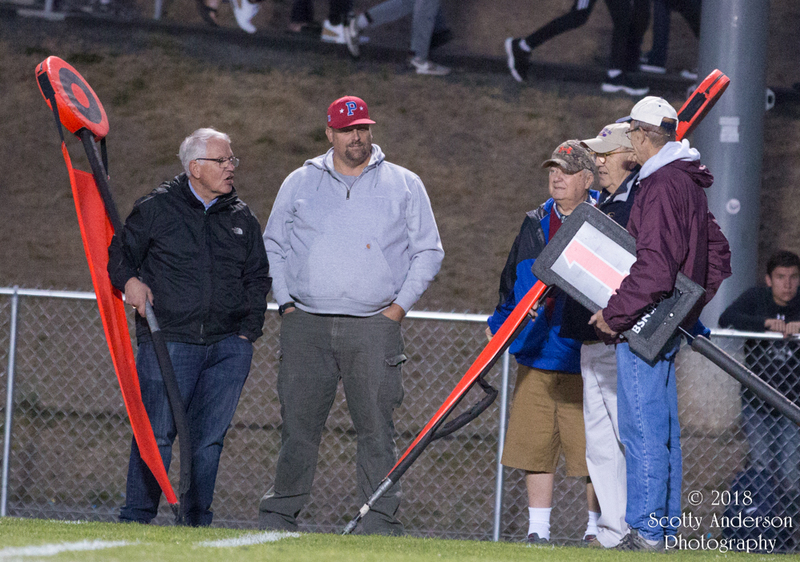 I also had my new Spider Pro holster system in place. 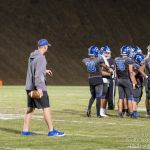 This is a belt worn holster that allow my cameras to sit securely on my hips rather than around the neck which causes neck and back pain. 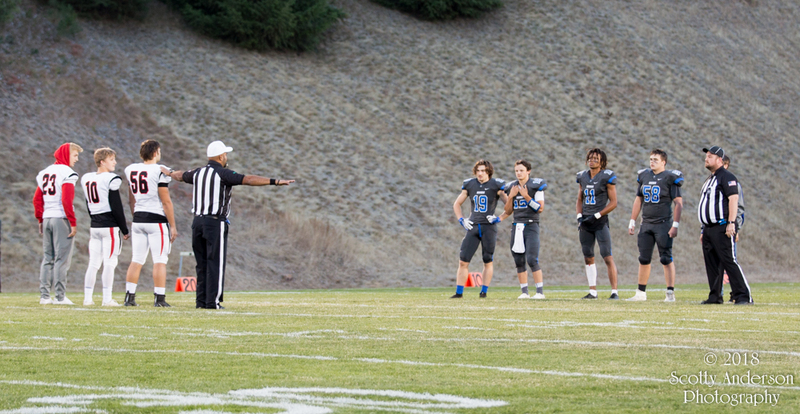 The system worked very well. 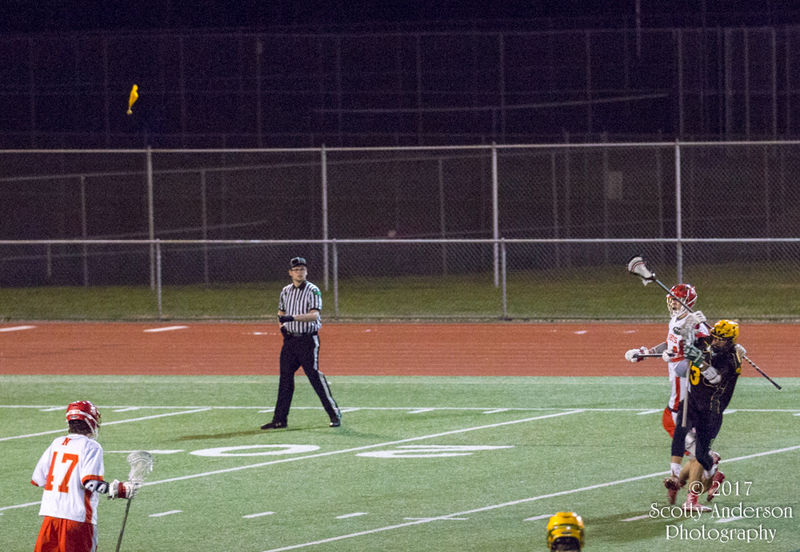 By the end of the game my muscle memory was helping me switch the cameras quickly. 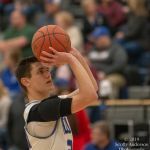 This was my first game shooting basketball. 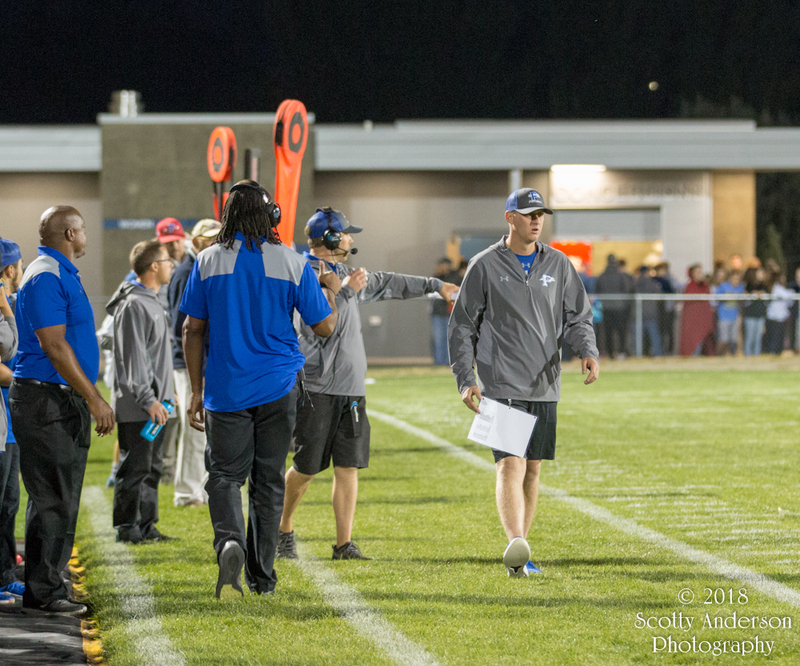 I stayed on one sideline for the entire game. 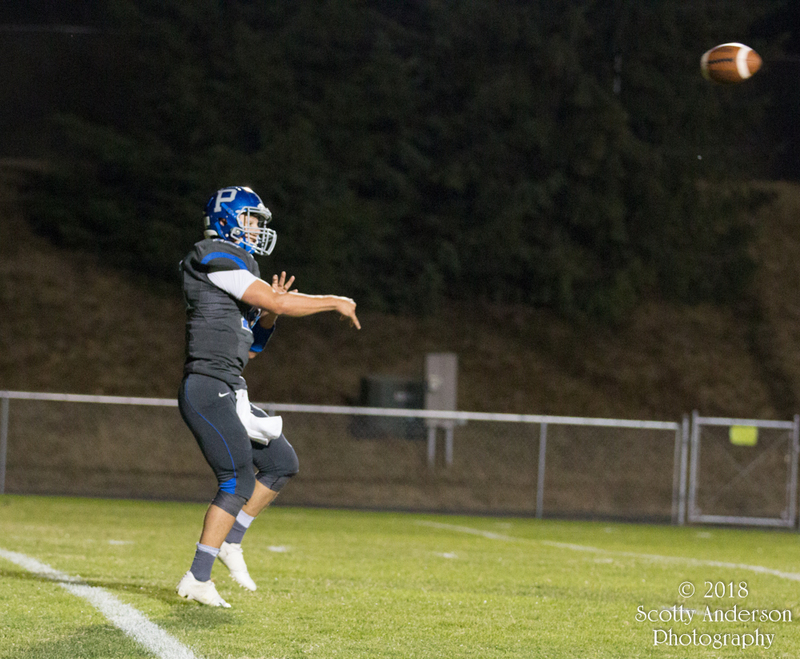 In the first half I was on the Pullman end. 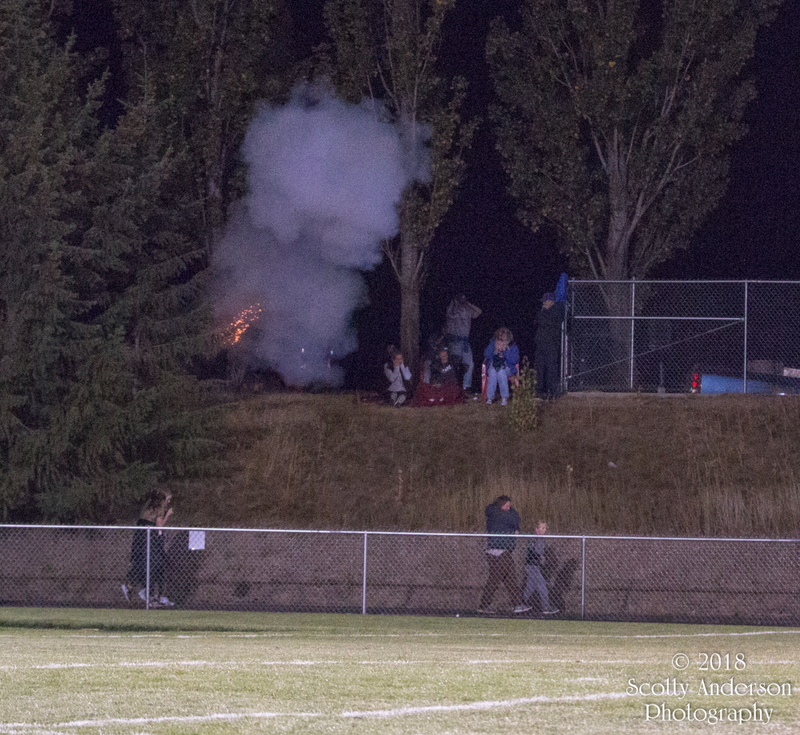 The second half I was on Cheney’s end. 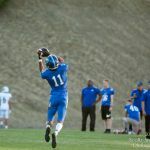 This game me a chance to be close to Pullman when on Offense and on Defense. 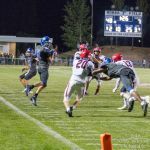 This evening I was given the opportunity to step on the field as a photographer at the Pullman High School football game. 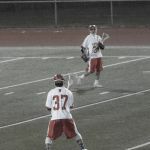 This was my first chance to get up close to the game action. 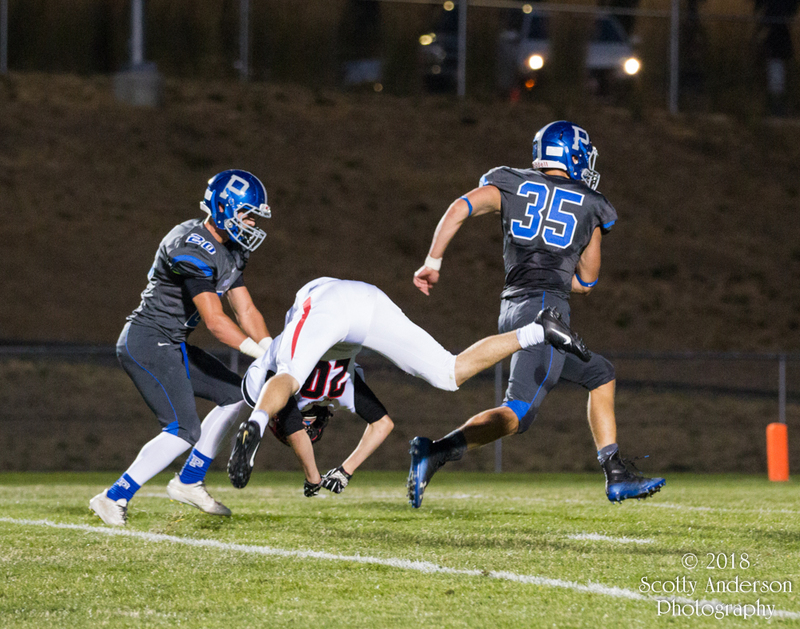 I had a great time doing this shoot. 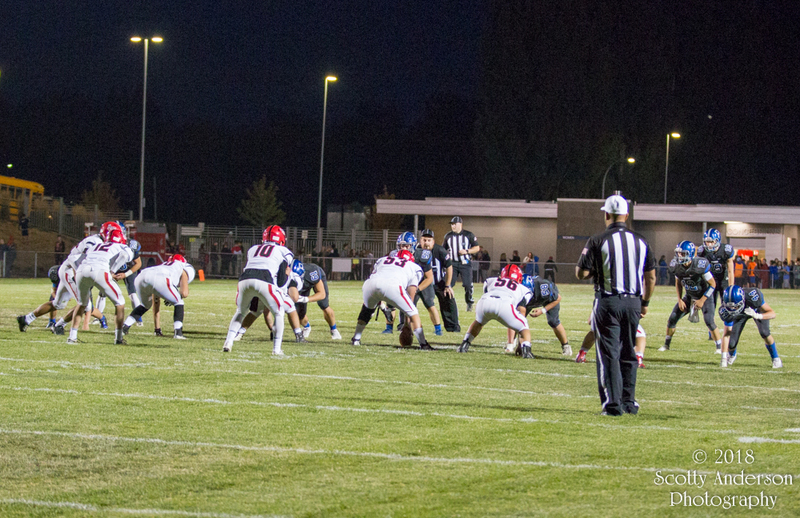 I tried getting photos for multiple angles around the field. 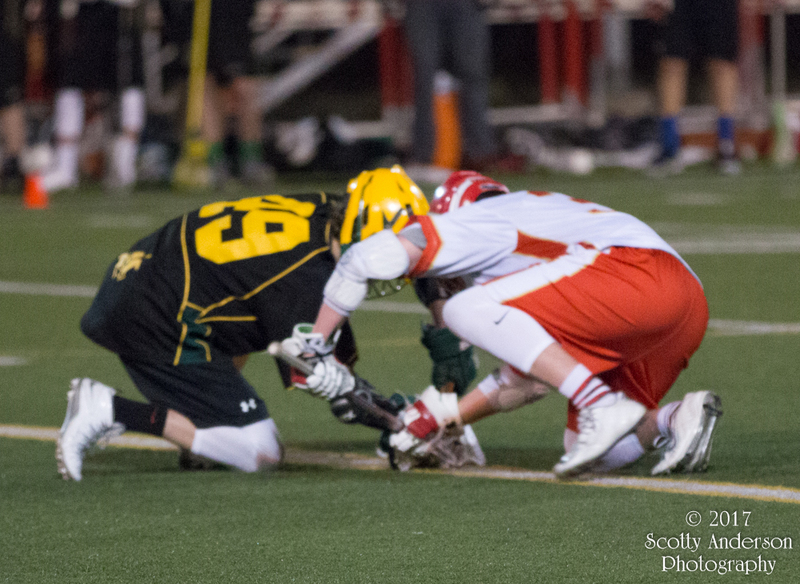 I used my Canon 70D with a Canon 70-200 f/2.8 IS USM II lens. 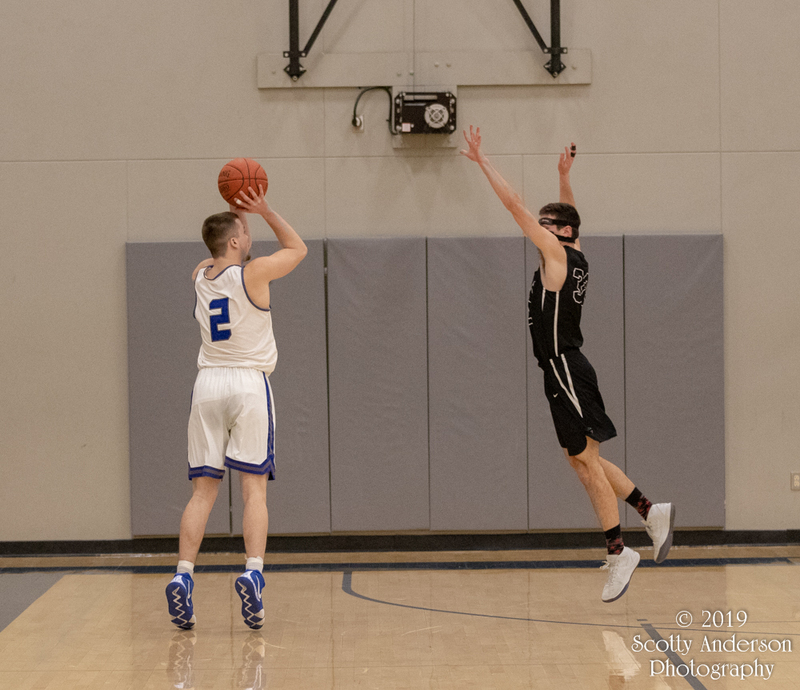 I had to pump up the ISO setting pretty high to allow my shutter speed to be fast enough to mostly eliminate the blur from the action in the photos. 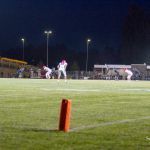 Pullman High School played Moscow (Idaho) High School at Hobbs Field in Pullman. 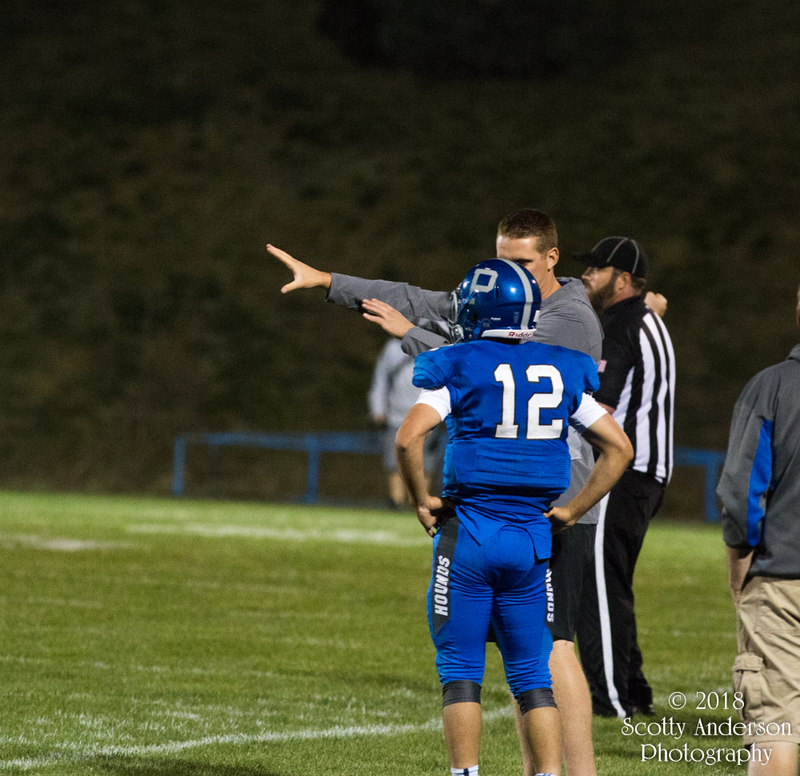 It was all Pullman. 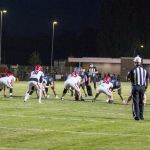 After the first half of play the score was 41 – 7. 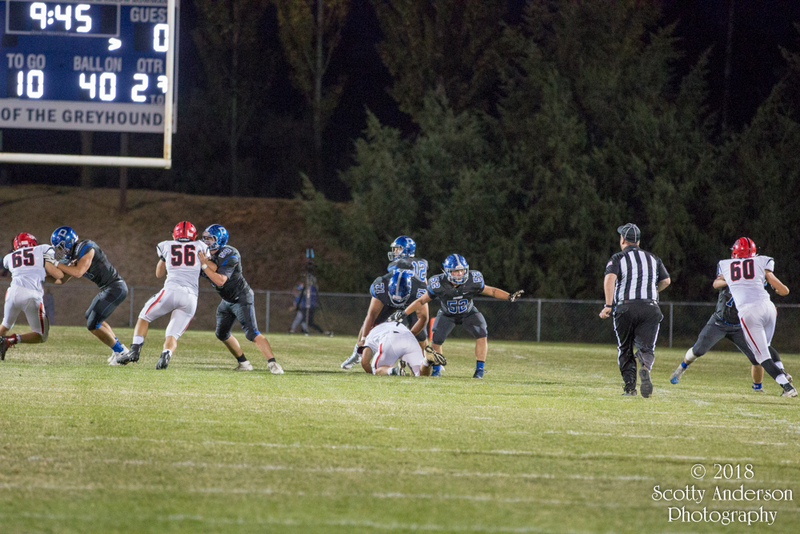 Pullman scored in the second half and started the running clock rule for the game. 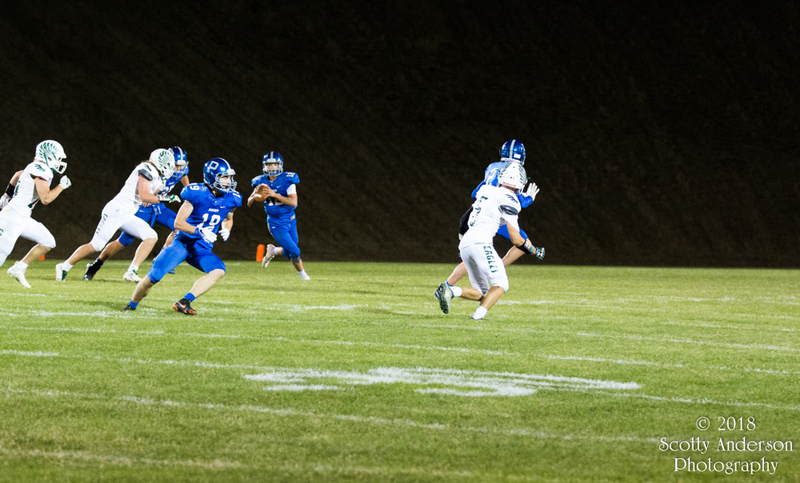 The final score was 48 – 7. 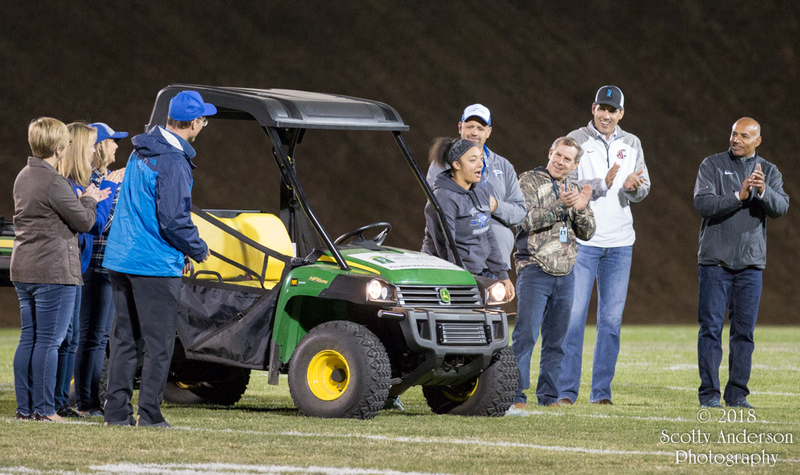 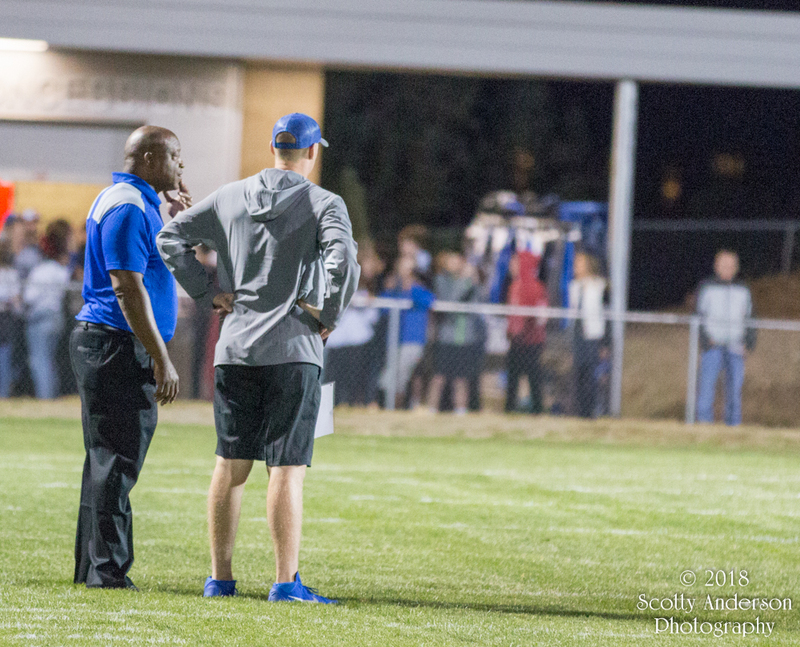 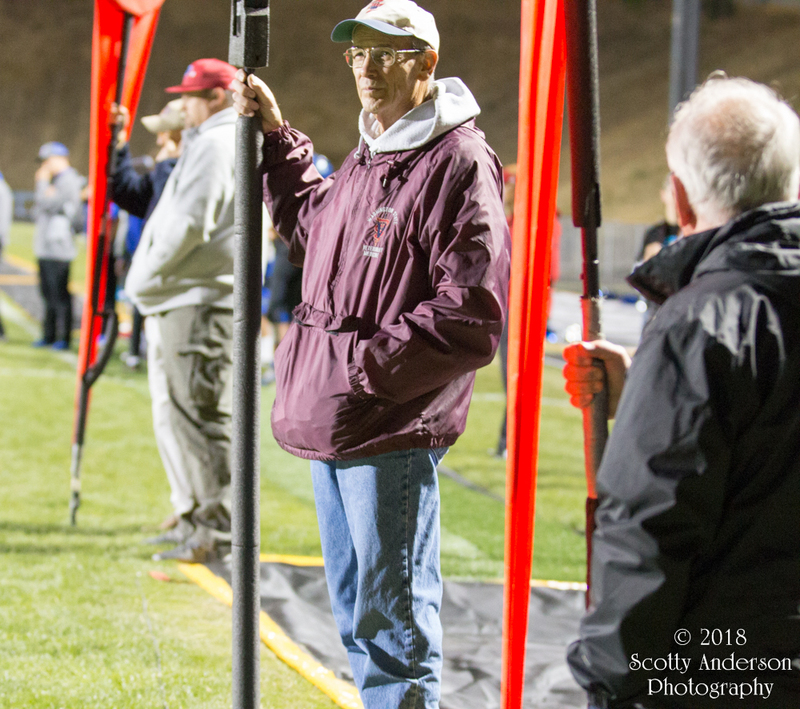 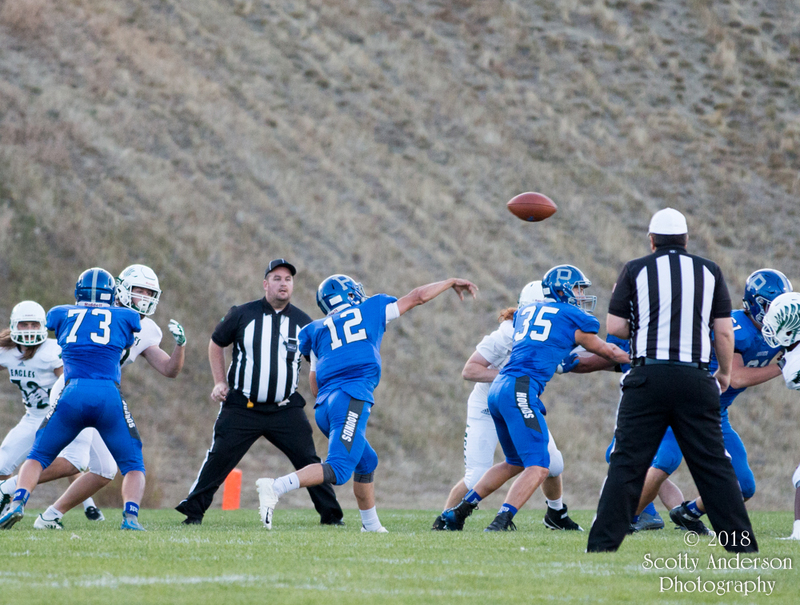 This evening I went to the Pullman High School football game against Lakeside High School. 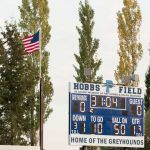 The game was held at Hobbs Field in Pullman. 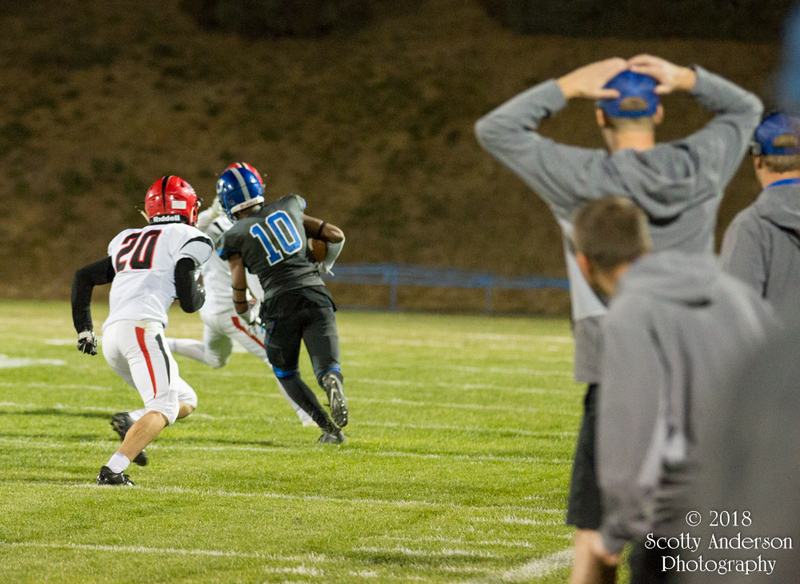 I shot all my photos with my Canon 70D with my Canon EF 70-200mm f/2.8L IS II lens. 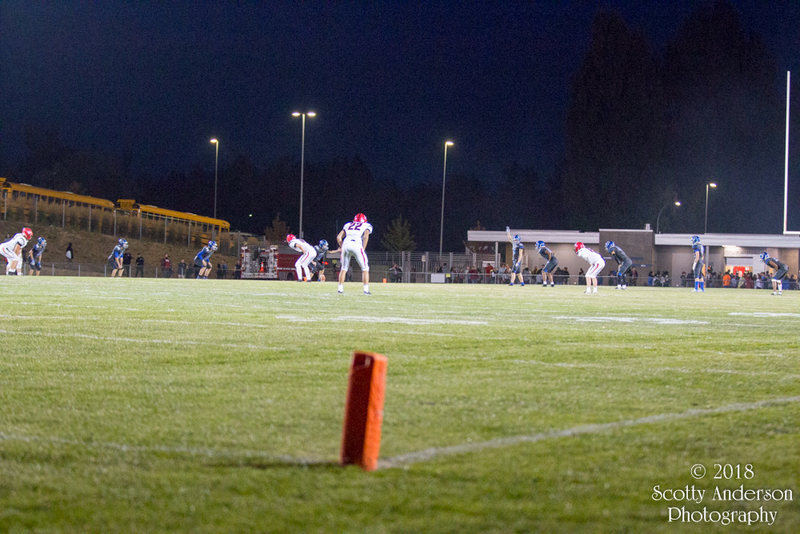 As the day turned to night I had to increase my ISO setting in order to be able to get the faster shutter speed for football. 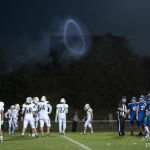 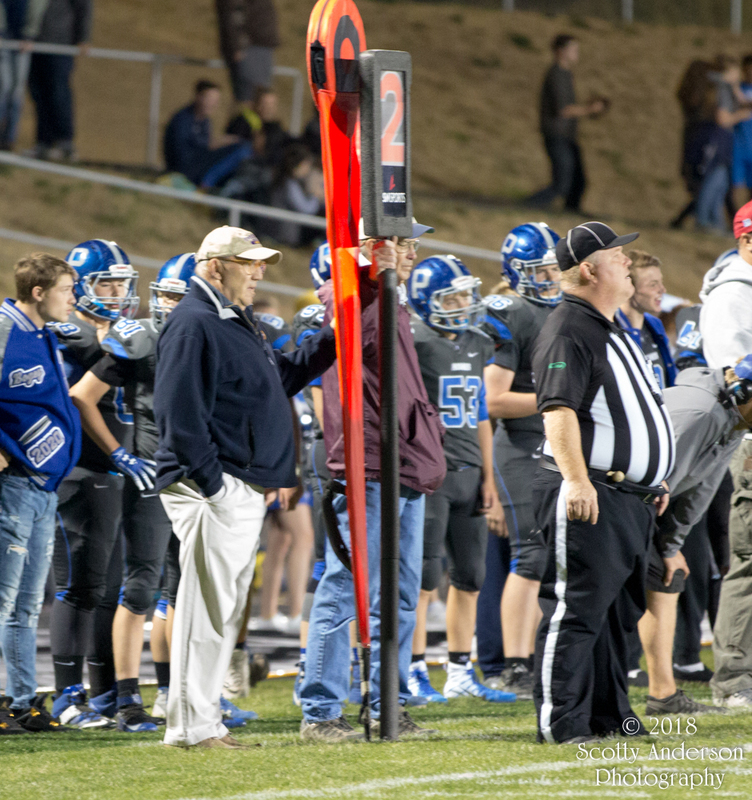 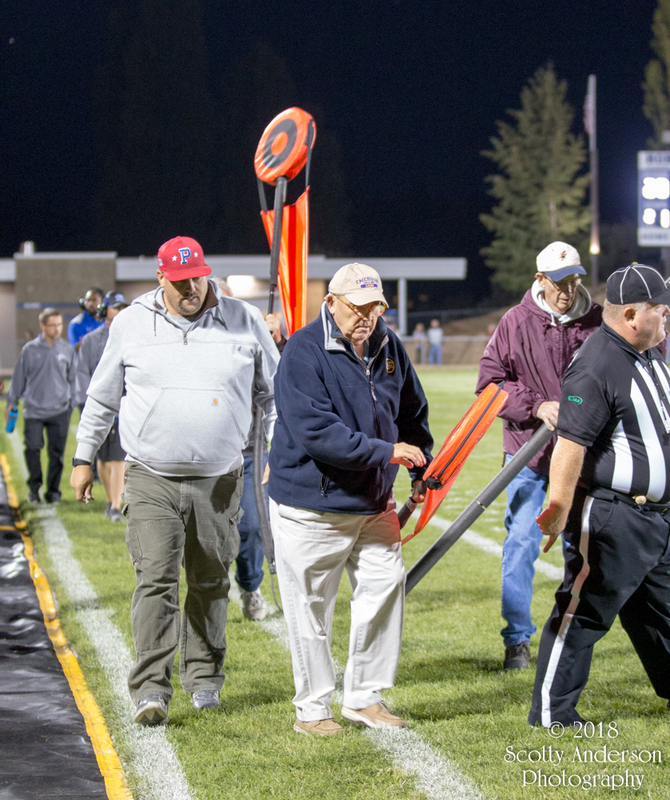 This was my second high school football game and the first one where I was near the sidelines. 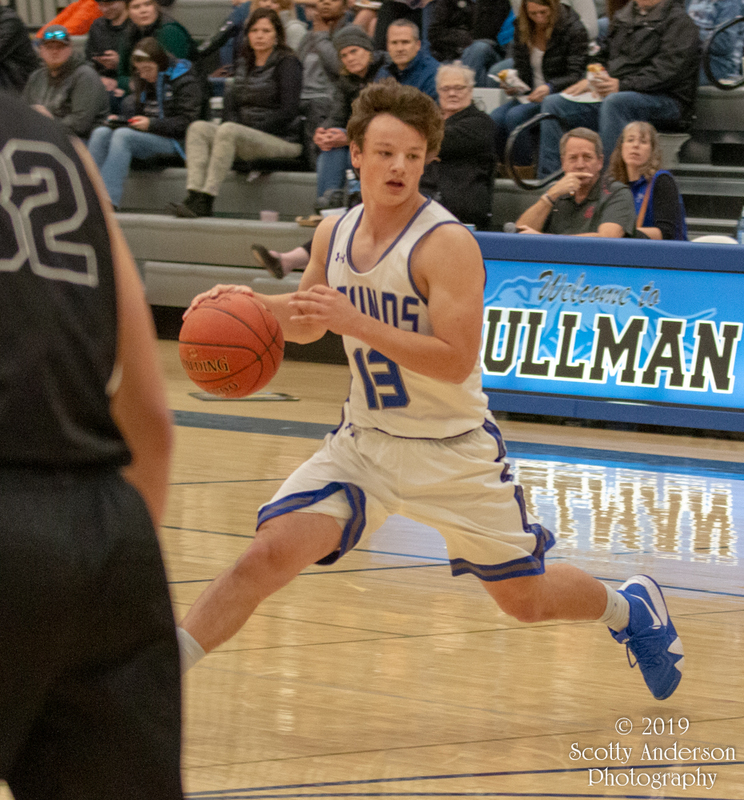 Pullman High School went into half time with a 21 – 16 lead. 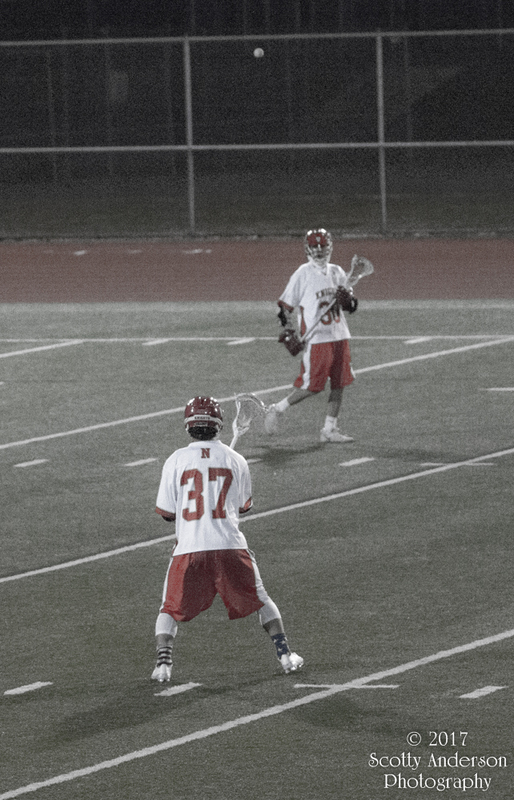 After half they came out and got down to business. 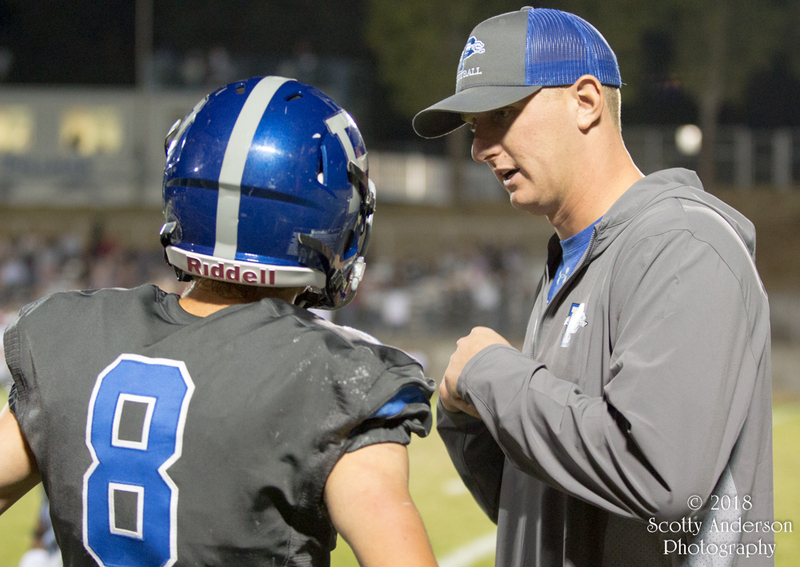 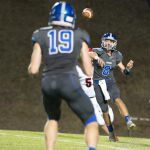 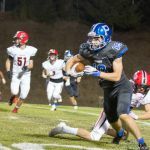 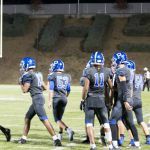 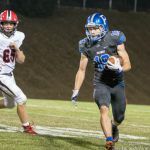 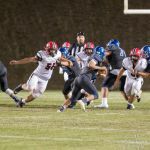 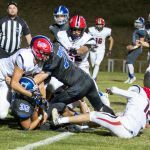 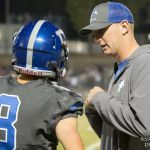 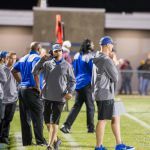 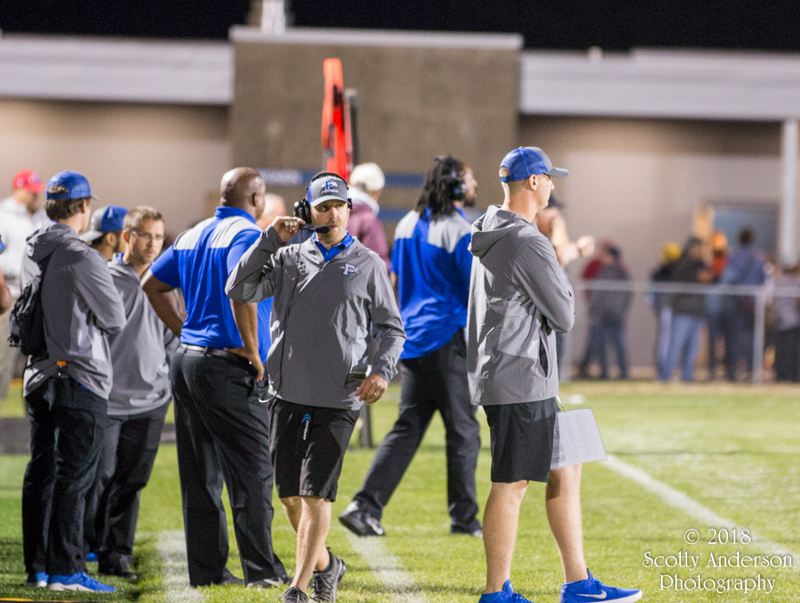 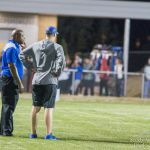 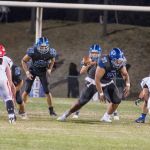 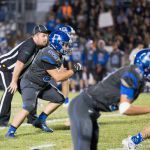 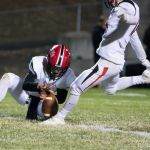 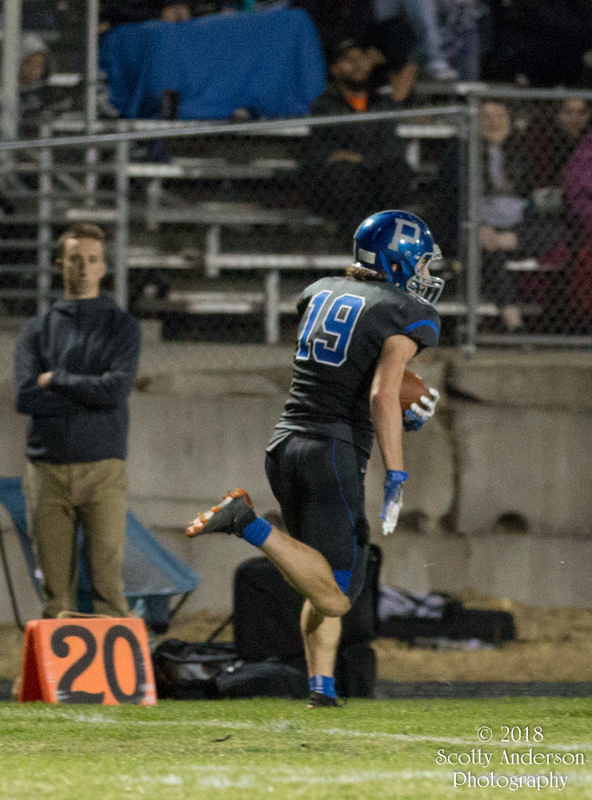 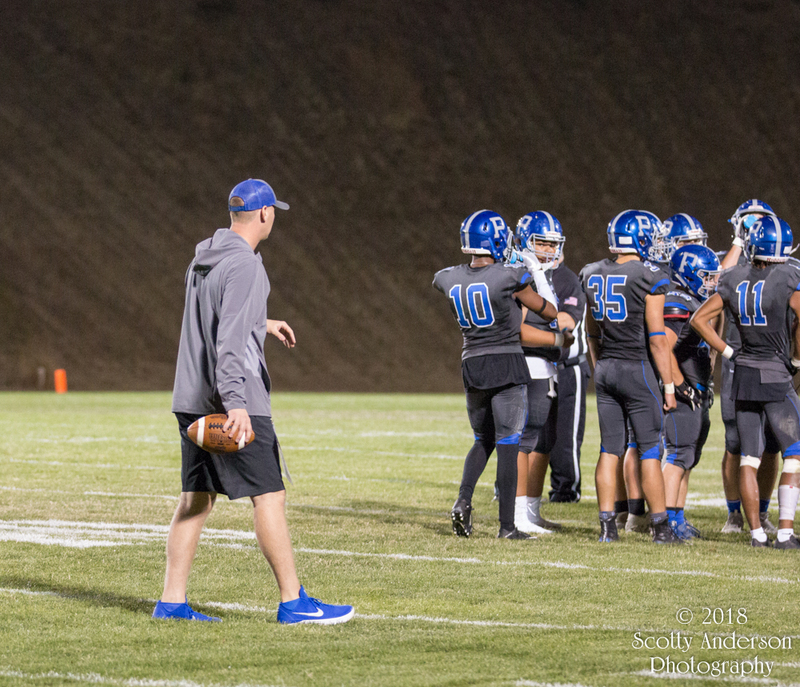 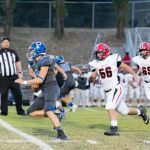 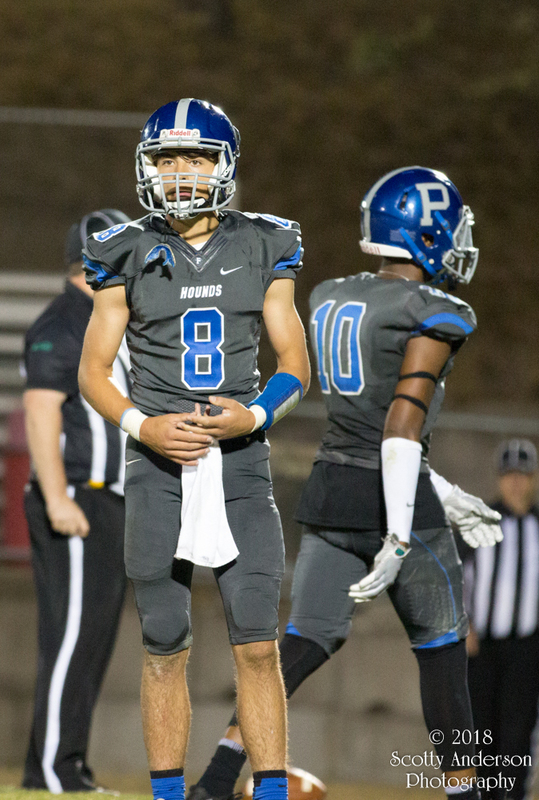 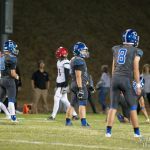 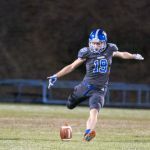 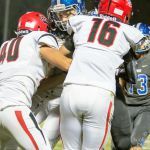 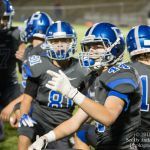 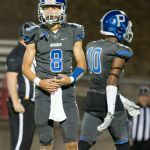 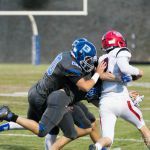 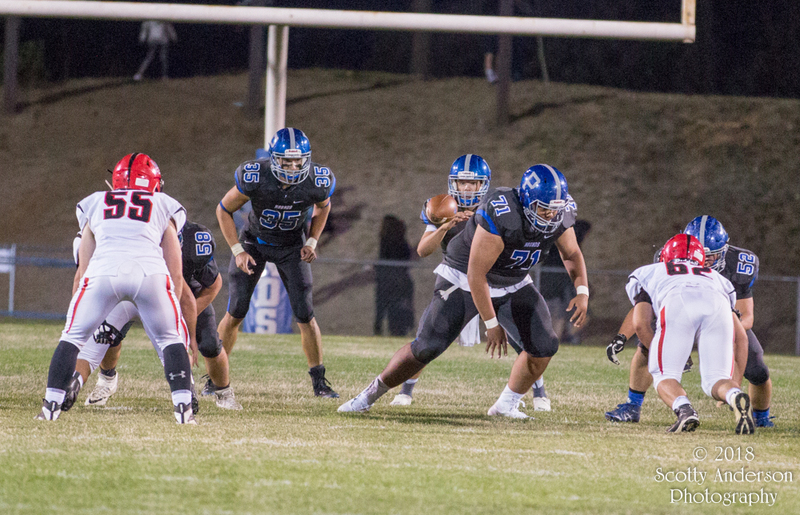 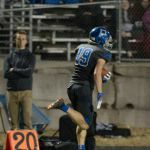 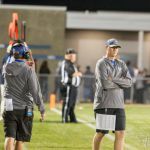 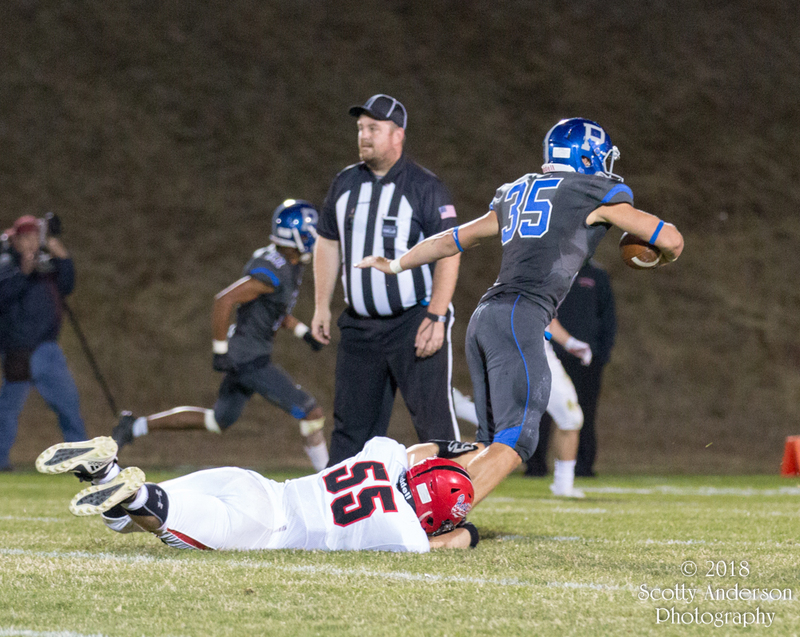 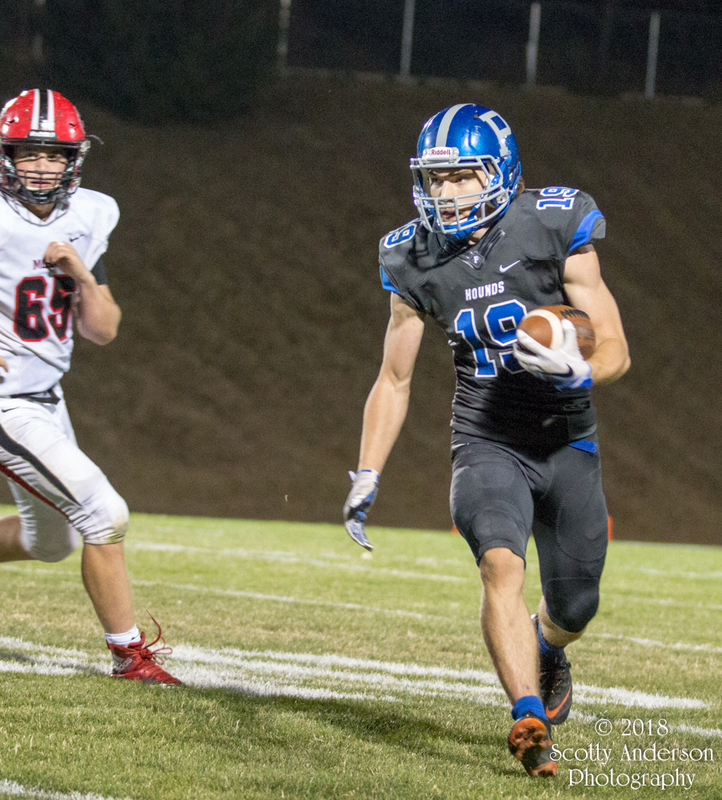 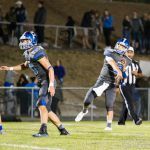 They outscored Lakeside by 20 – 7 in the second half. 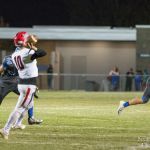 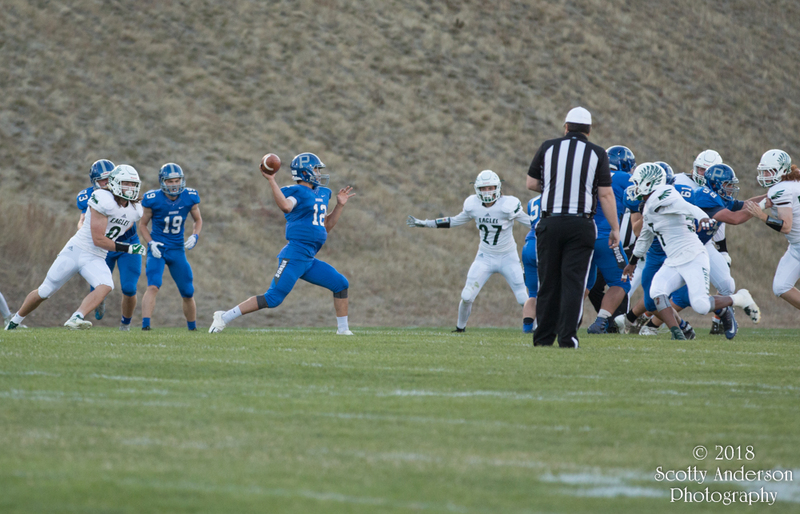 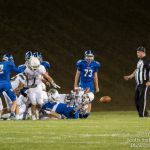 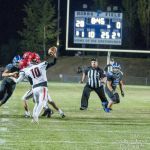 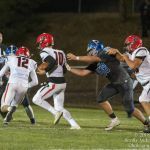 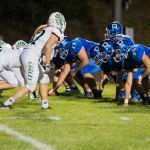 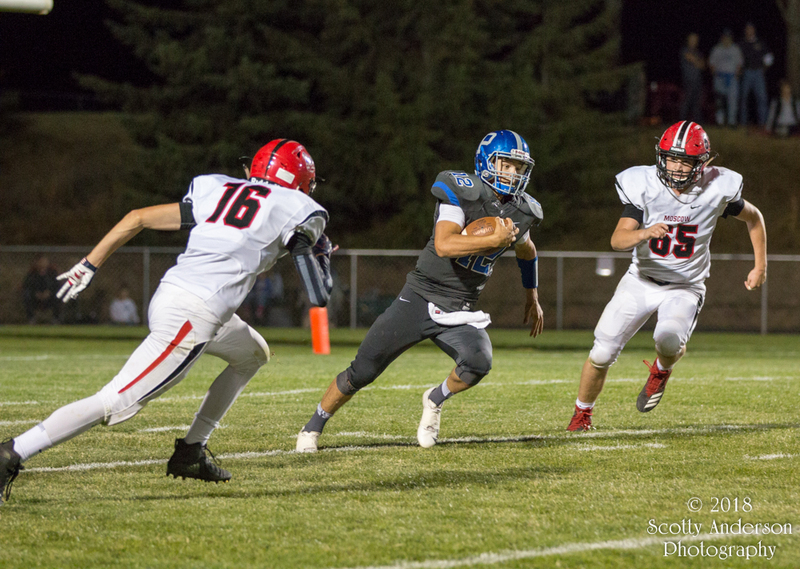 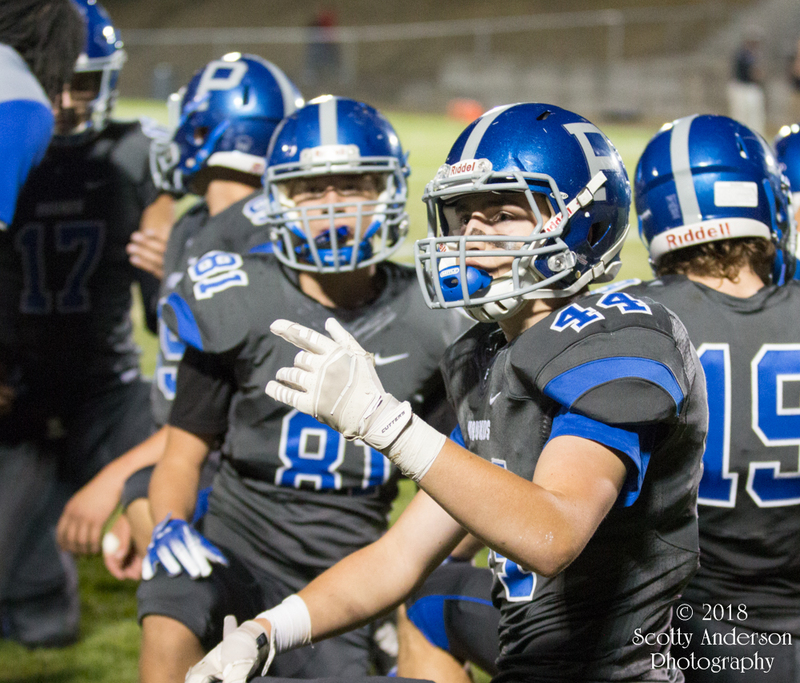 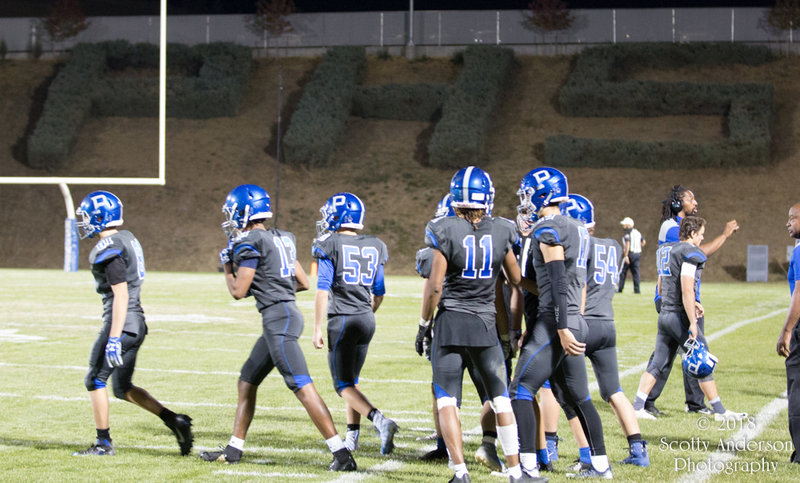 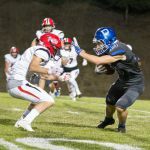 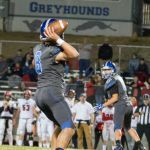 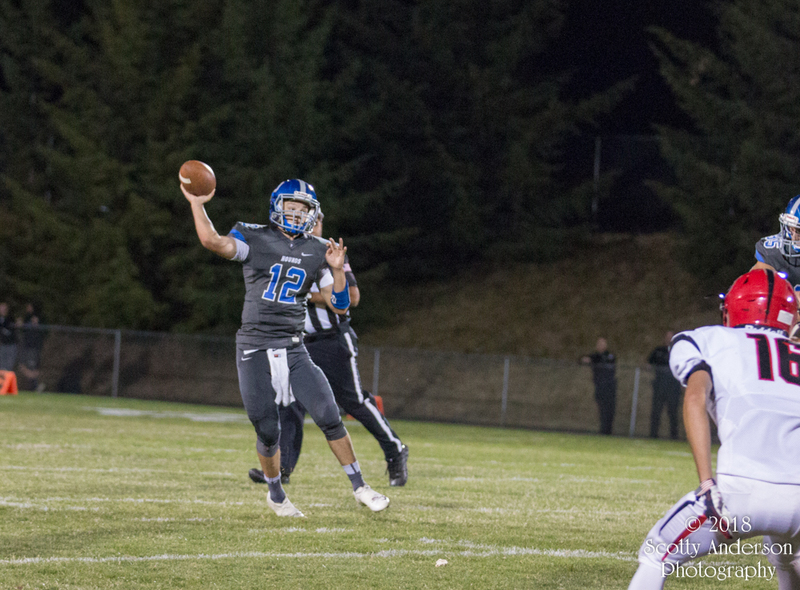 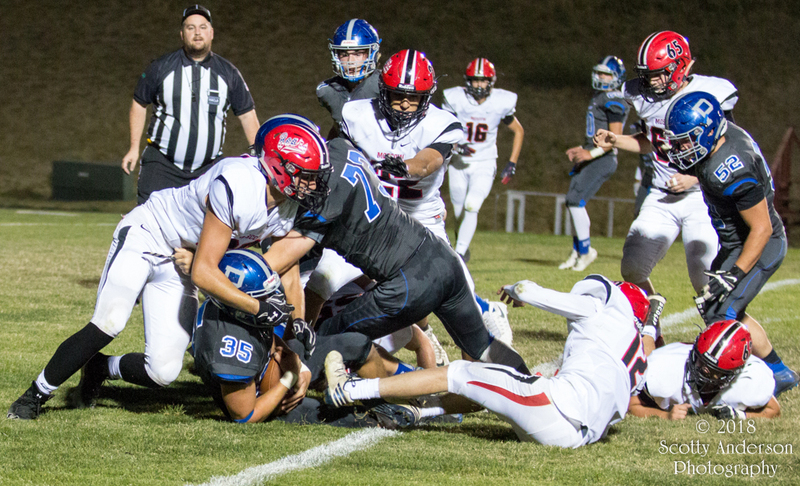 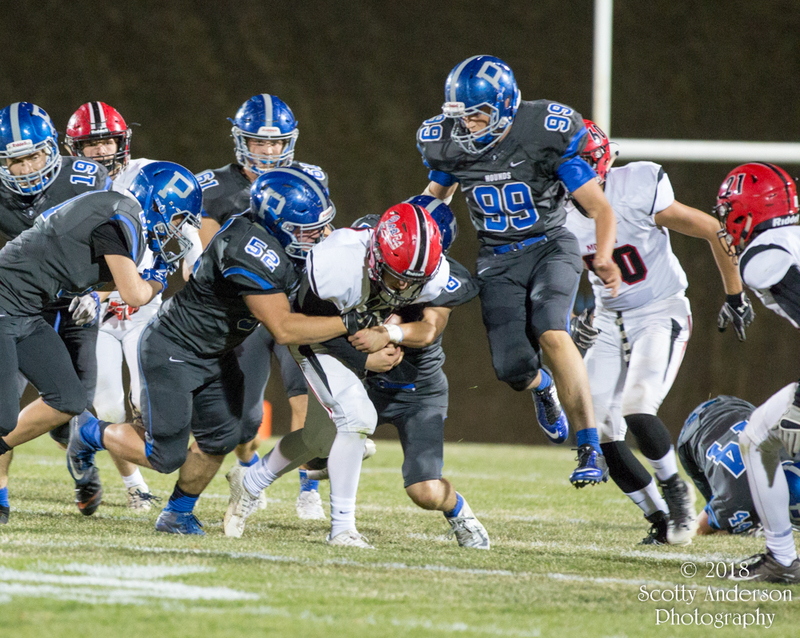 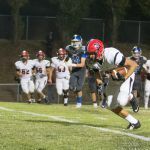 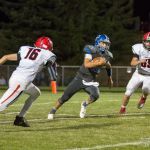 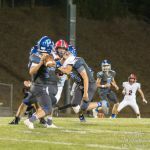 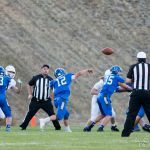 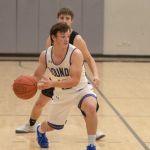 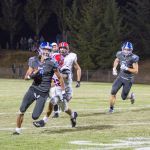 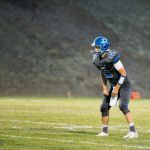 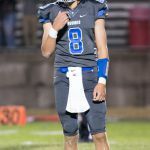 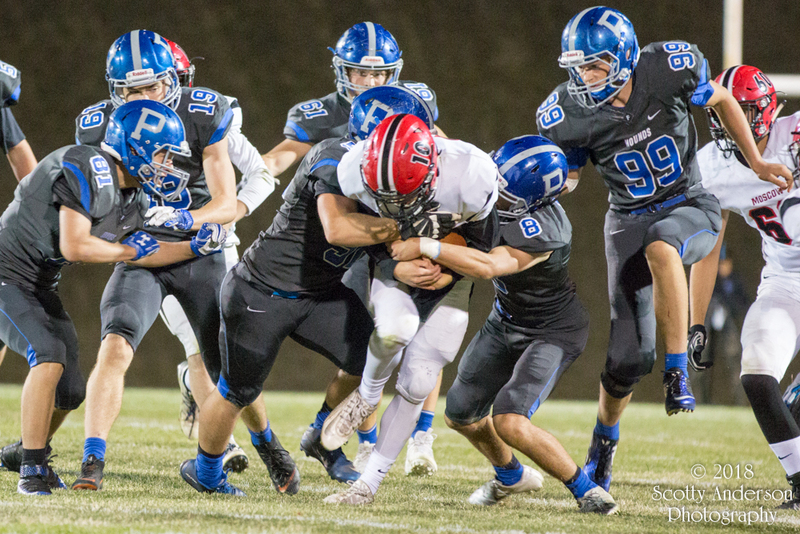 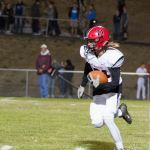 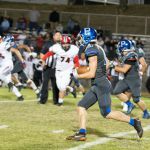 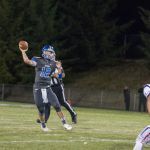 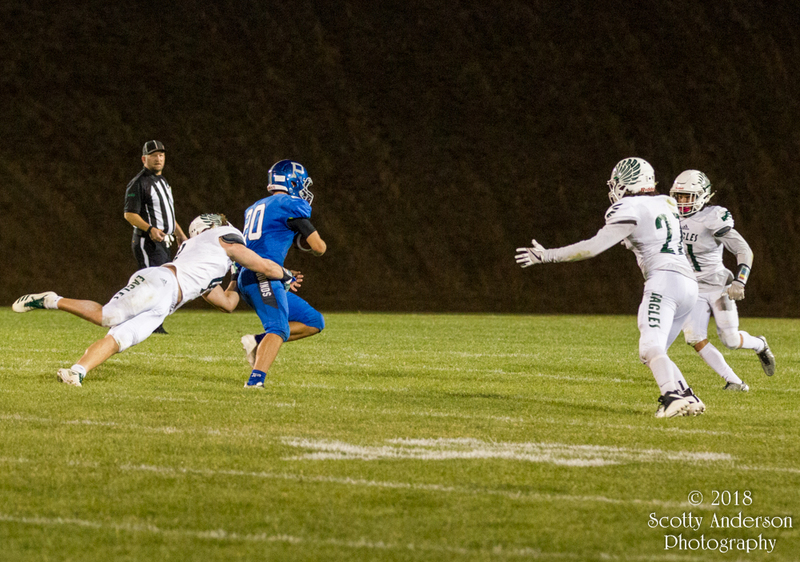 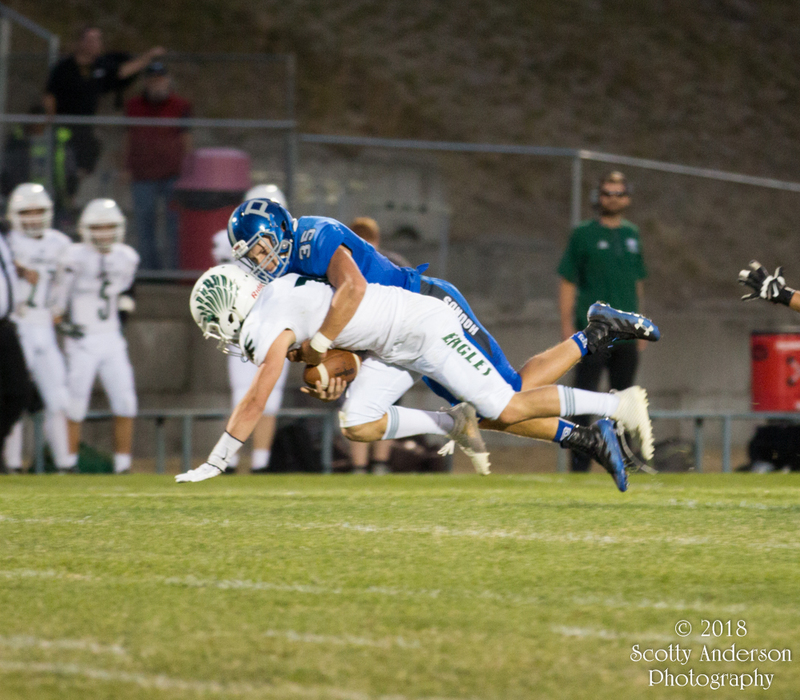 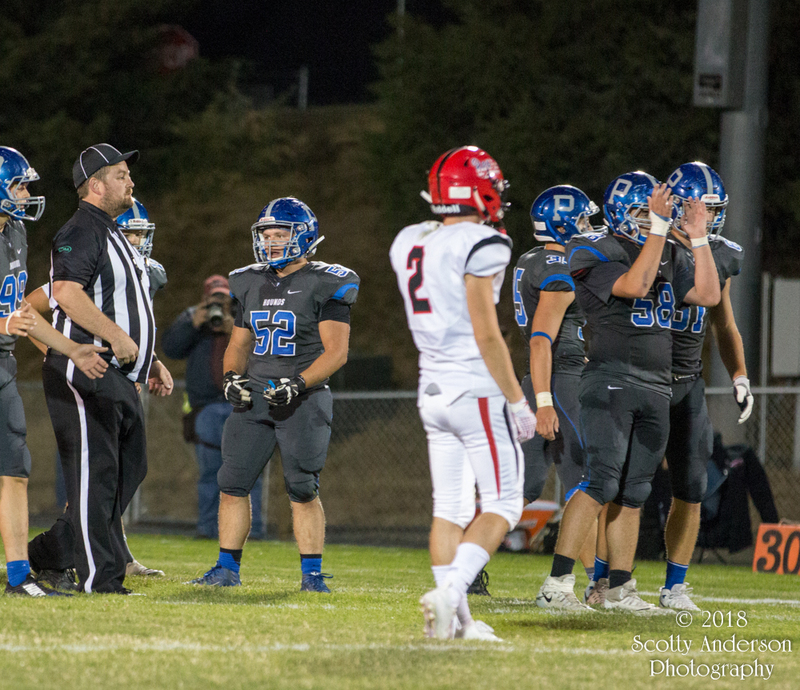 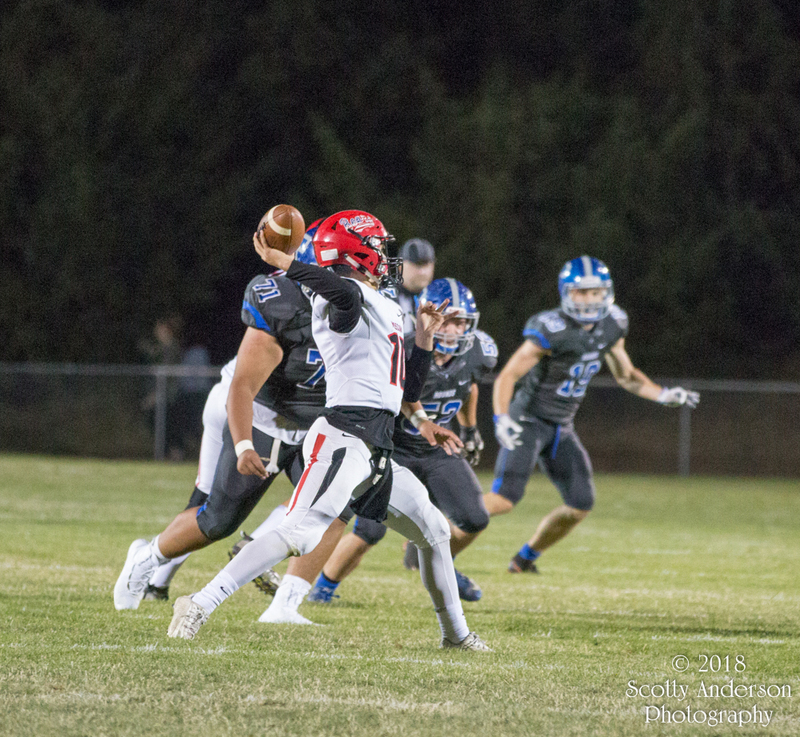 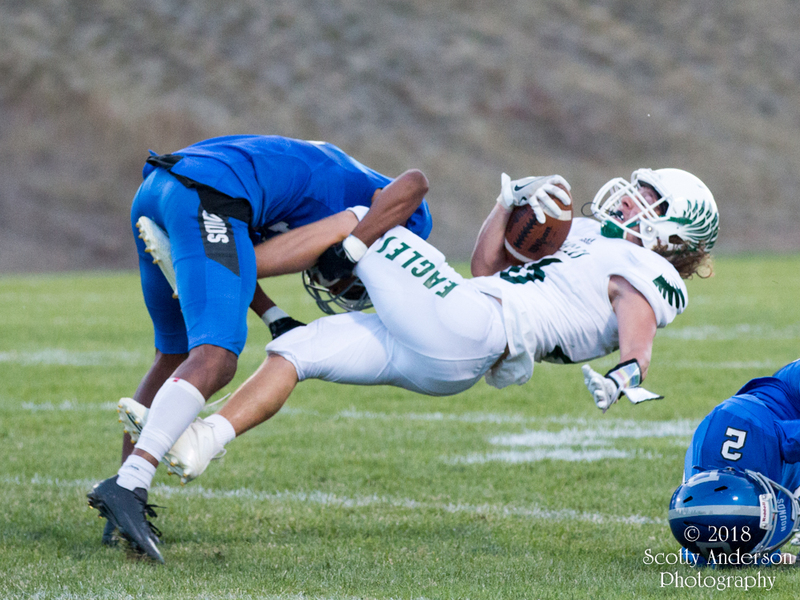 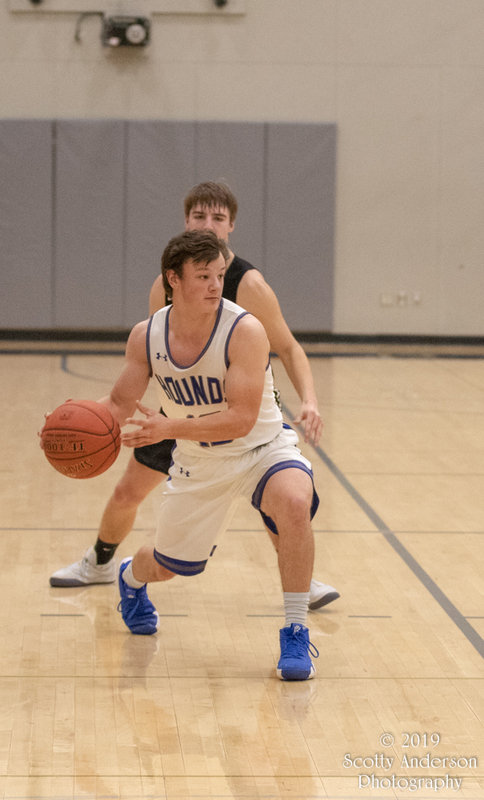 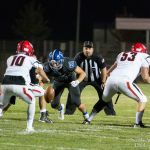 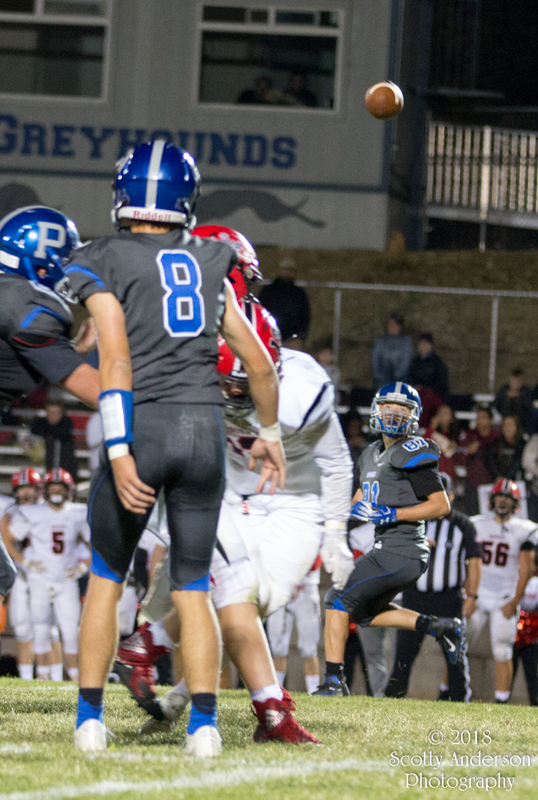 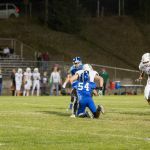 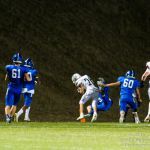 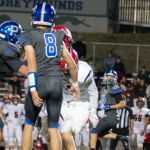 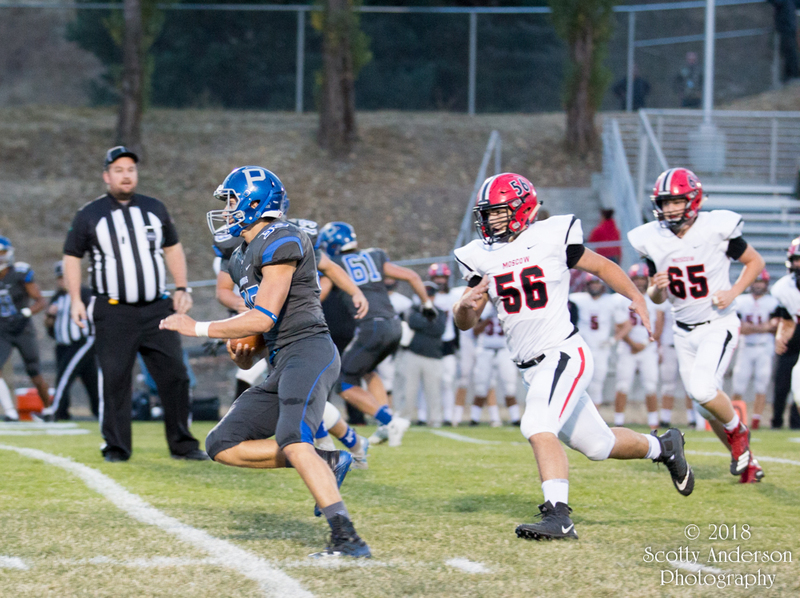 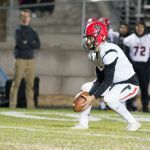 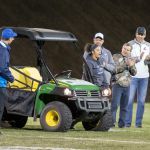 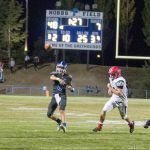 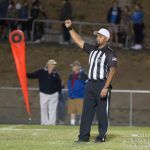 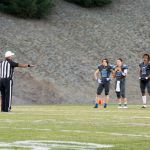 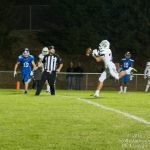 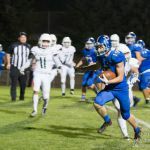 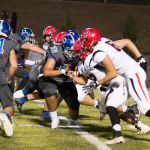 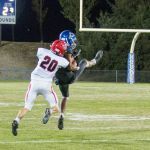 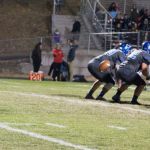 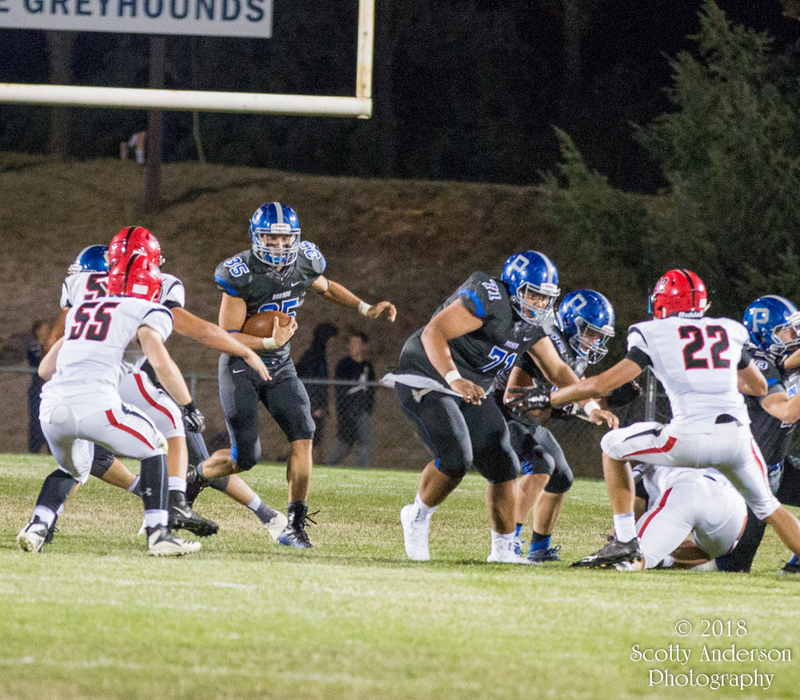 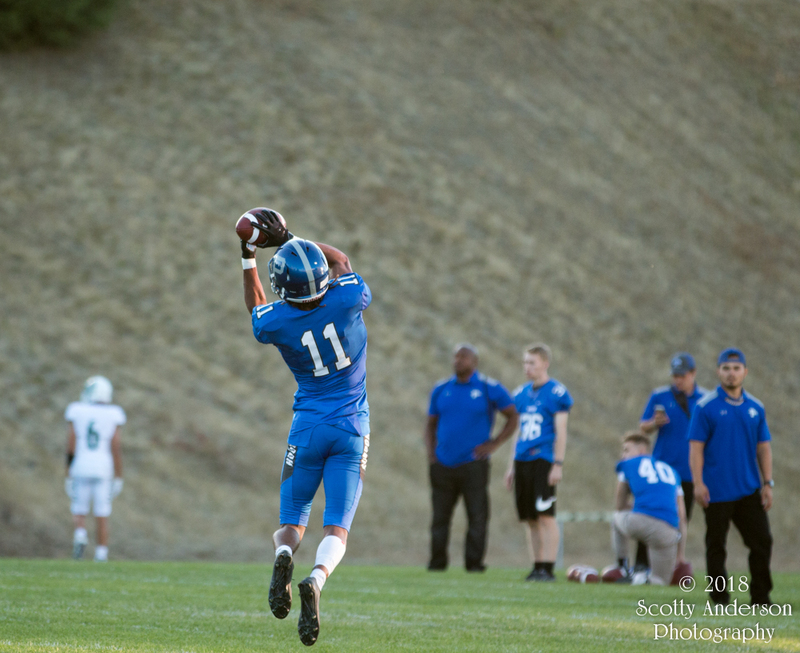 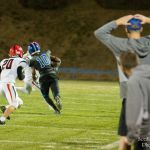 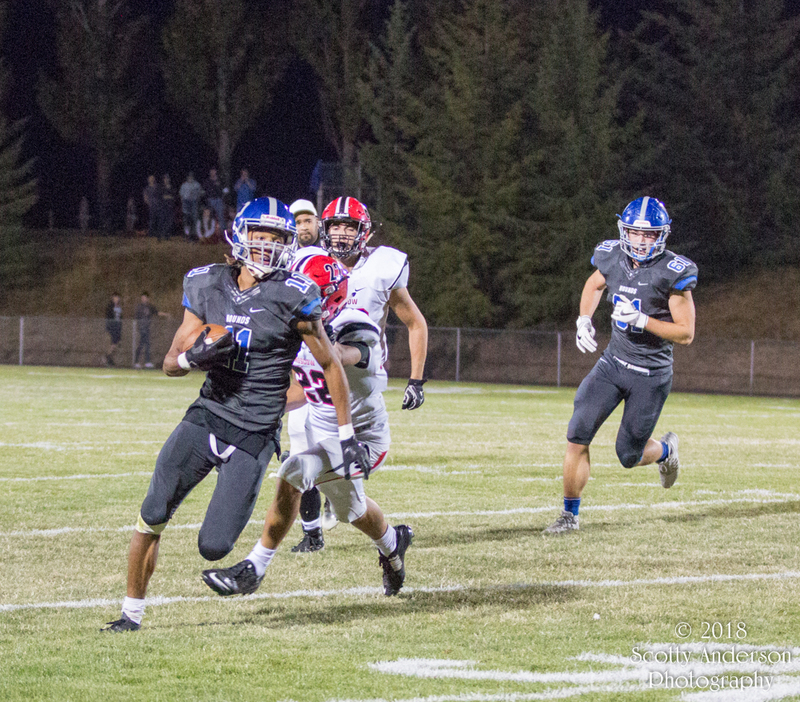 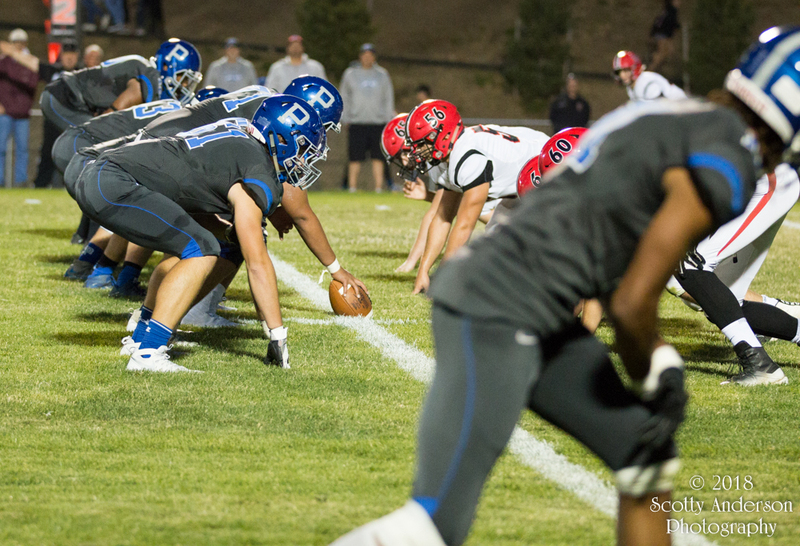 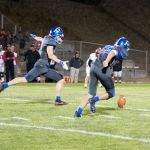 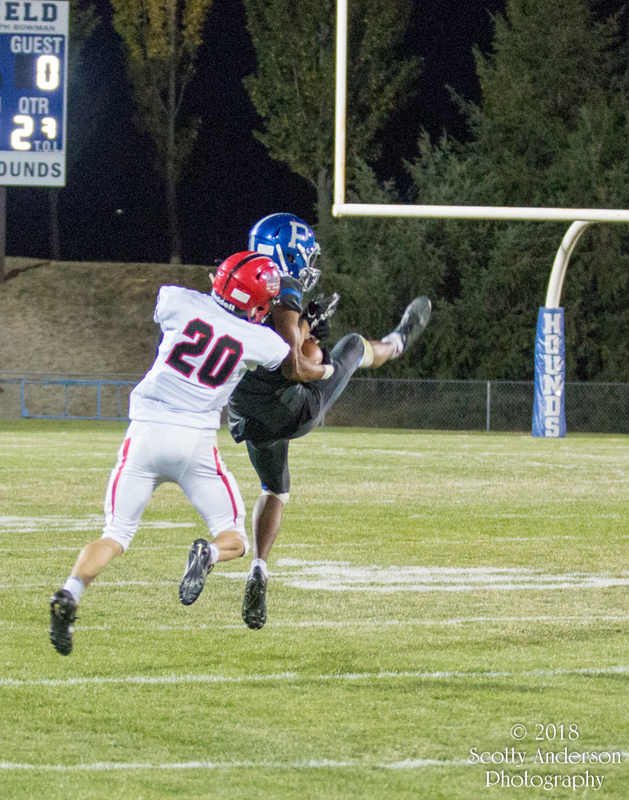 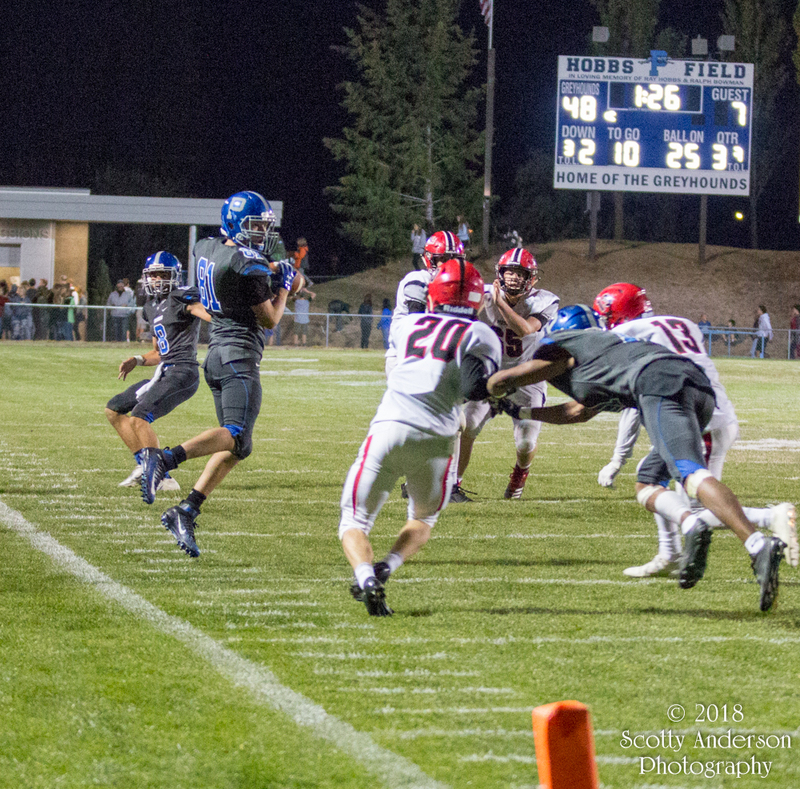 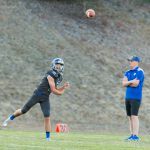 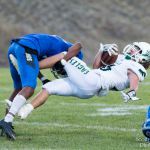 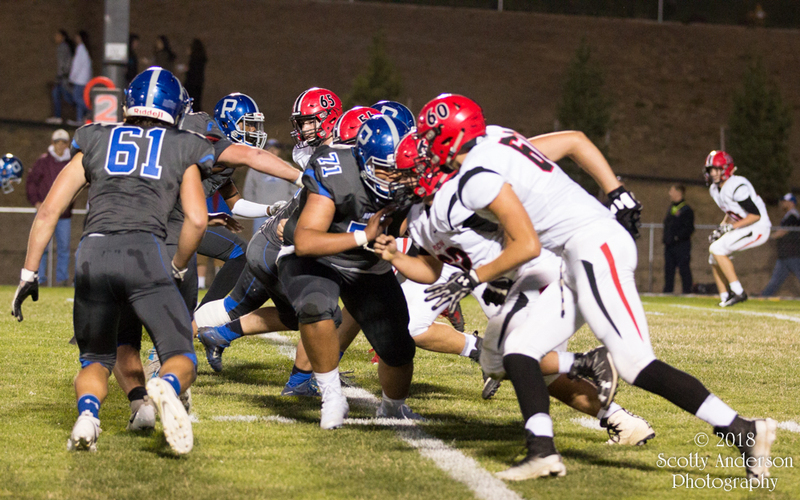 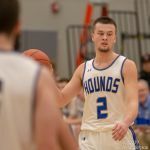 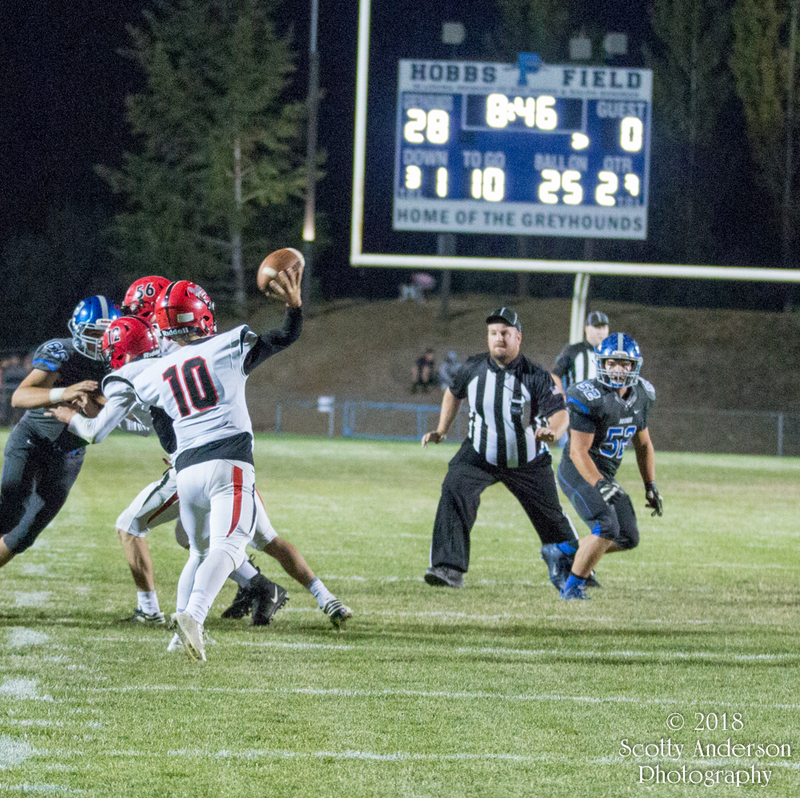 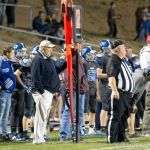 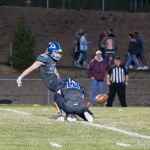 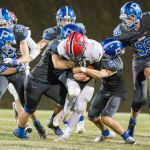 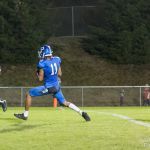 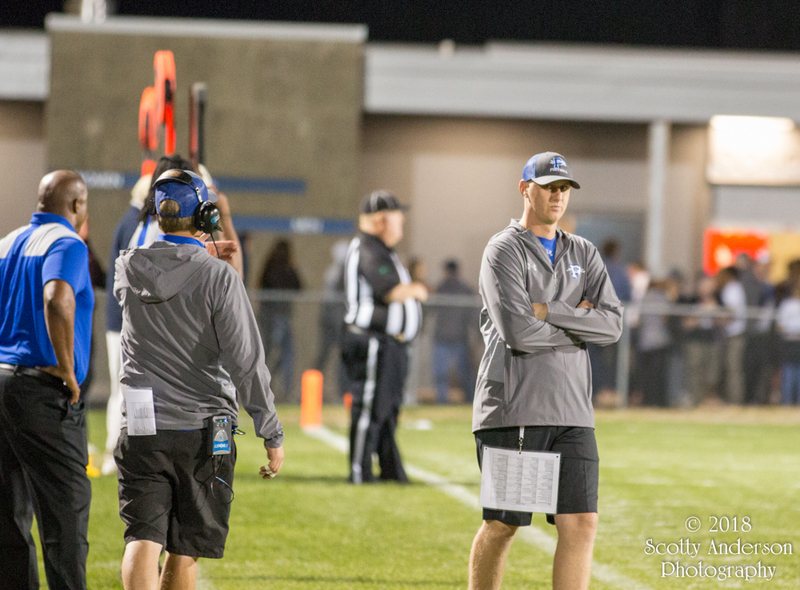 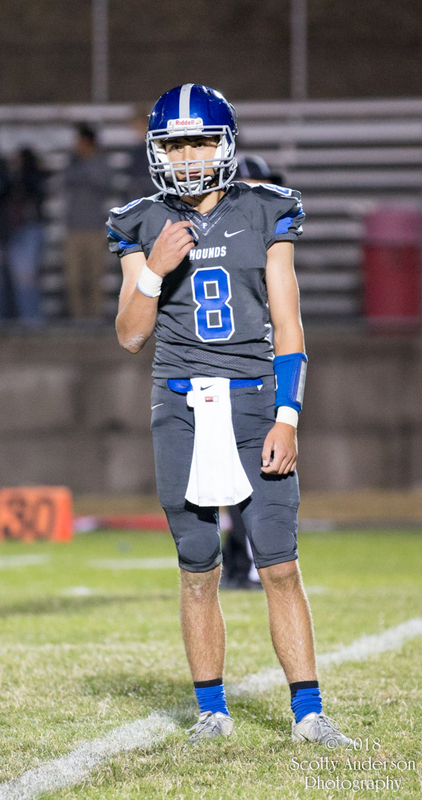 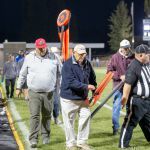 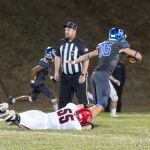 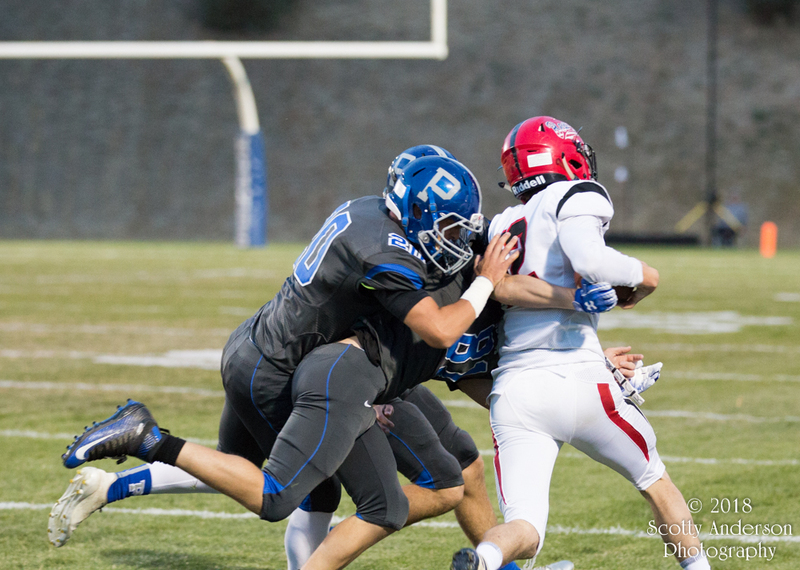 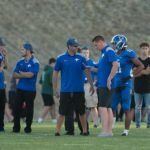 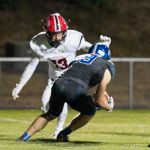 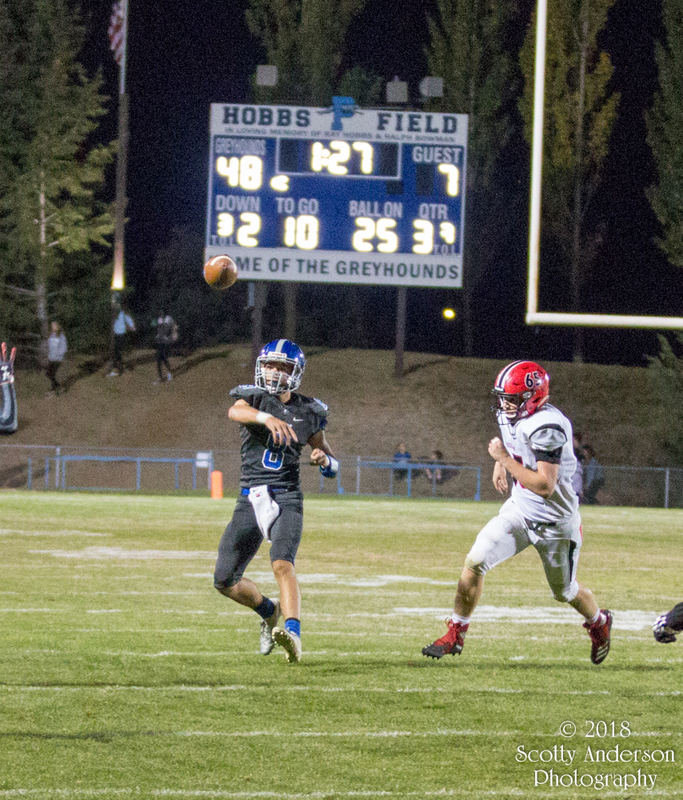 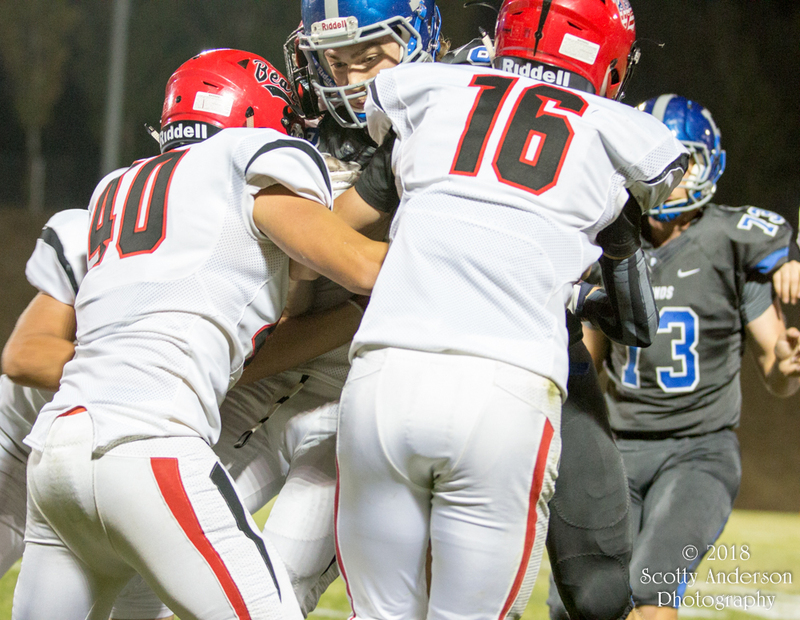 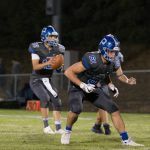 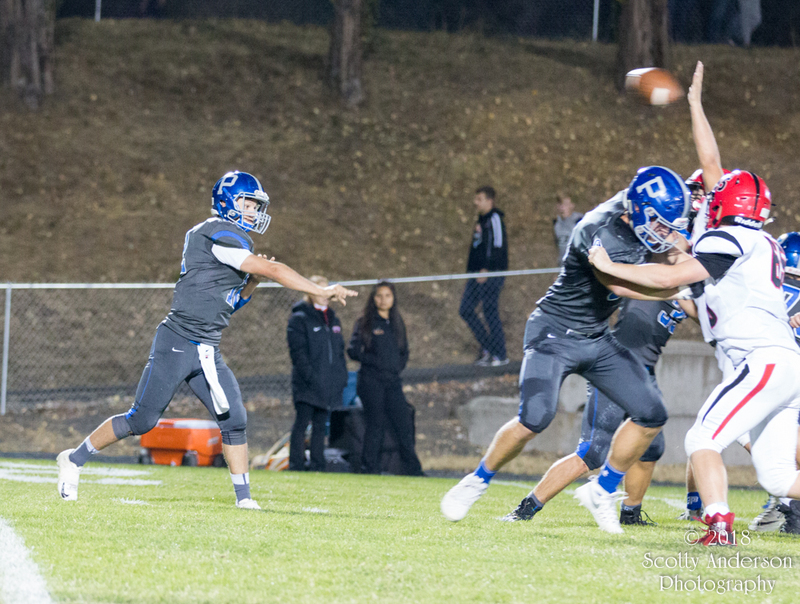 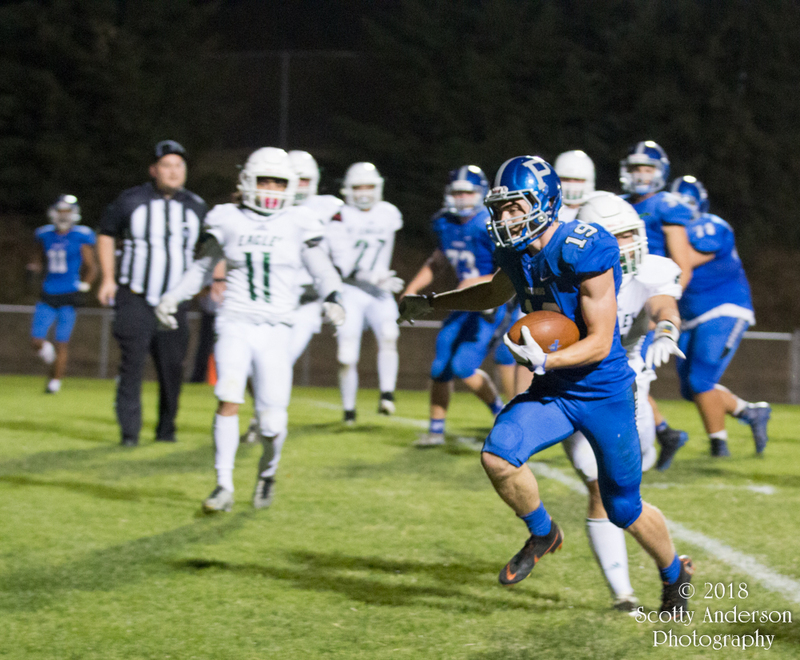 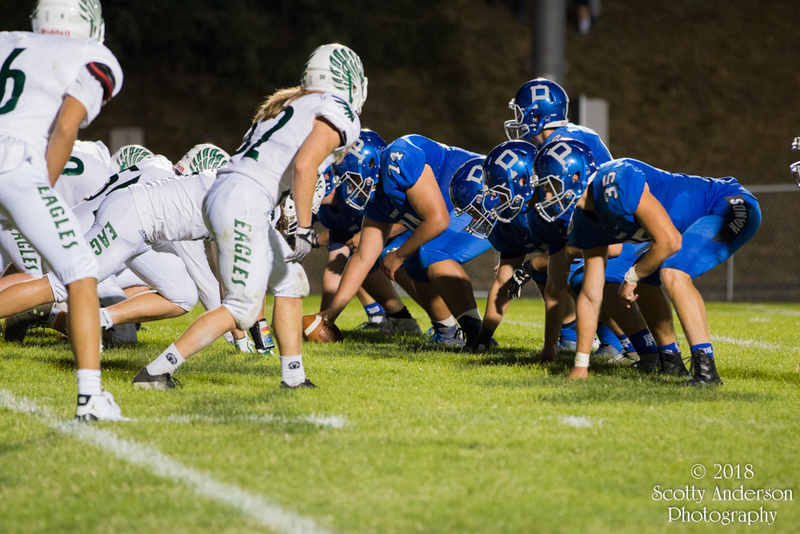 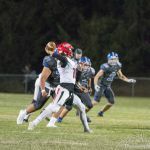 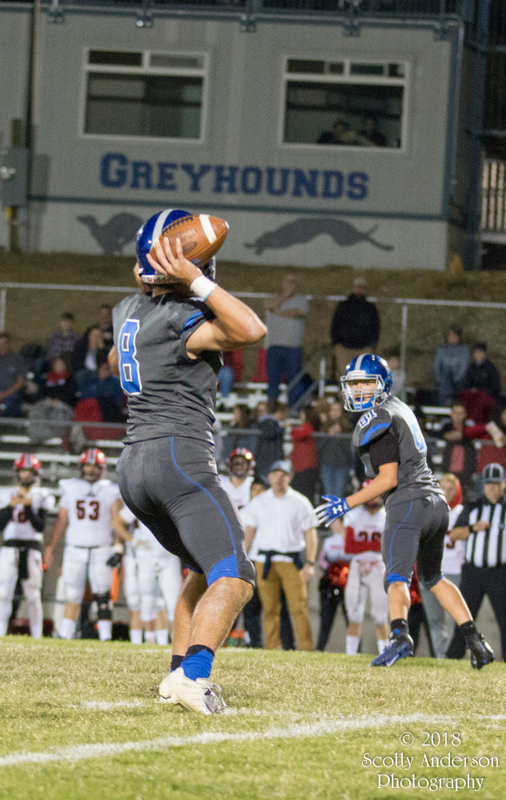 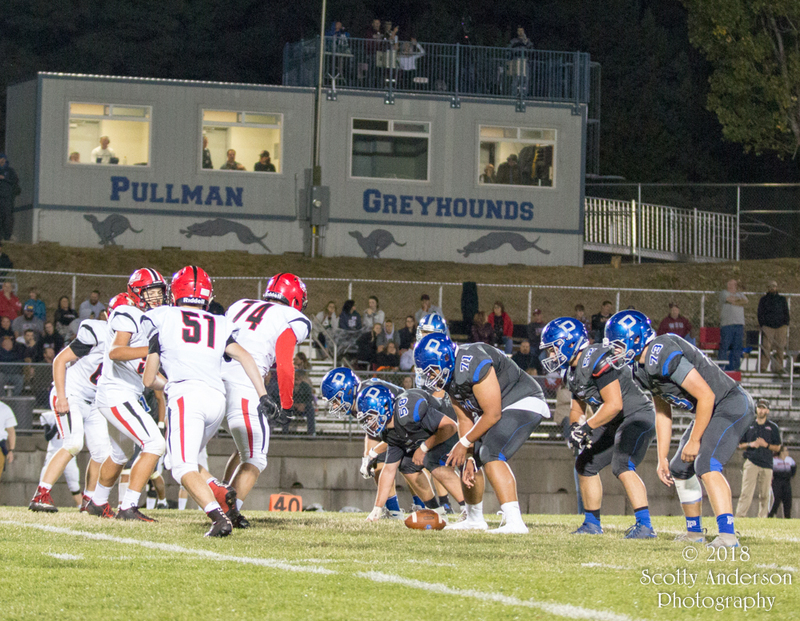 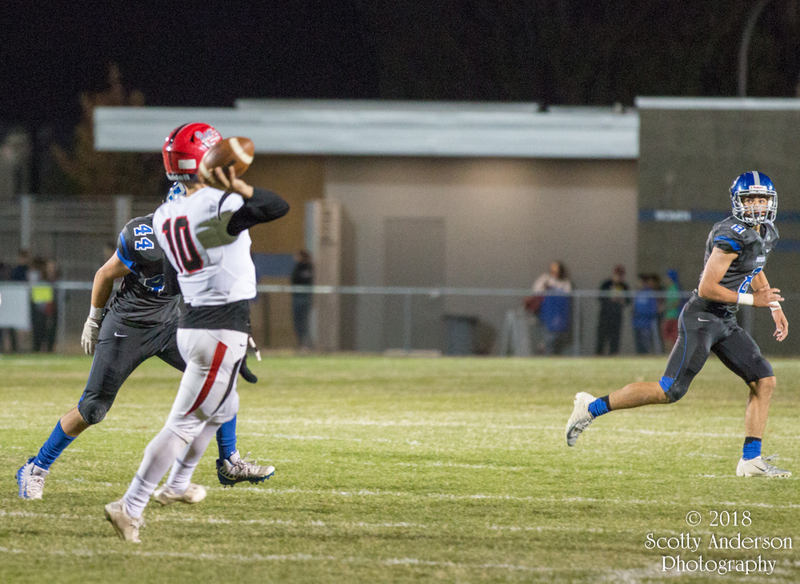 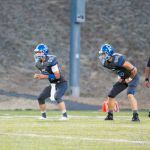 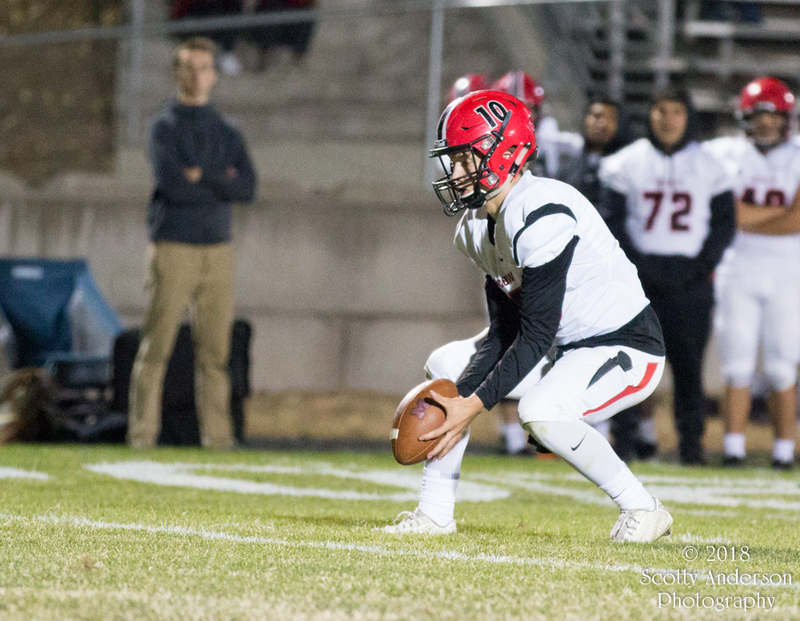 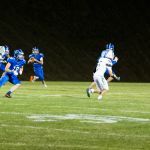 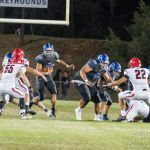 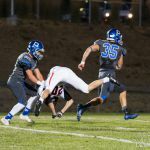 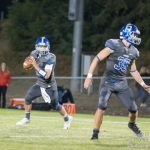 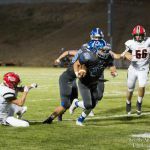 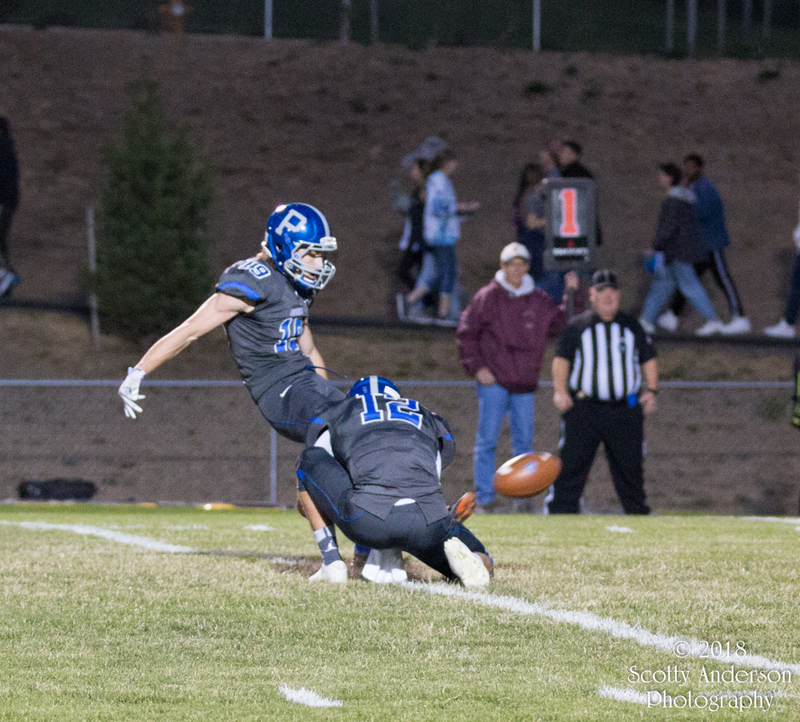 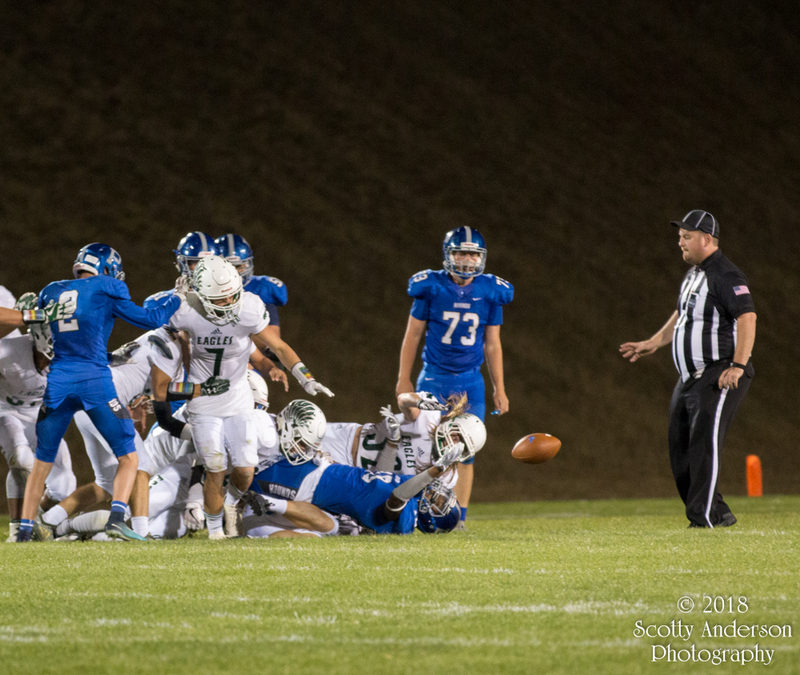 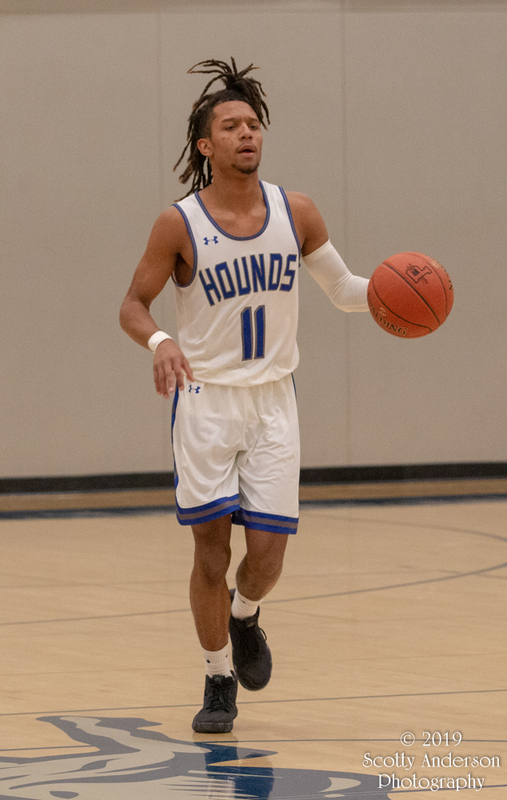 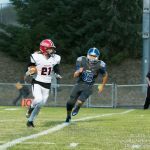 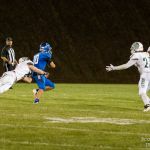 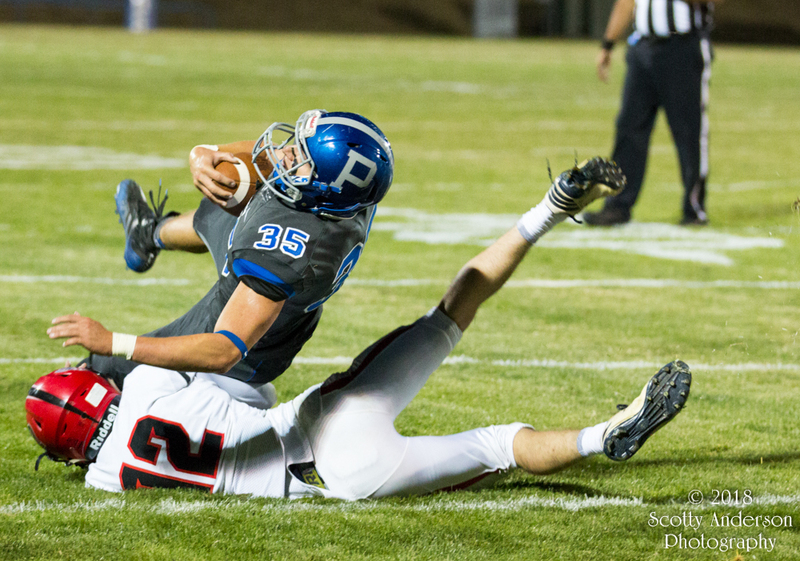 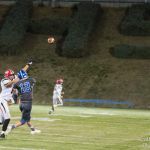 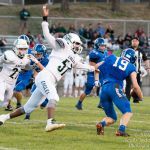 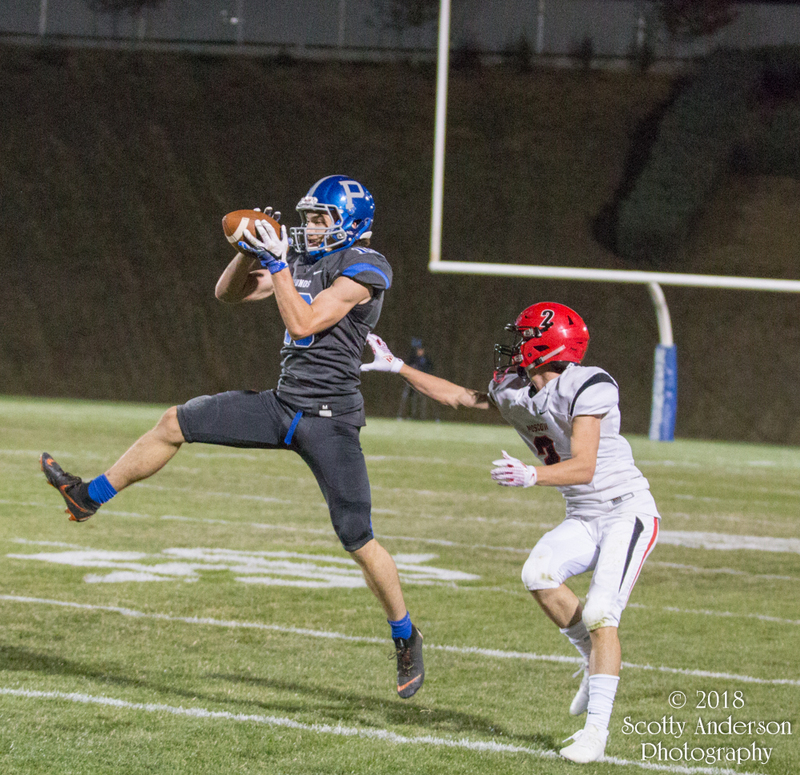 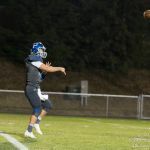 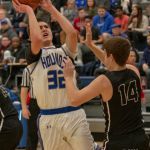 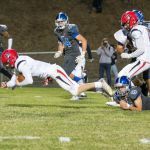 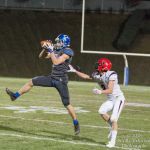 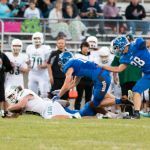 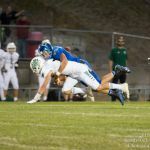 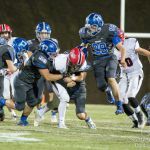 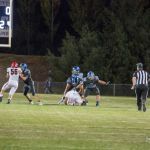 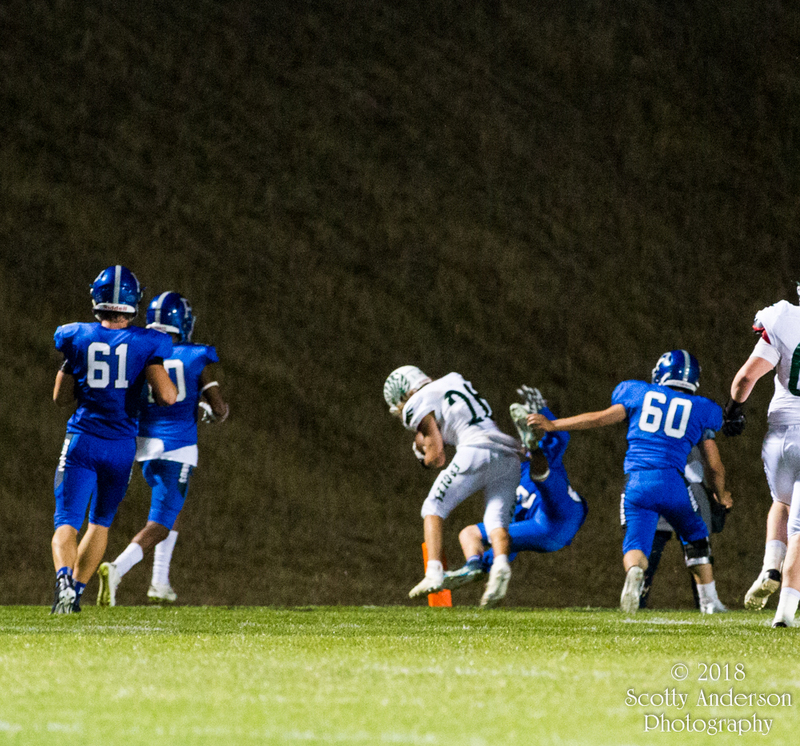 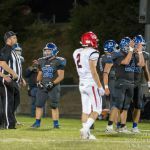 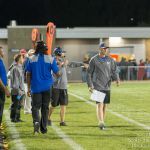 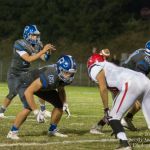 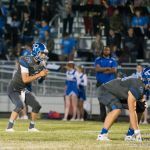 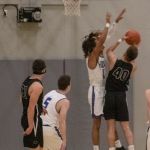 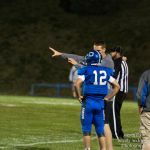 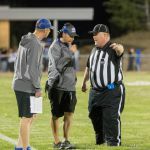 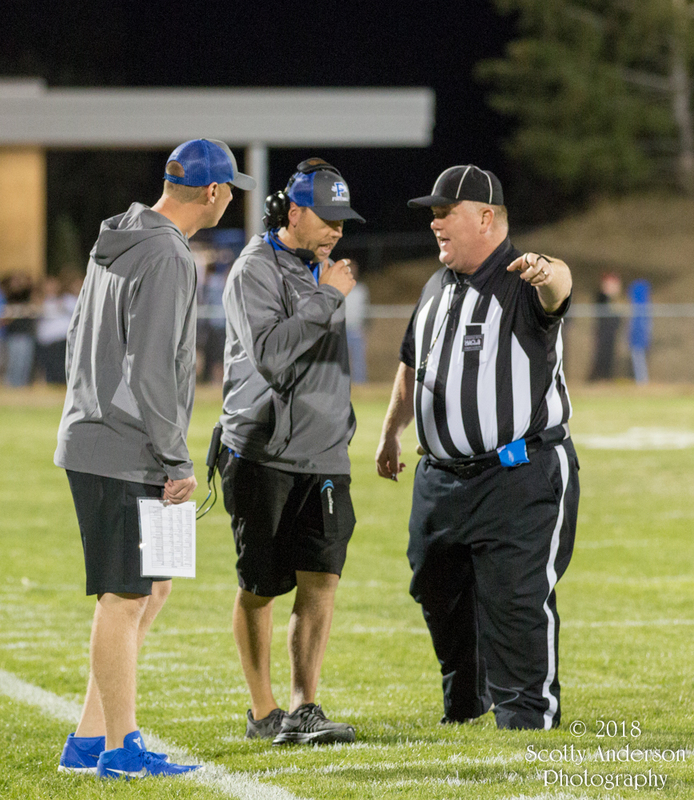 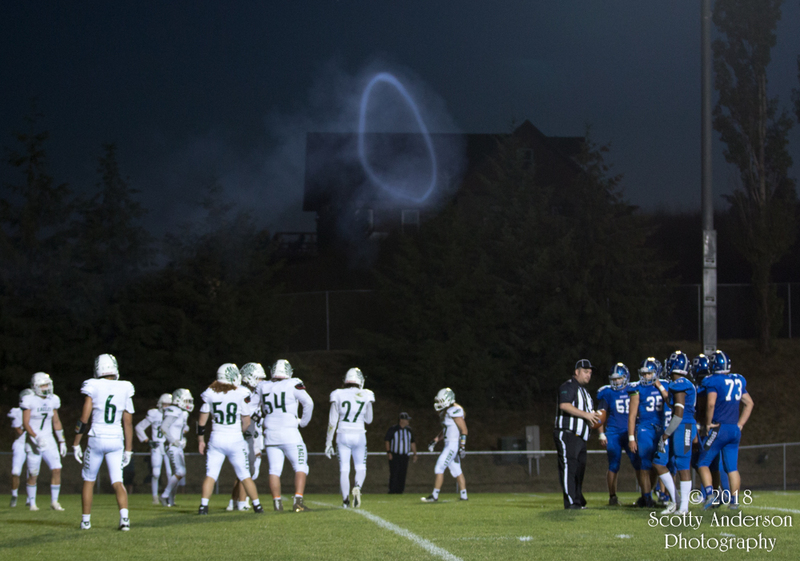 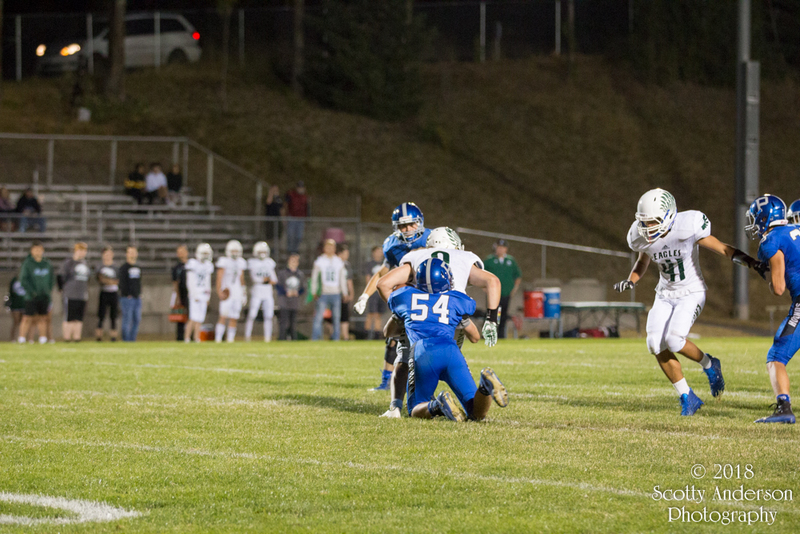 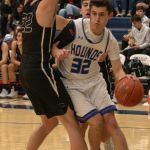 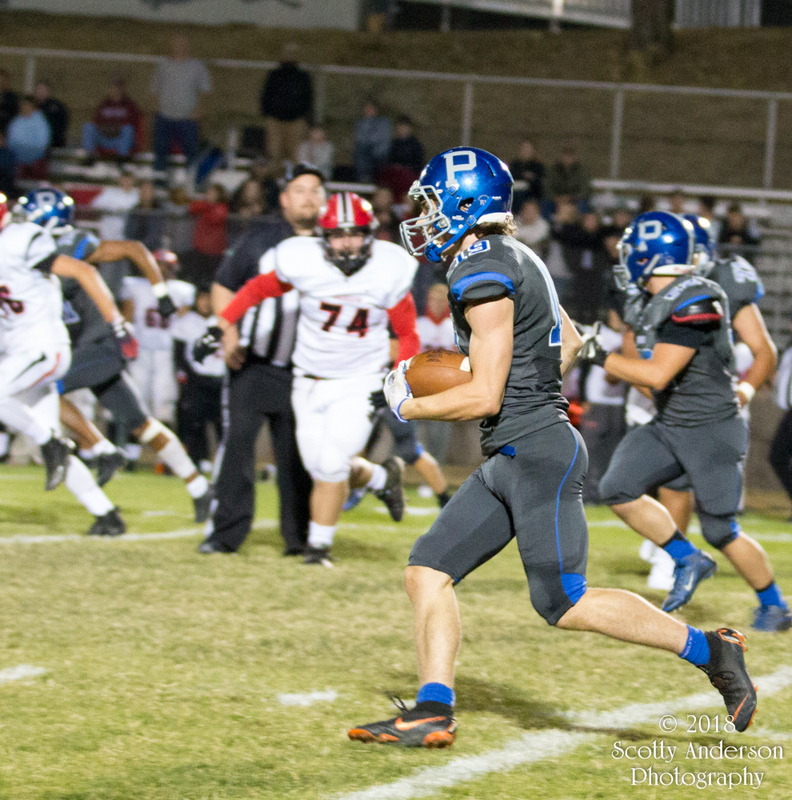 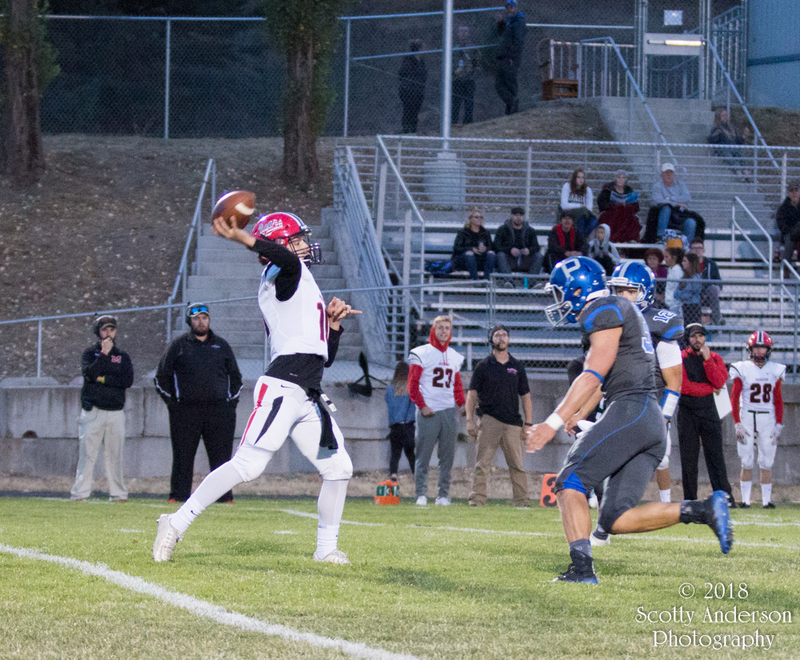 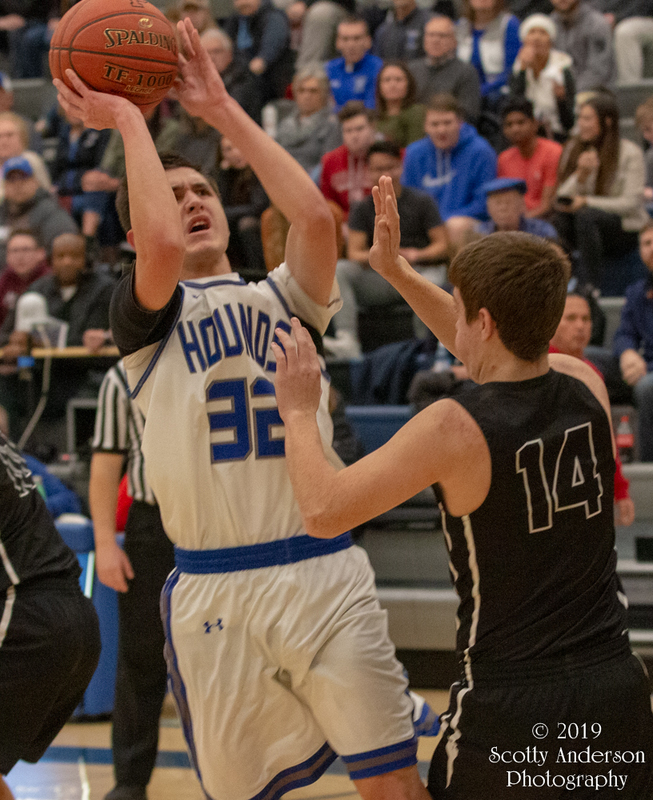 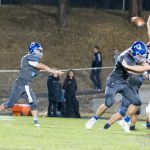 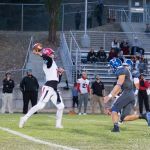 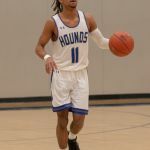 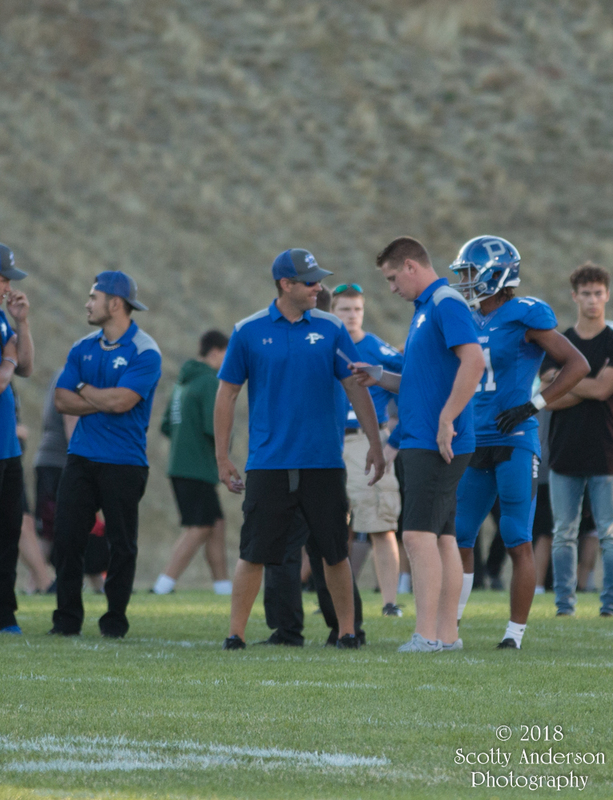 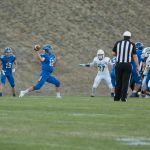 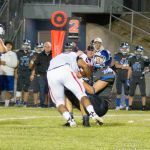 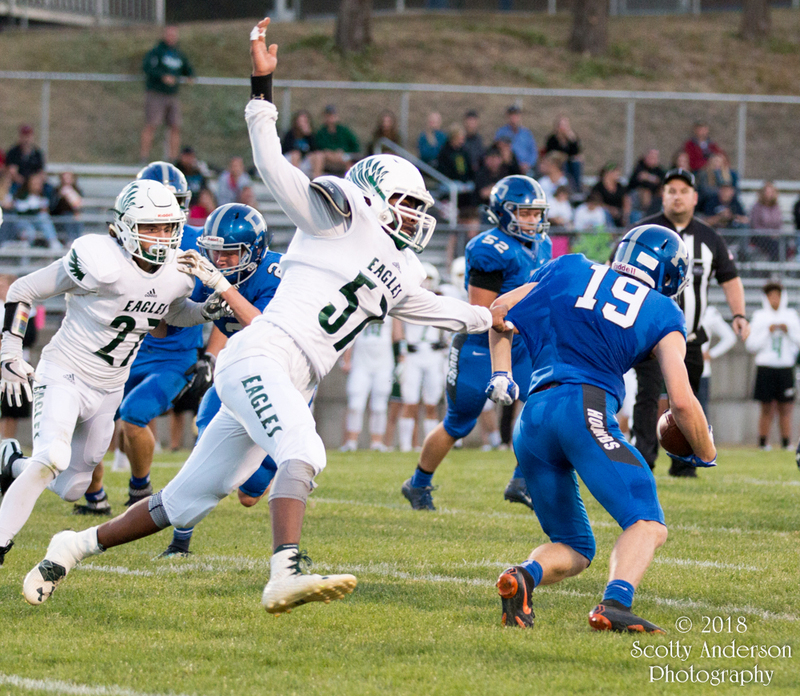 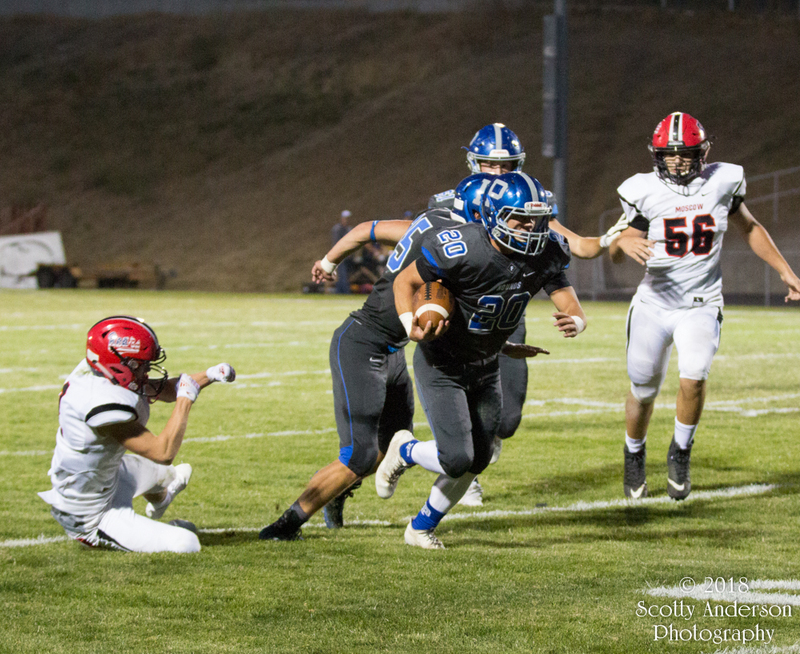 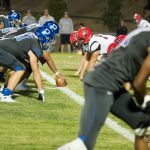 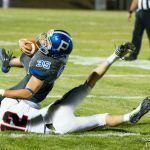 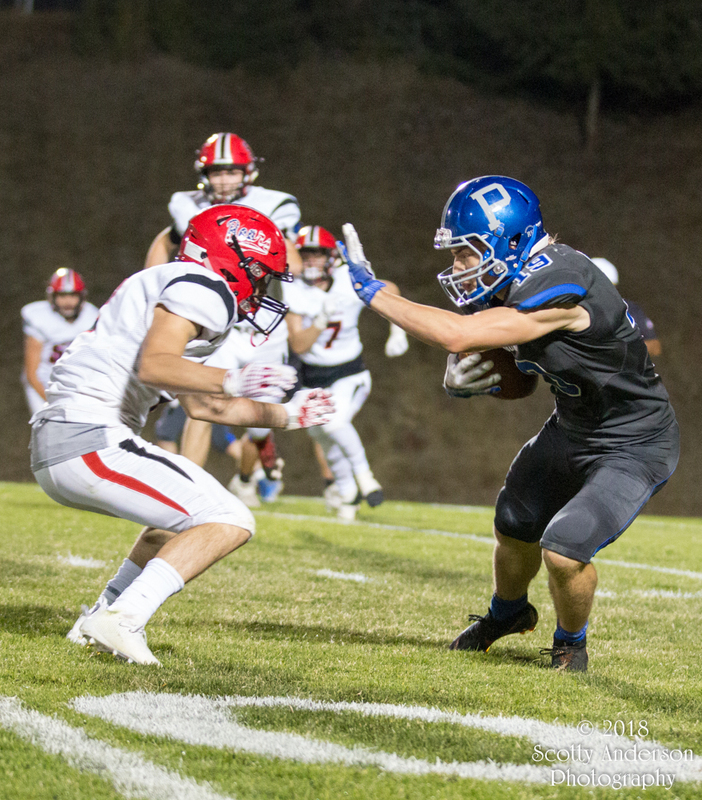 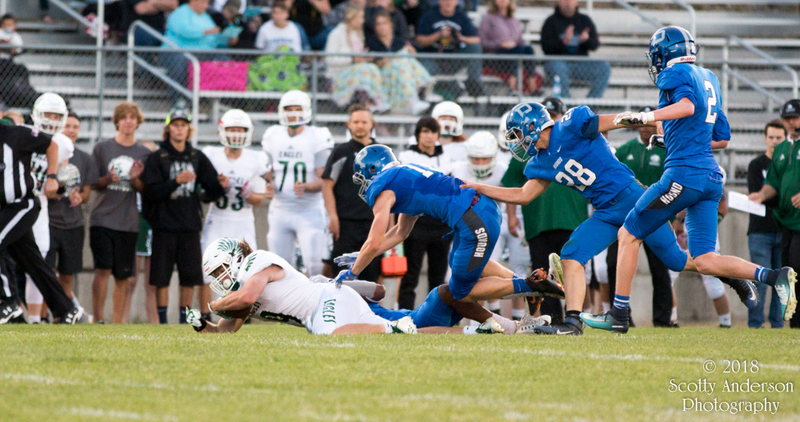 The final score was 41 – 23 in favor of the Pullman Greyhounds. 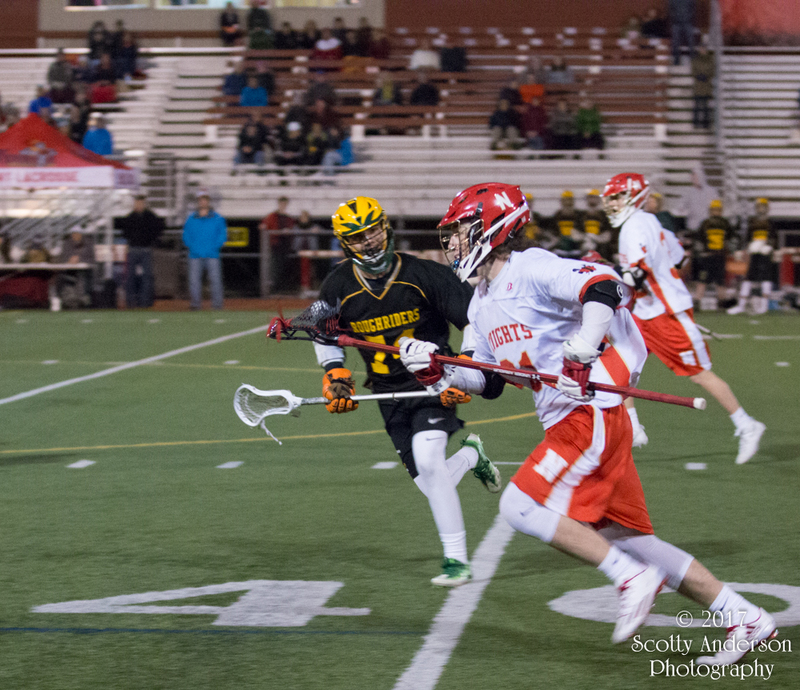 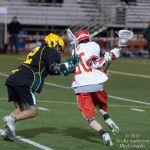 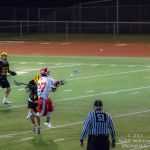 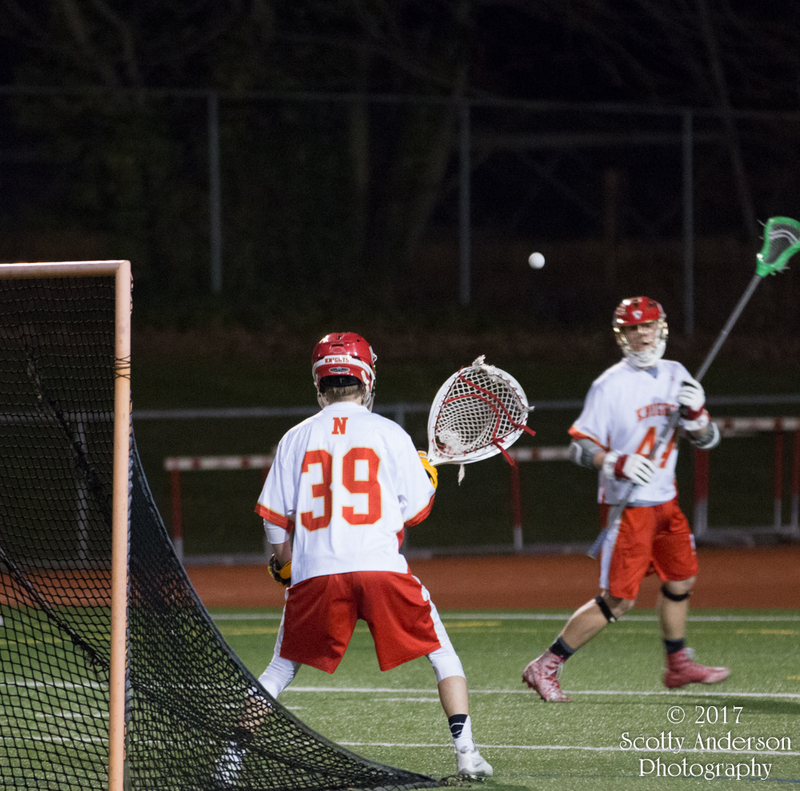 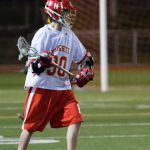 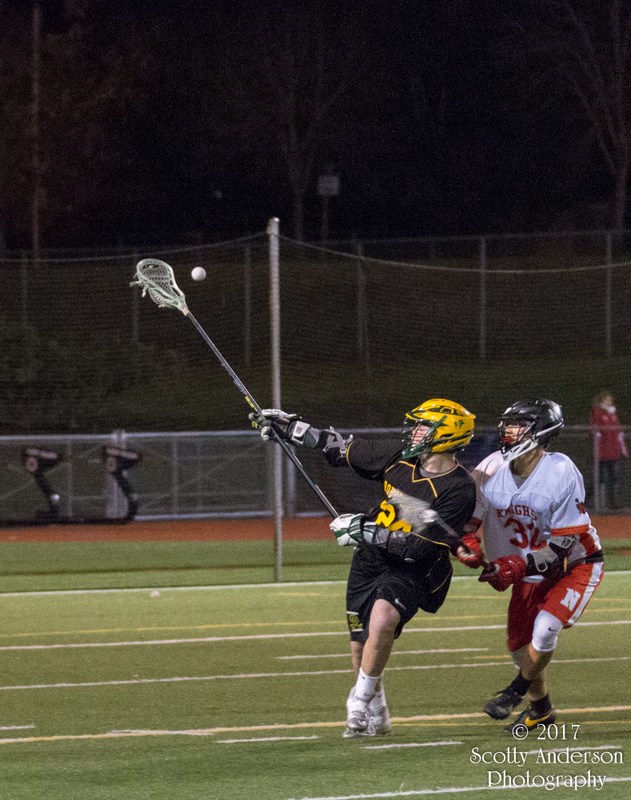 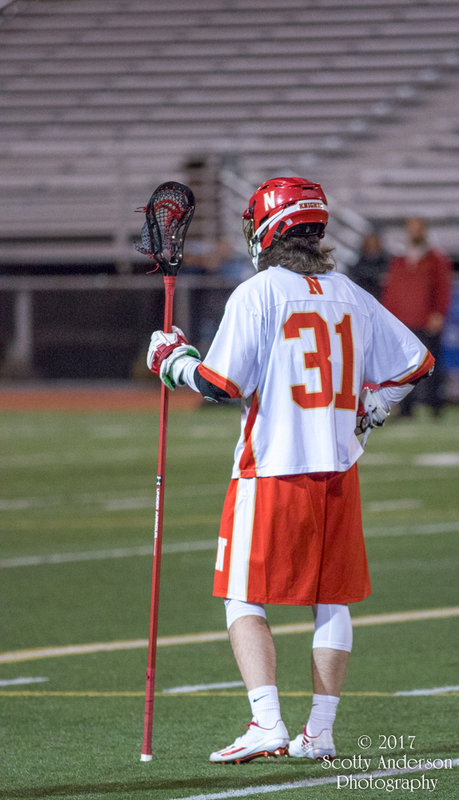 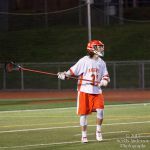 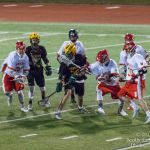 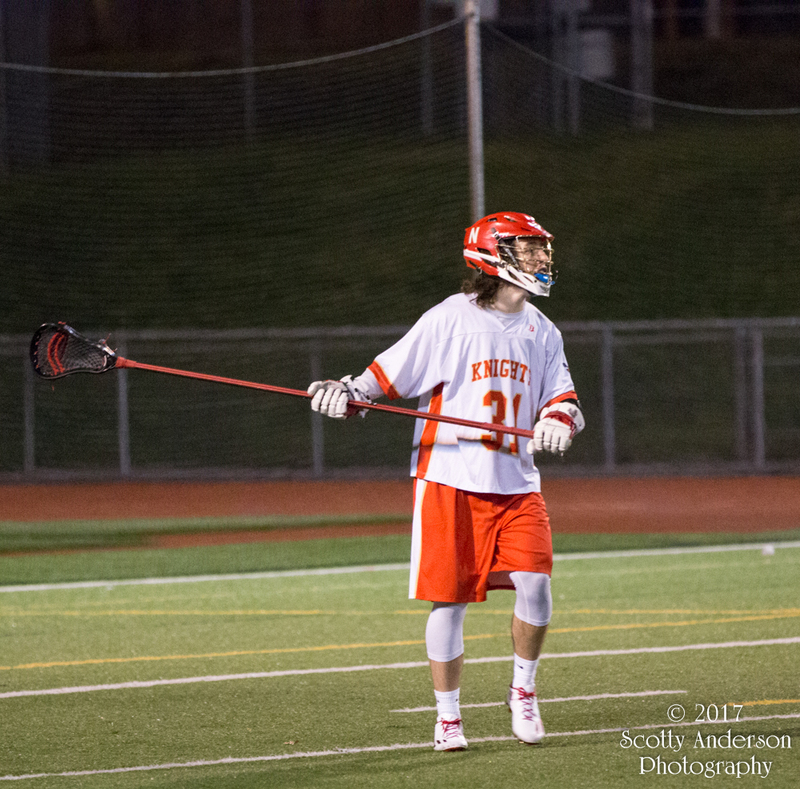 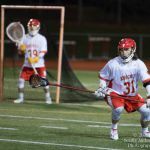 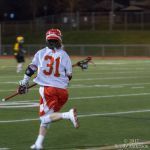 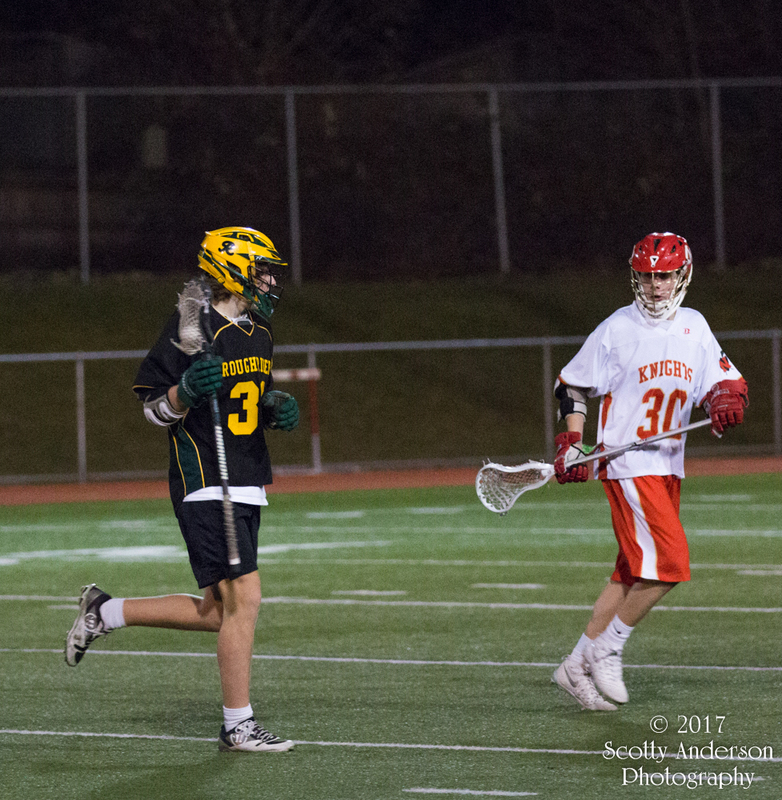 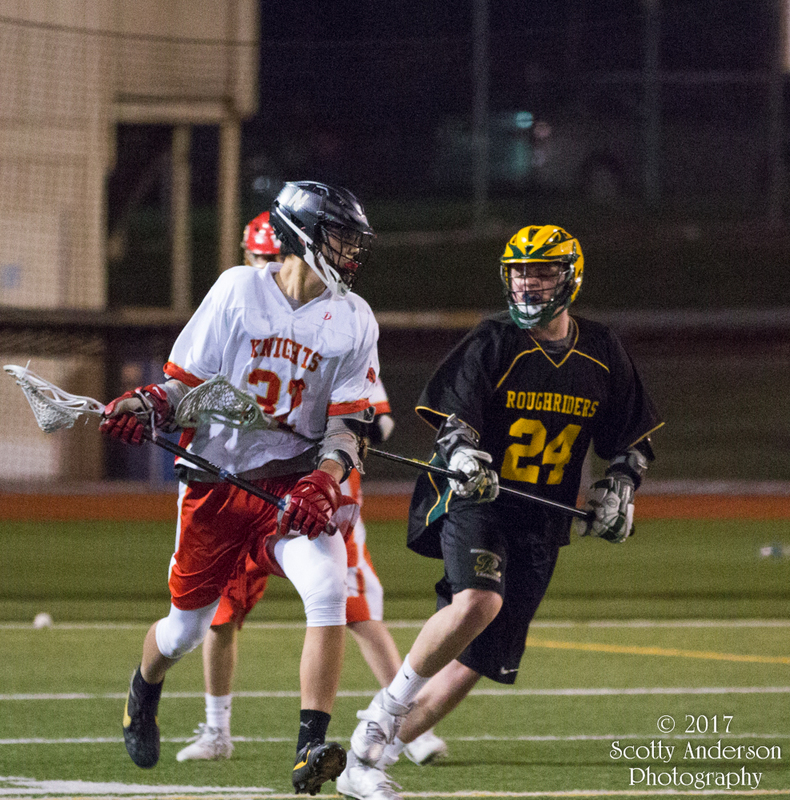 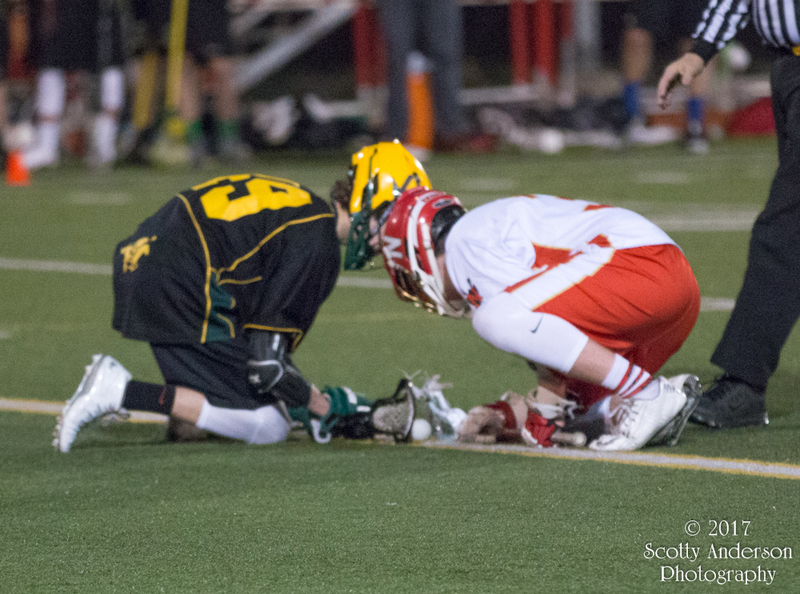 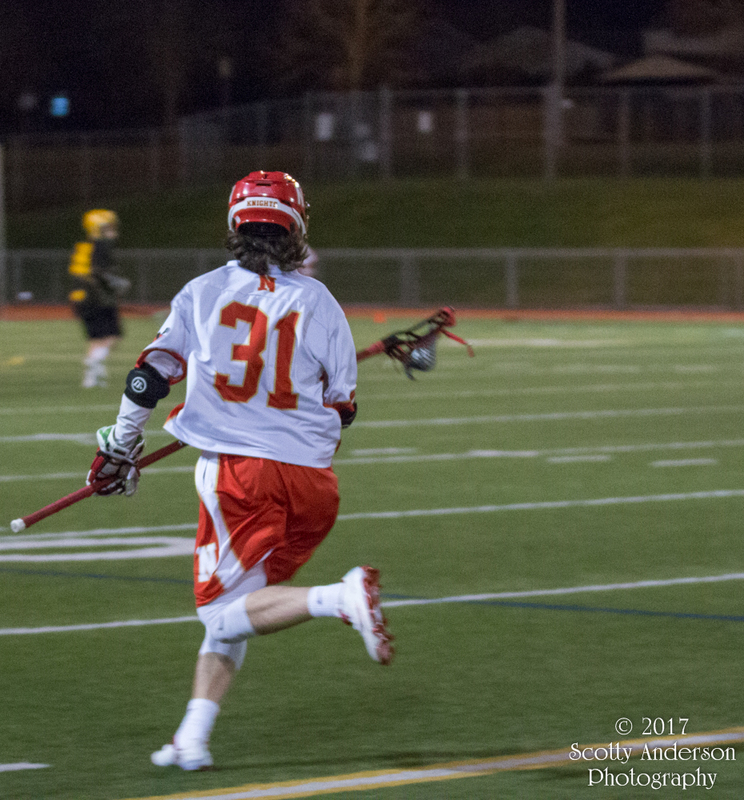 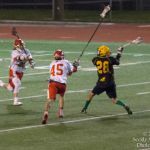 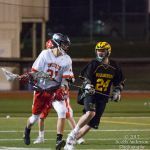 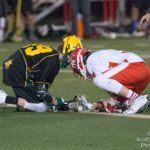 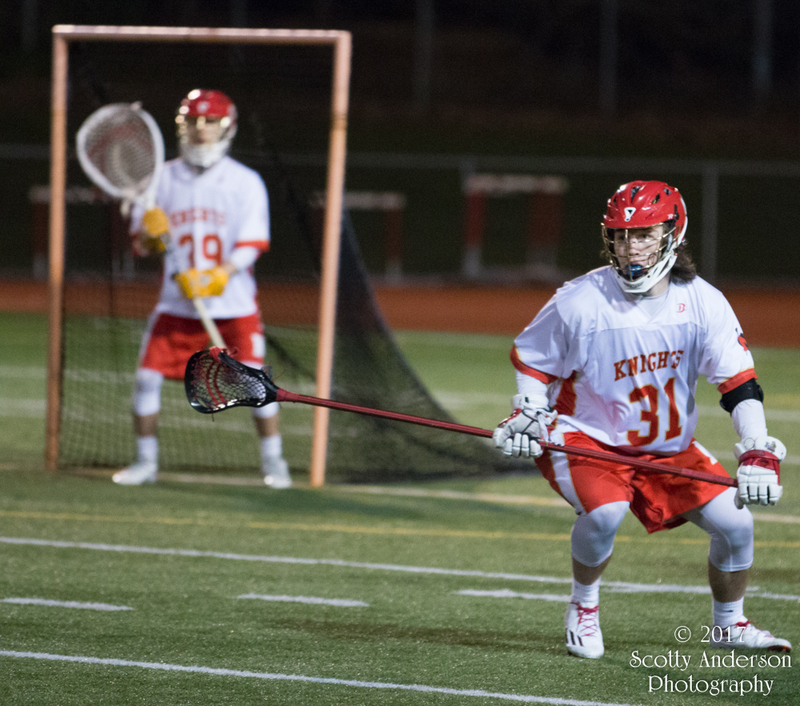 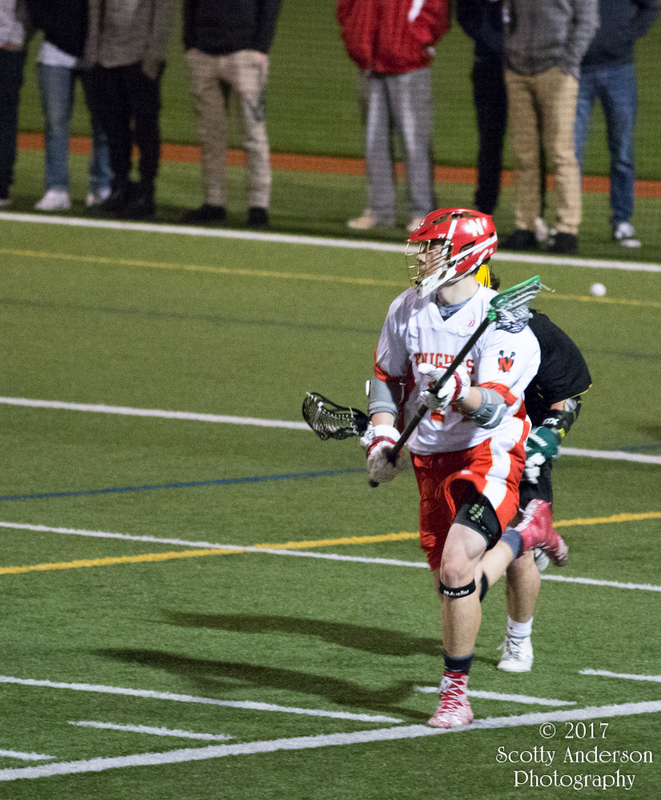 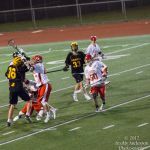 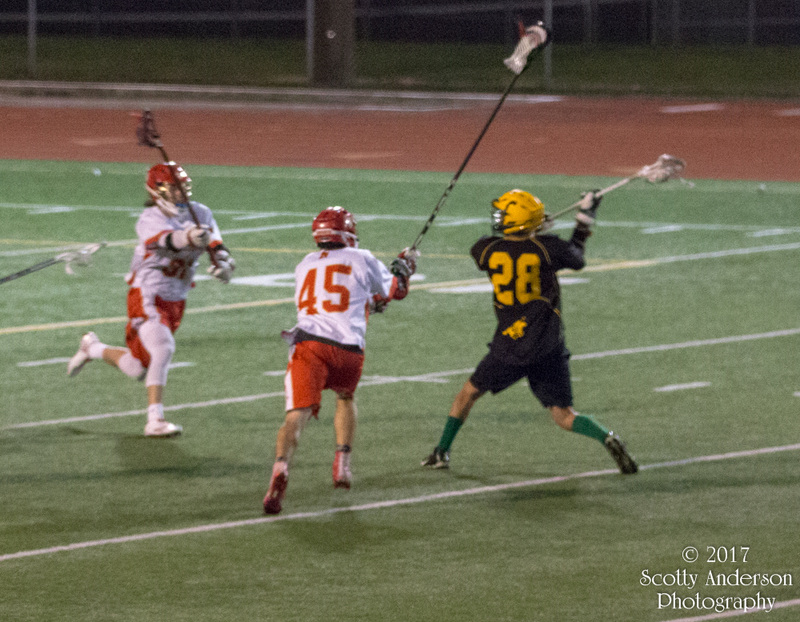 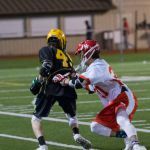 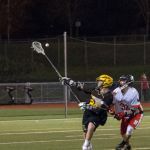 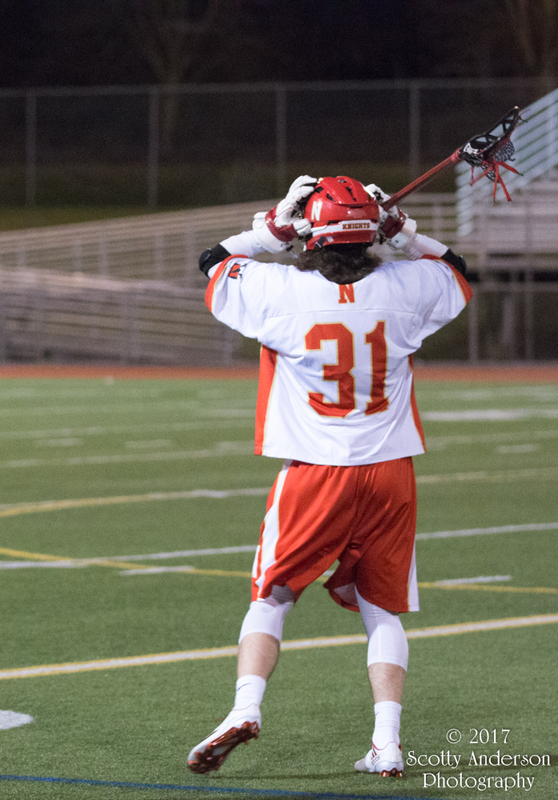 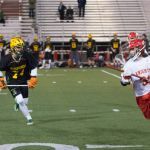 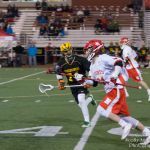 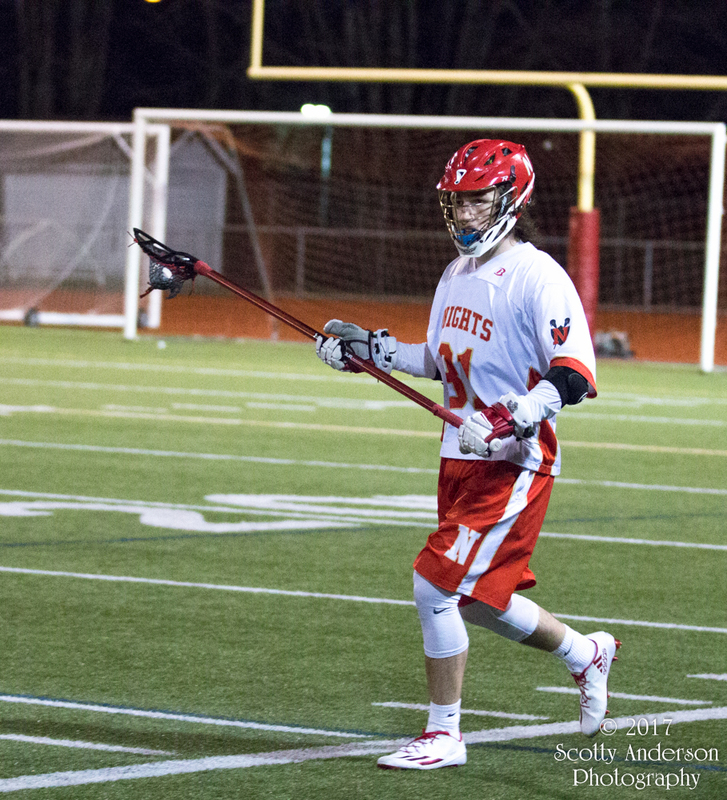 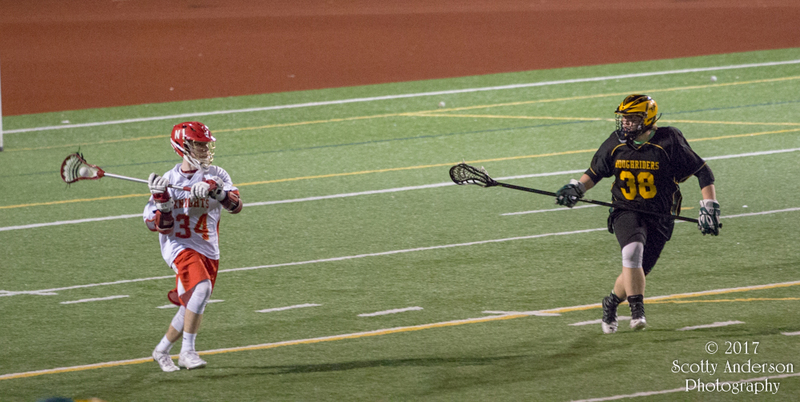 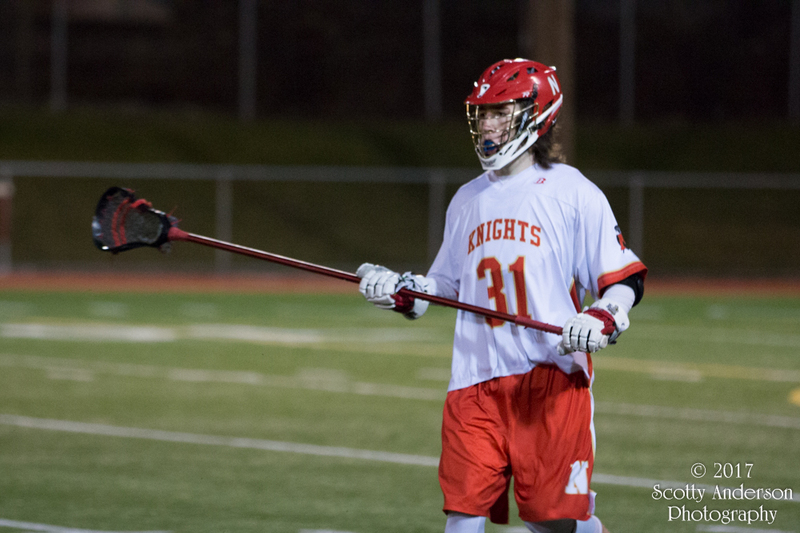 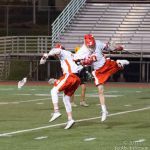 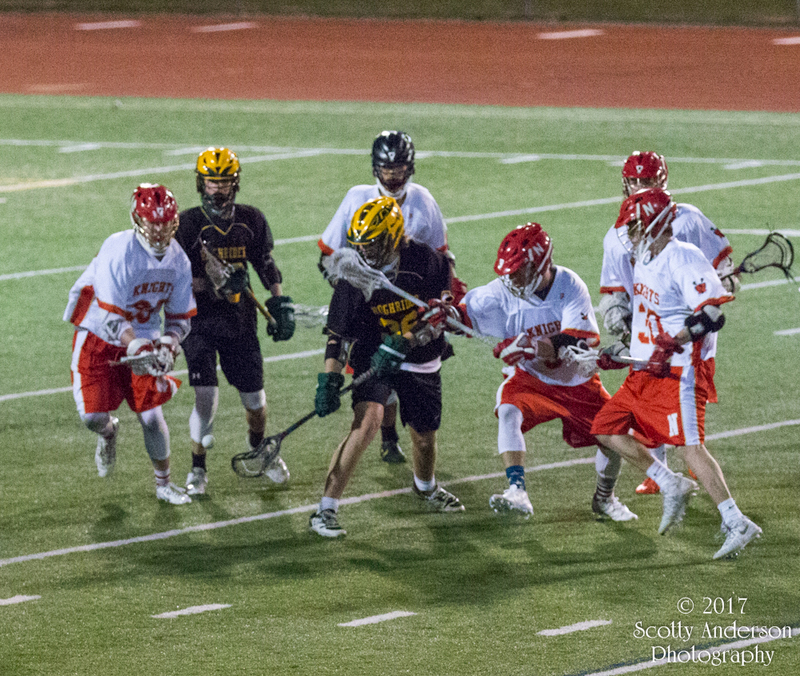 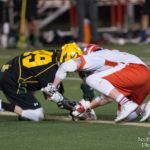 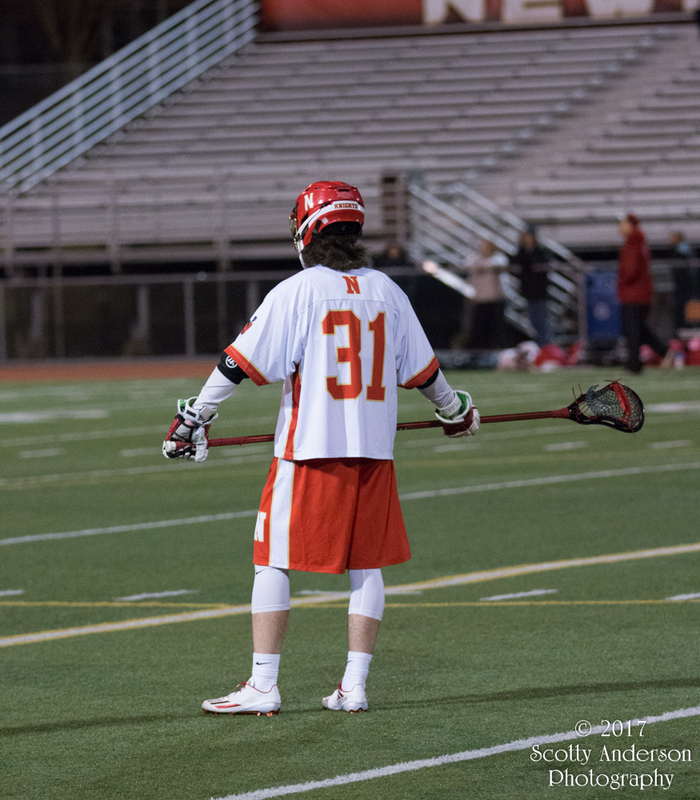 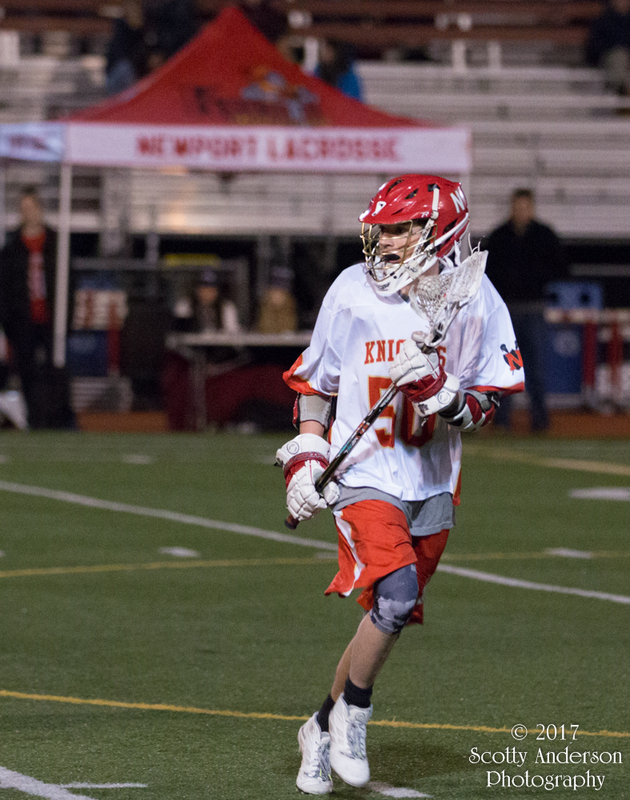 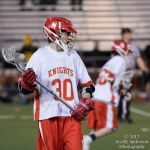 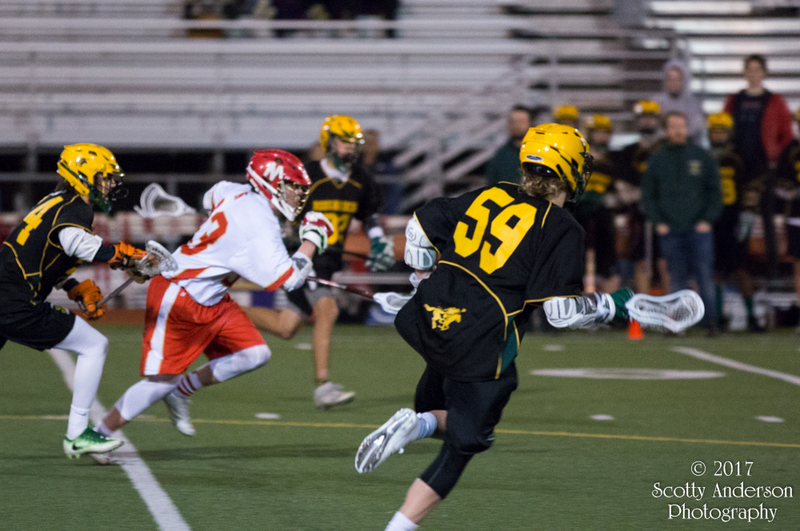 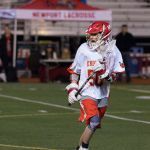 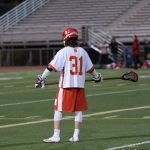 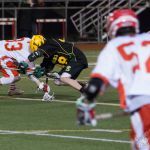 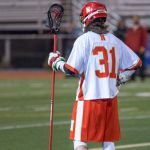 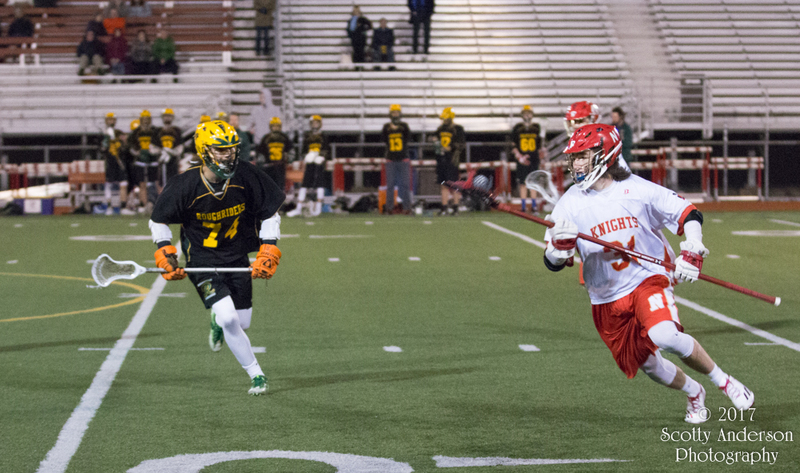 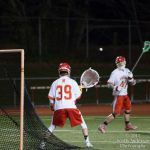 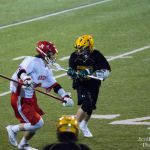 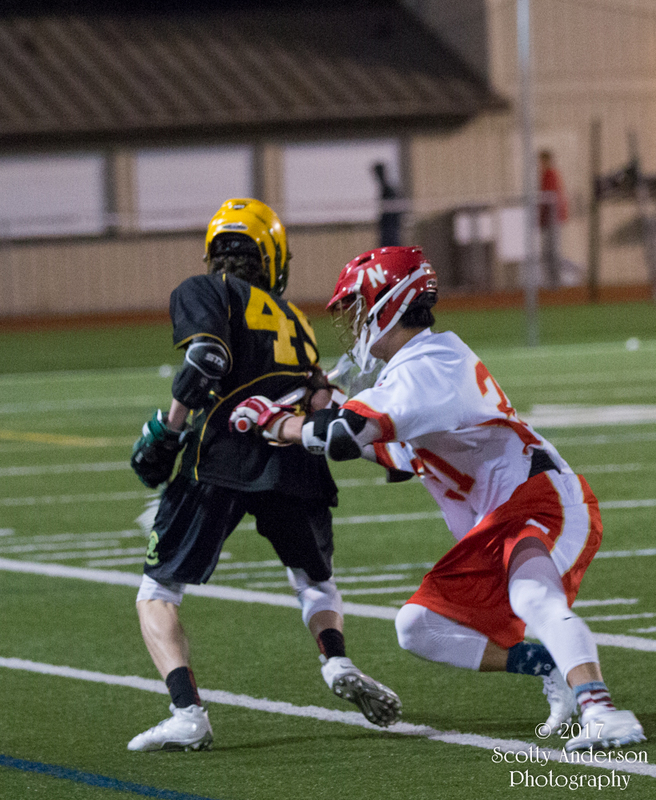 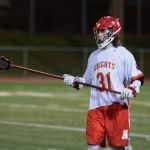 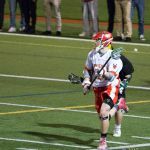 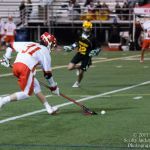 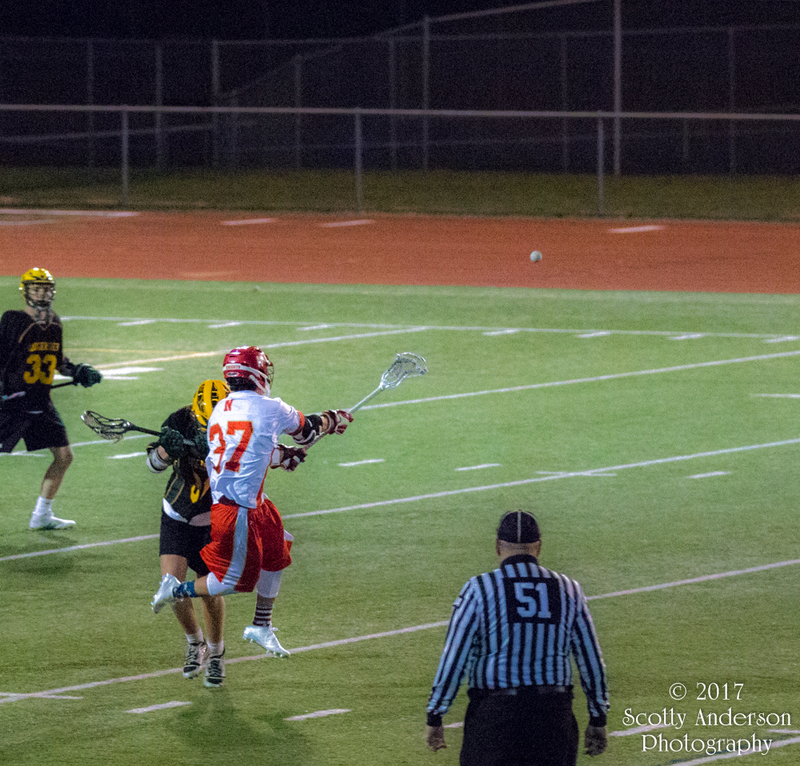 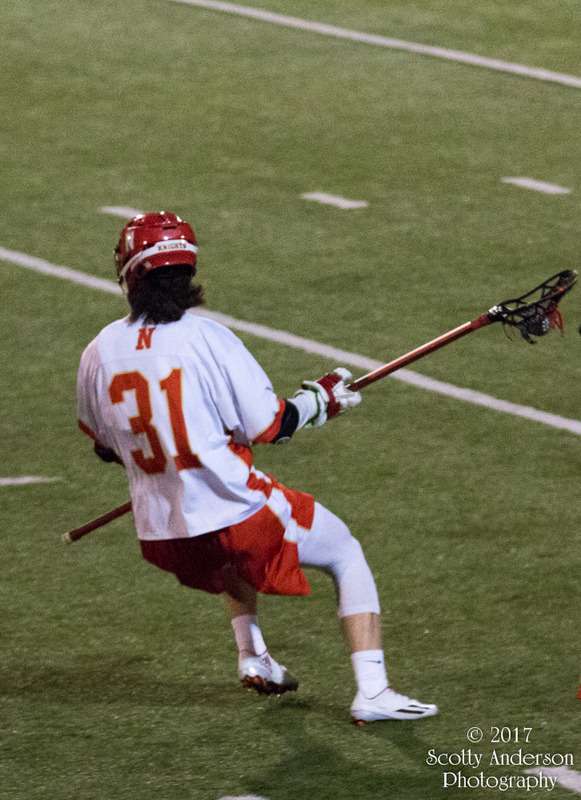 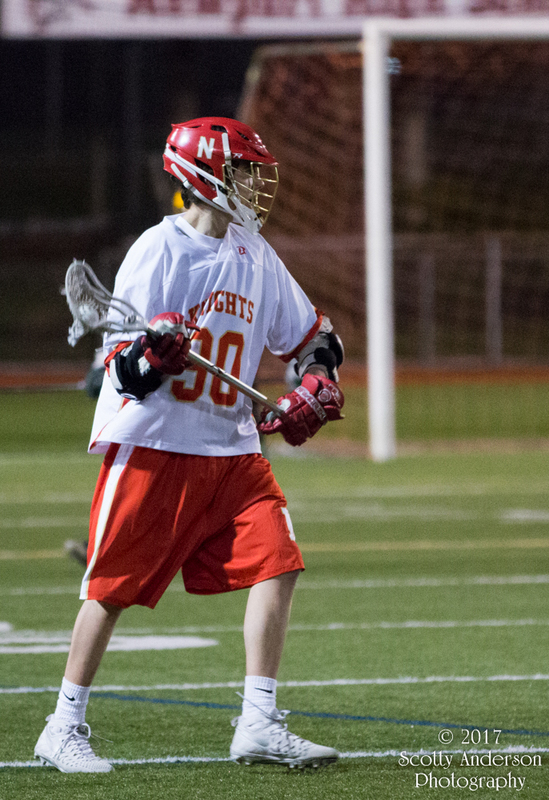 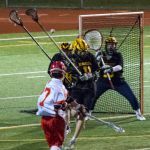 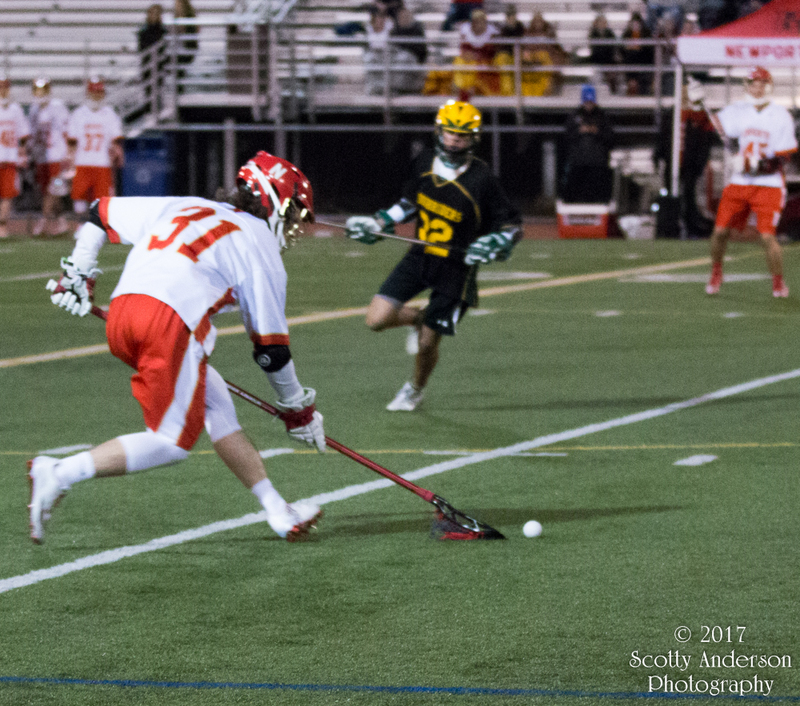 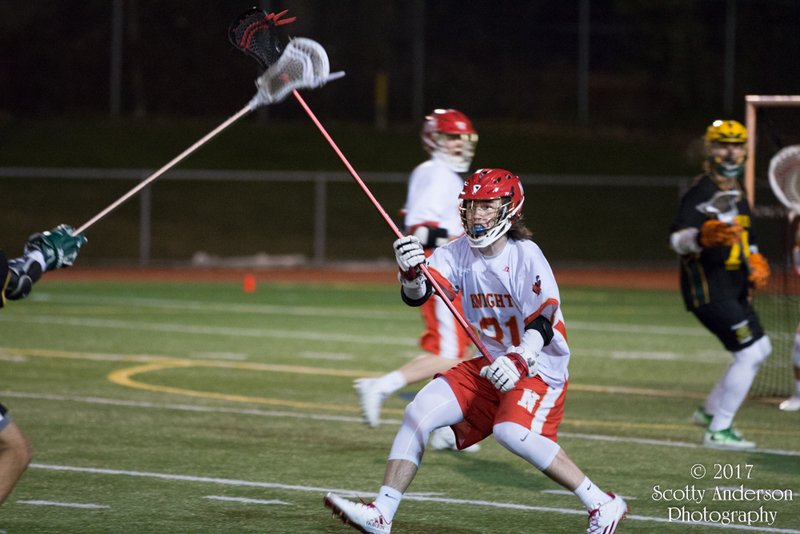 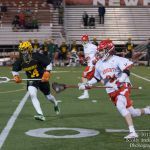 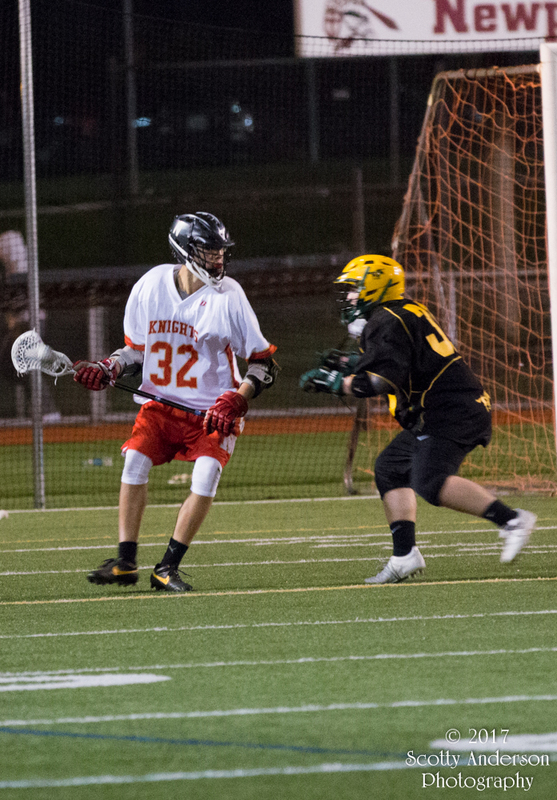 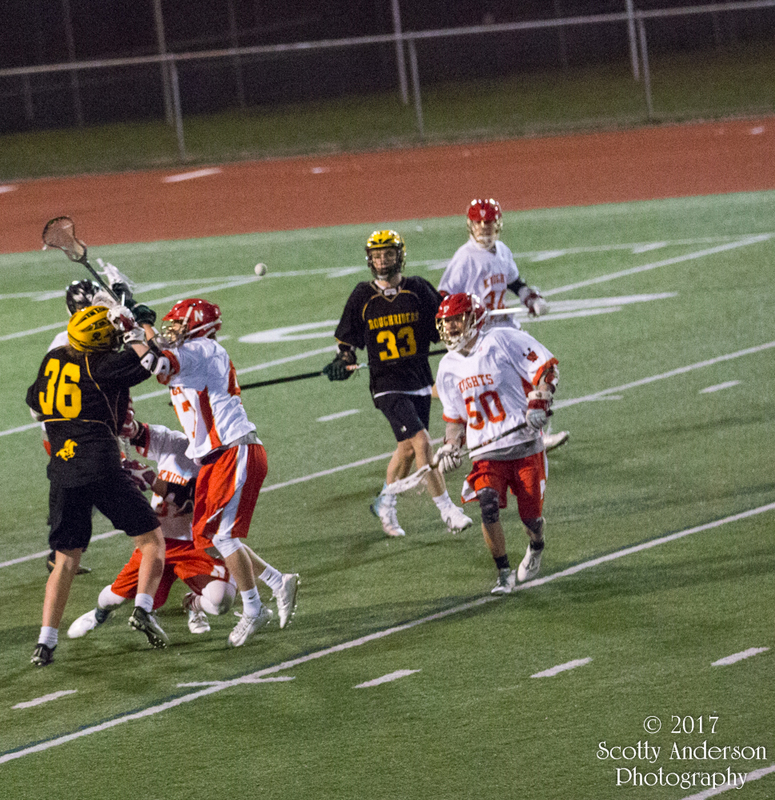 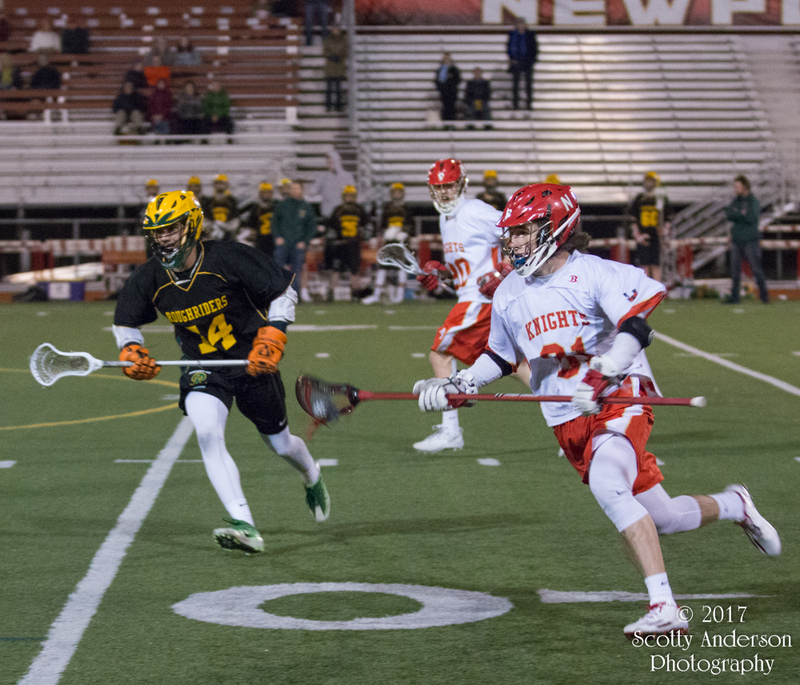 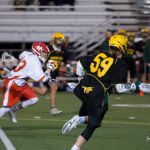 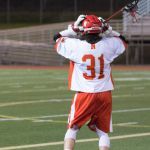 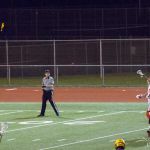 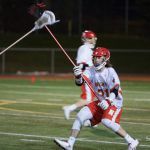 This evening I was in Bellevue and took some photos at the Newport Knights and Roosevelt Roughriders Lacrosse game. 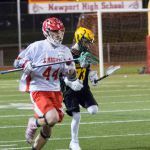 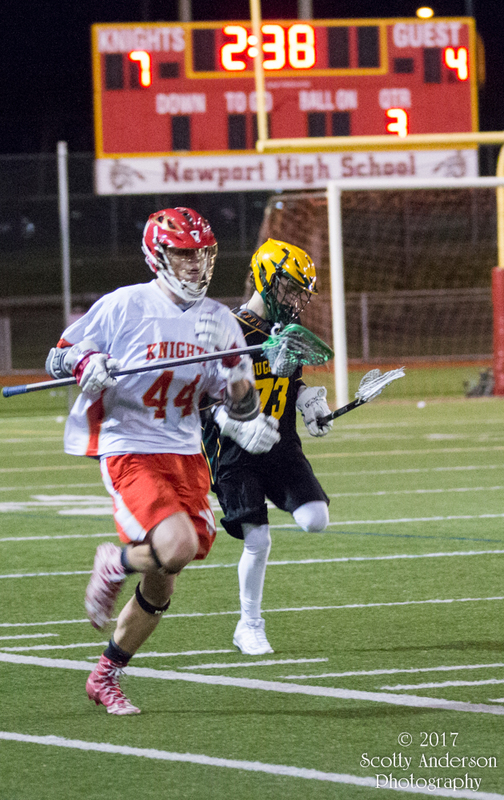 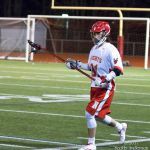 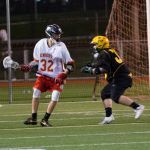 Newport had a lead of 5 to 2 at the half and ended up winning by a final score of 9 to 4. 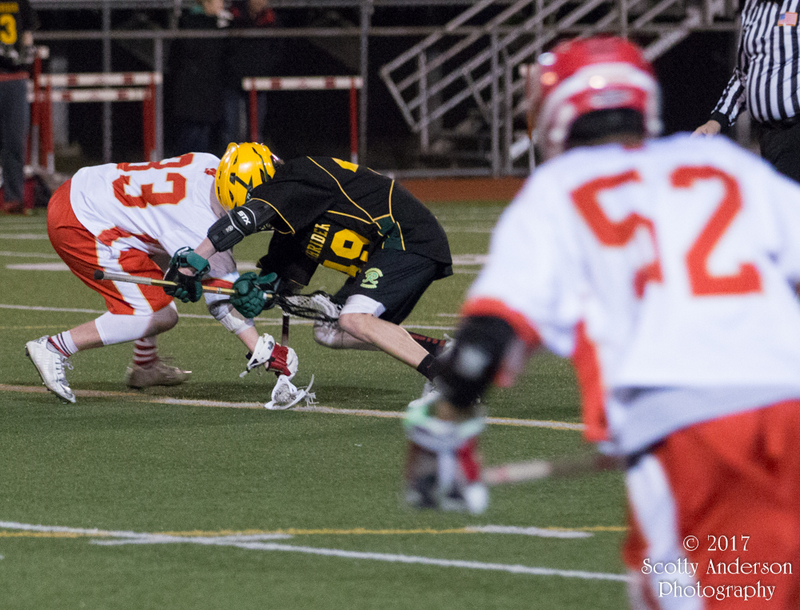 The photos from the first half were taken while sitting on the bleachers. 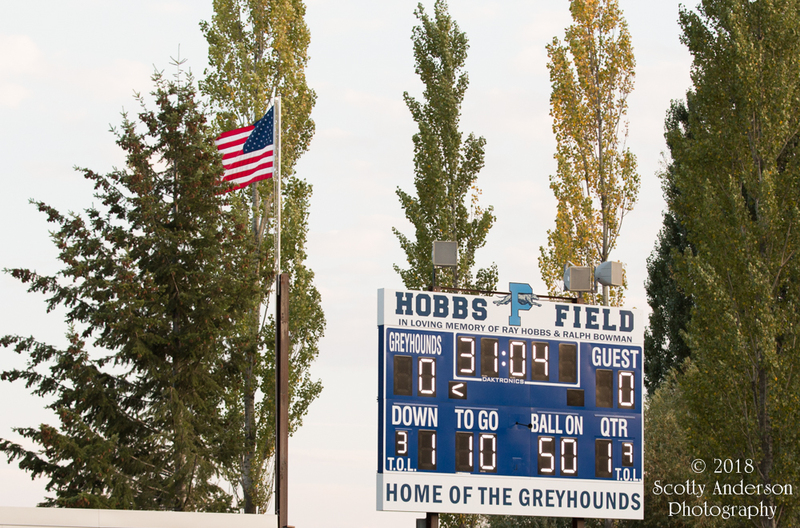 Then I went down to the track and next to the playing field. 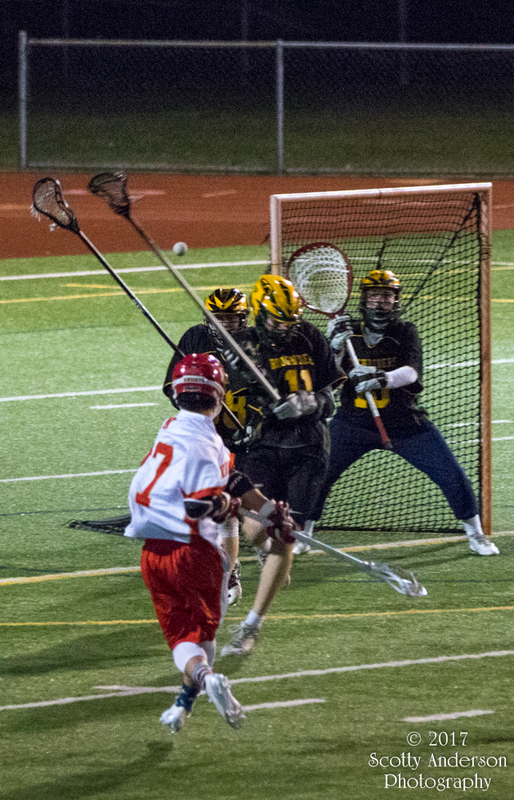 I got better closeup shots there, for obvious reason. 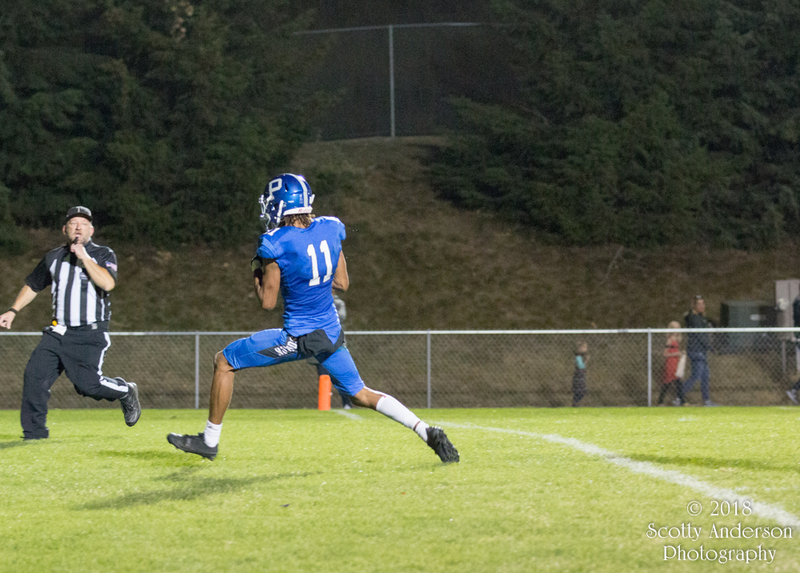 The whole shoot was done with my Canon 70D with my Canon EF 70-200mm f/2.8L IS II USM. 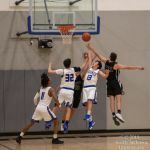 I don’t have a lot of descriptions included in the photos mainly because I did not have a roster so I did not know what names to place with the photos.